Pickled Okra. Big and little. Here in Central Texas, okra season is in full swing. Because the growing season here is so long, okra is essentially available from June through roughly October or until the first frost. Pickled okra is a great Texas, and throughout the southern US, food tradition. Every southern grandma seems to have a recipe. People either love or hate okra. The main complaint about okra is the “slime” factor. The slime is called “mucilage” (sounds gross, I know). It is the result of protein and carbohydrates in the okra pods and leaves. If you’ve ever had a thick gumbo, thank the mucilage. When the pods are cut and cooked with liquid, the okra tends to become slimy. The way to avoid this is to cook the okra whole; the best way to do this is over direct heat and pan roast (this is delicious, by the way). There is a subtle yet distinct difference between pickling and fermentation. 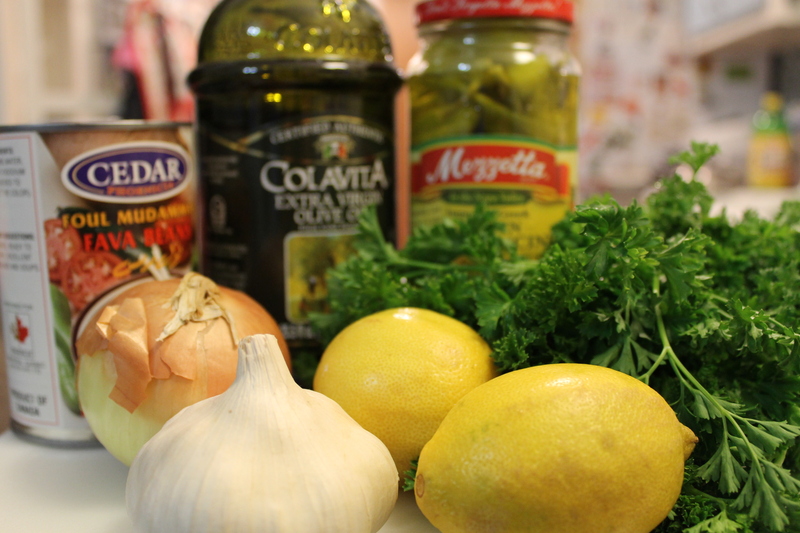 Pickling is the process of preserving food in a highly acidic medium (usually vinegar). Fermentation generally starts with salt as a starter and allows what is being fermented to create its own acidic liquid (lactic acid). Fermentation is generally considered the healthier of the two processes because the lactic acid helps with the digestive process. In short, pickling is controlled preservation while fermentation is controlled rot (but in a good way). The type of okra I use in the recipe is called Emerald King. It is more tender and less stringy than other types of okra. While you can use any type of okra you prefer or have access to, I’ve used this because it’s what Carol Ann grows at Boggy Creek Farm. 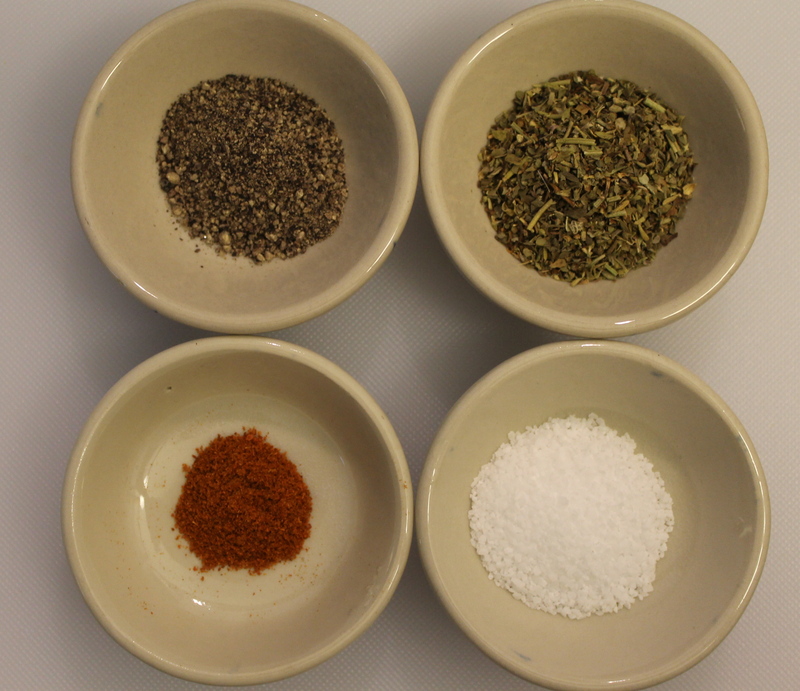 The reason pickling salt is used is to help draw moisture from the item being pickled. 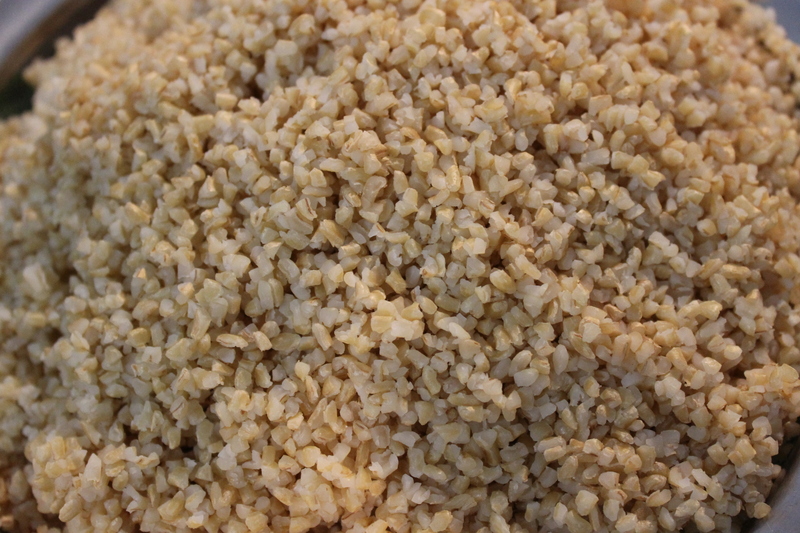 It is a very fine grain pure salt that contains no iodine or anti-caking additives. If needed, you can use kosher salt (but be sure it is pure). Because table salt contains additives, you shouldn’t use it in pickling or fermenting. Another way to help keep your pickles from becoming mushy over time (and they will as the initial heating as well as the acidic environment chemically cooking your pickles), you can use either fig or grape leaves. 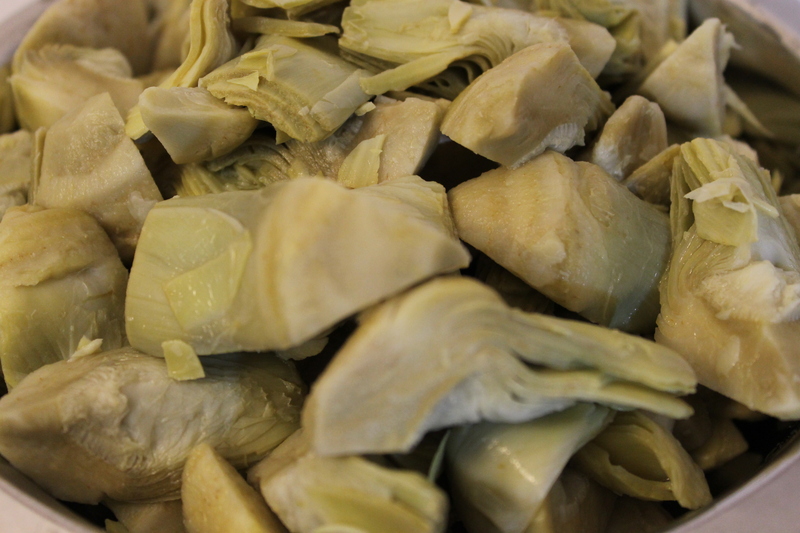 These leaves contain natural alum that help to draw moisture from the pickles. You can also use up to 1/4 teaspoon of alum per quart of liquid if fresh leaves are not available. You can also use half & half white/apple cider vinegar or all white vinegar if you prefer. Just be sure you use 5% acidity vinegar. There is 9% white vinegar available (mainly in Texas and parts of the South), but it is used mainly for cleaning, not food. Be sure to look at the label carefully. While I have included a pickling spice recipe, you can adjust this one to your taste or use whatever pickling spice blend you prefer. In a small bowl, mix the pickling spices together. Set aside. Meanwhile, make the brine. Combine the vinegar, water, and pickling salt in a medium saucepan and bring to a boil. Lower the heat to low and allow the brine to stay hot while you fill the jars. In a bottom of each jar, place 1-2 grape or fig leaves (depending on size), a lemon slice (if using), and 1 tablespoon of the pickling spice. Carefully pack the okra in the jars, alternating tips up or down so that the okra interlocks and you’re able to pack as much in as possible. 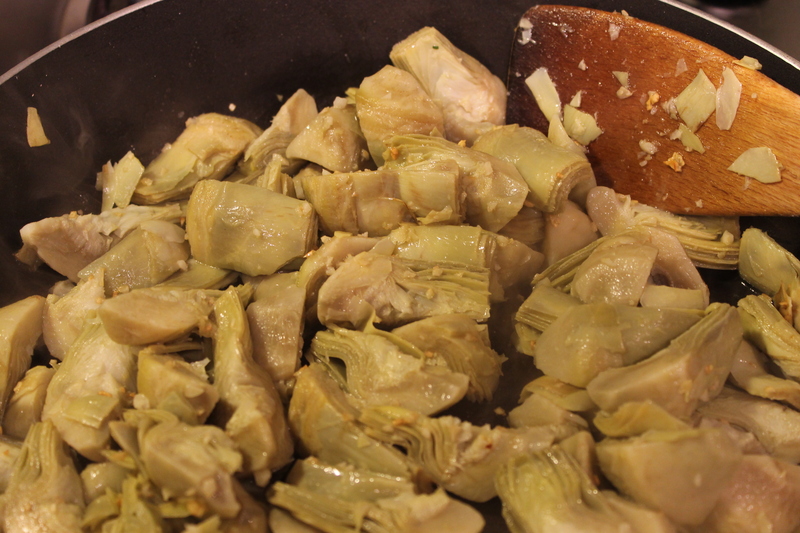 If you’re using garlic cloves, be sure to pack those in as you can in amongst the okra. Leaves, spice blend, and lemon in the jar. A few top up. You want to get as many in the jar as you can. It will save on brine and help limit air bubbles. Air, in this case, is the enemy. Plus, more goodness in the jar. I swear there are garlic cloves in there somewhere. Slowly and carefully pour in the hot brine in each jar, leaving 1/2-inch head space. Use a wooden or plastic chopstick or the end of your headspace tool to remove any air bubbles. Once you have done that, measure the headspace again and add more brine if necessary. Wipe the rims of the jars, place the lids on top, and screw on the rings so they’re hand-tight. 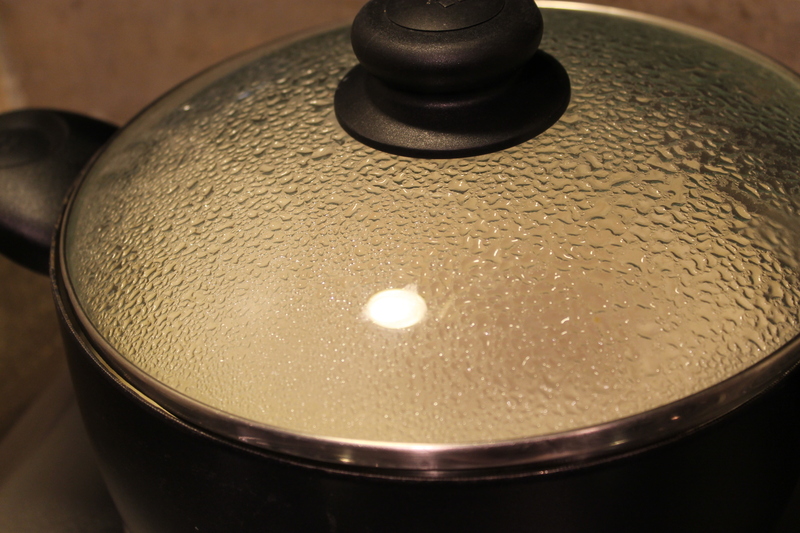 Carefully place the jars back into the canning pot, making sure the water is at least 1″ above the tops of the jars, cover the pot, and bring the water to a boil. Process the jars for 10 minutes starting when the water comes to a boil. After you have processed the jars, carefully remove them from the water and place on racks to cool. If the jars seal (you will hear a “pop” as the lids seal), tighten the rings. If the jar doesn’t seal, you can simply put the jar in the fridge and eat it within 2-3 weeks. Either way, let the pickles sit for at least a week before eating. 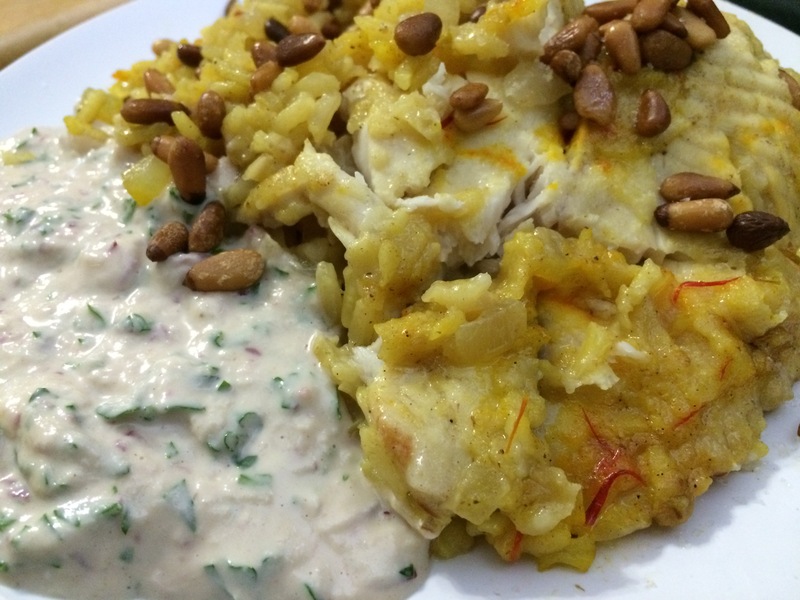 Sayadieh (الصيادية), or Fish with Rice, was a staple meal for my sisters & me as we were growing up. It’s a wonderful and simple amalgam of white fish, rice, onion, saffron, and lemon that we would eat until we were in food coma. Two of my aunts ( عمـاتـي), Ahlam and Layla, considered to be the best cooks in the family, make sublime Sayadieh. However, the best I have ever eaten is from my mom. I still don’t know what she does, but Mom’s Sayadieh is, and I’m not exaggerating, ethereal. I’m not sure what the origin of this dish is, but it does figure prominently in Lebanese cuisine. Like any other regional dish, it has its variations – with caramelized onions, with a spice blend (or, specific individual spices), pine nuts, almonds, lemon… The list goes on. 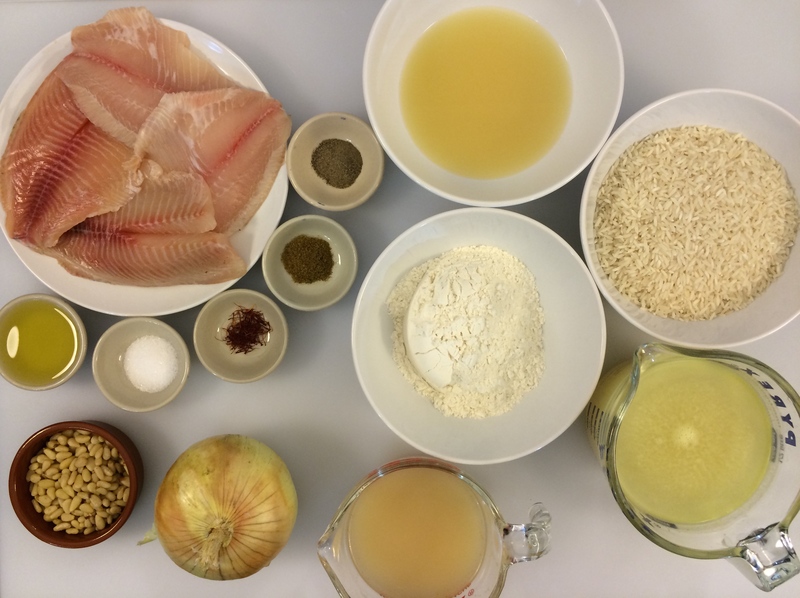 The two must-have ingredients, however, are, of course, fish and rice. The fish is always a firm-fleshed white fish (i.e. 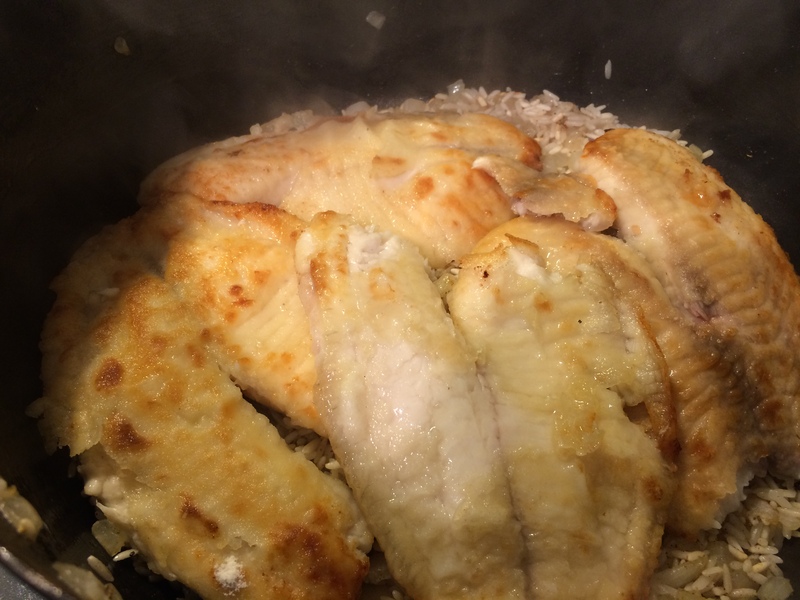 tilapia, haddock, cod) and the rice is always long-grain white. Some recipes have the fish cooked separately from the rice while others have them cooked together. This is very close to the recipe I grew up with. The fish is marinated in lemon, lightly breaded, browned, and then cooked with the rice. 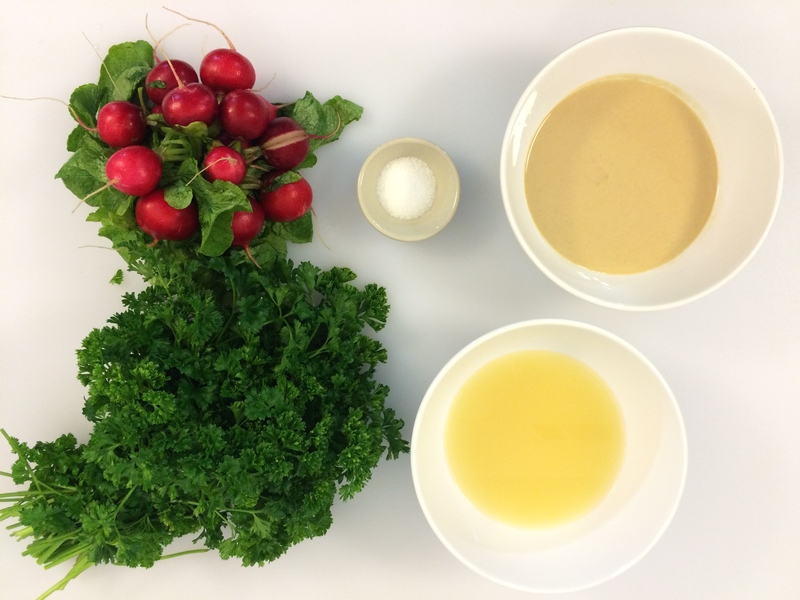 The dish is usually served with a tahineh-radish sauce (recipe follows). 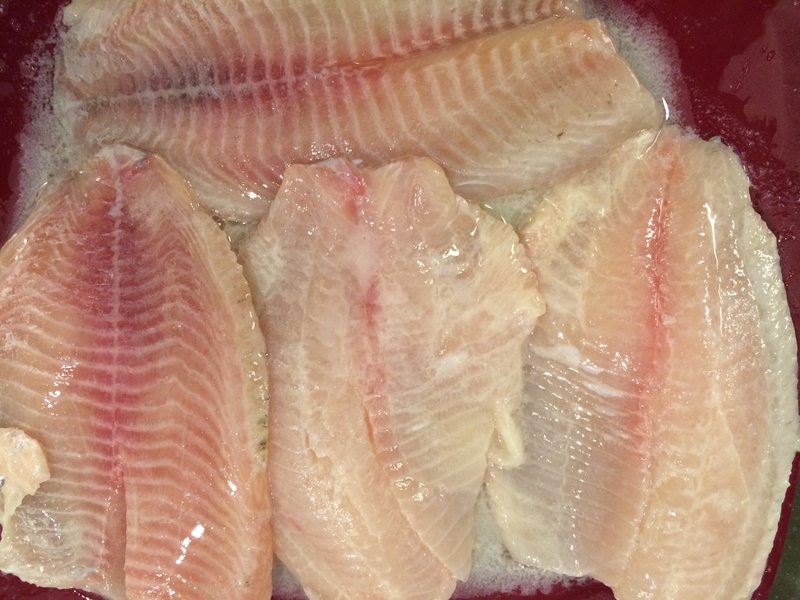 On a large plate or in a large bowl, carefully toss the fish with the lemon juice and a good pinch of salt. Let the fish marinate for at least 1/2 hour, tossing if needed to make sure the pieces are evenly marinating. Marinating the fish. My personal preference is for Tilapia. Not pretty, but it tastes good, it’s cheap, and it works. Heating up the saffron with the liquid helps to release its flavor and color. 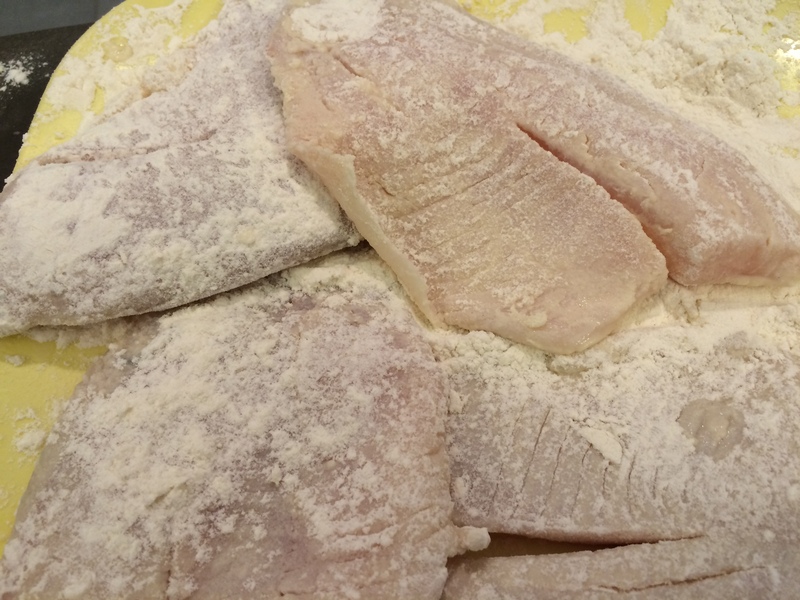 Remove the fish from the lemon juice and lightly dredge it in the flour, carefully shaking off any excess. Save the lemon juice. Don’t have too heavy a coating if flour on the fish. I did shake these off a little more. 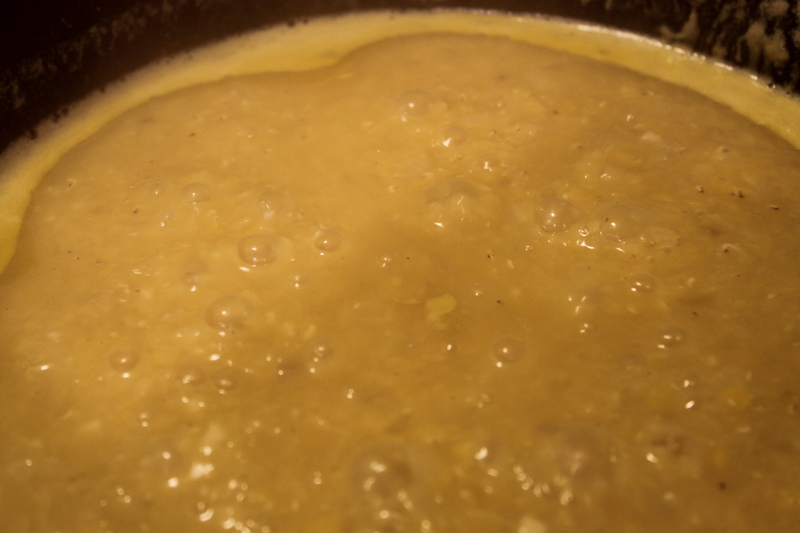 In a large saucepan, heat 2 tablespoons of the oil over medium heat. Once the oil is hot, place the fish in the oil and let brown. (You may need to do this in batches.) 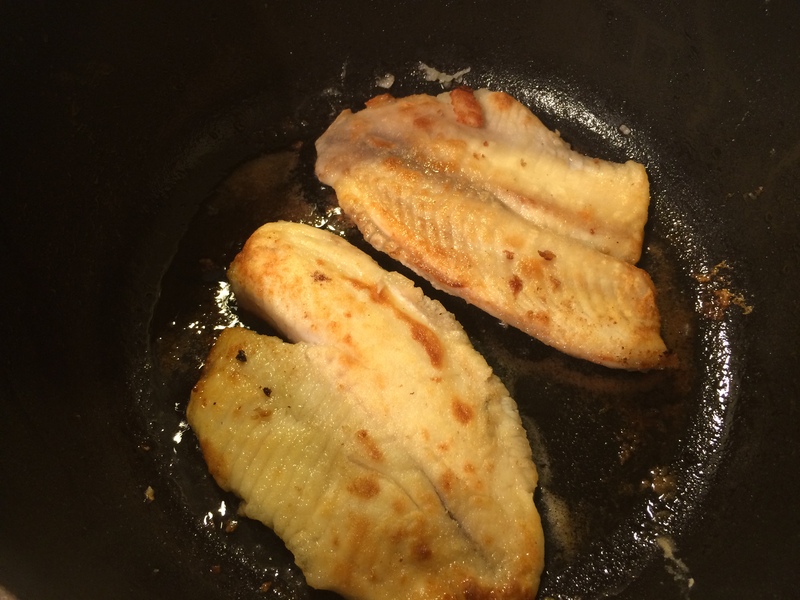 You don’t need to let the fish cook all the way through, just enough for the flour to brown. Take care not to try to turn the fish too soon or the coating will stick to the bottom; the fish will let you know when it’s ready to turn. Browning the fish. The flour coating helps to hold the fish together during cooking. If there is any burned flour, take the saucepan off the heat and carefully wipe it out with a thick layer of paper towels. 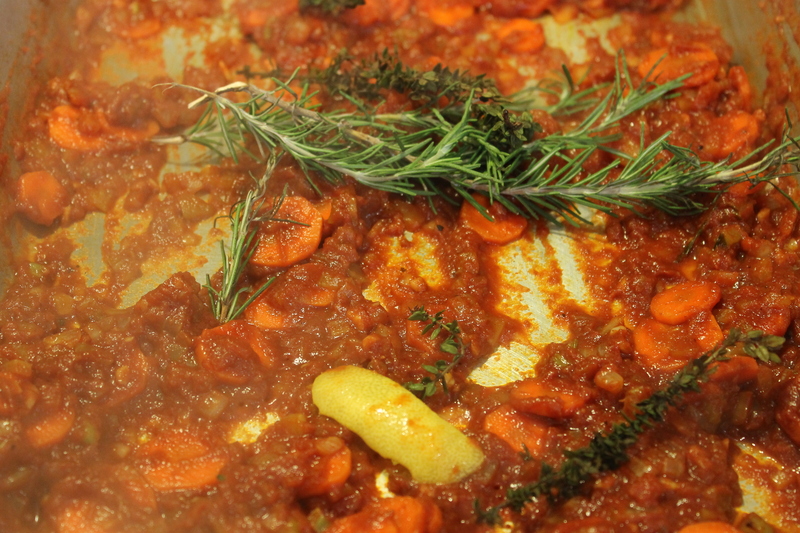 When each batch of fish is done, take it out of the saucepan and set aside on a plate. 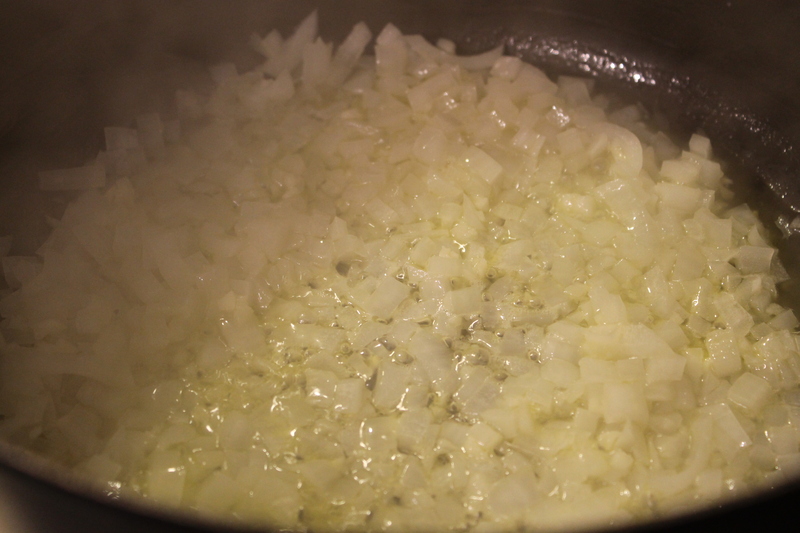 Add the remaining 2 tablespoons of oil to the saucepan, turn the heat up to medium-high, and add the onions. Saute the onions for 5 – 7 minutes, or until they begin to soften and become translucent. Sautéing the onions. Be sure to stir frequently. Add the rice and saute another 2 – 3 minutes. Adding the rice. Cooking the rice like this will help it start cooking and soak up some of the favors of the onions and oil plus any other spices you add. 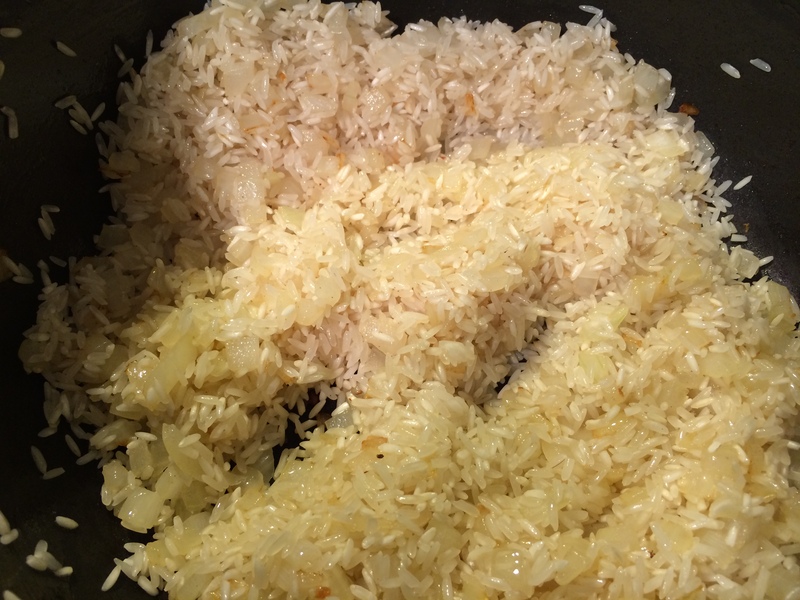 Again, be sure to stir frequently so the spices don’t burn and that the rice and onions are evenly coated. 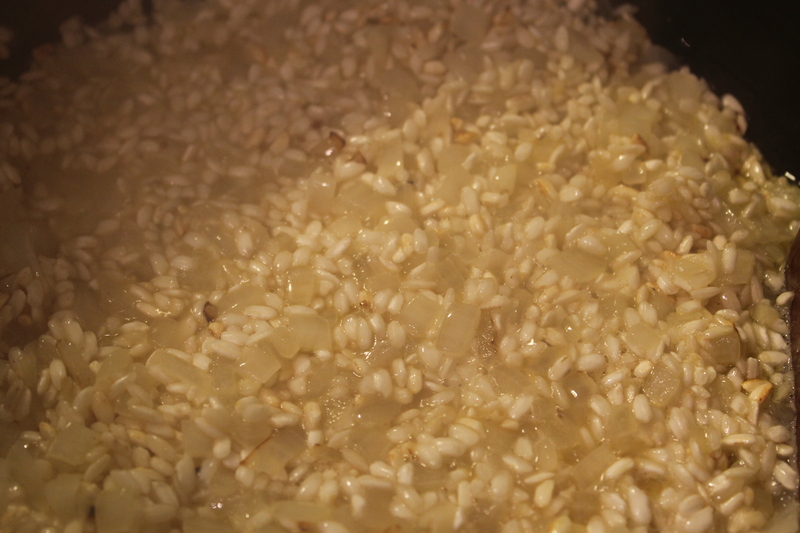 Spread the onion-rice mixture into a fairly even layer on the bottom of the saucepan. Lay the fish on top. Carefully pour over the stock or water and reserved lemon juice (from the marinating). Bring the liquid to a boil, reduce the heat to low, and cover the saucepan. 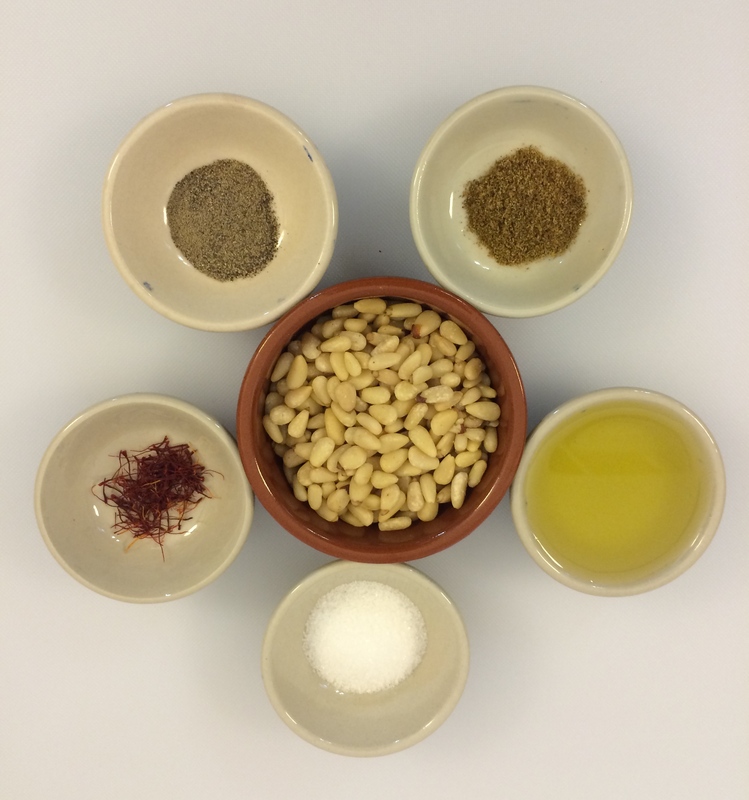 Sprinkle with the browned pine nuts or almonds and serve with the Tahineh-Radish Sauce. For the money, this is one of the best brands you can buy. Tarazi is an excellent brand, too. Avoid Krinos, though. Yuk. Place a small strainer over a medium bowl and use a small-holed (i.e. 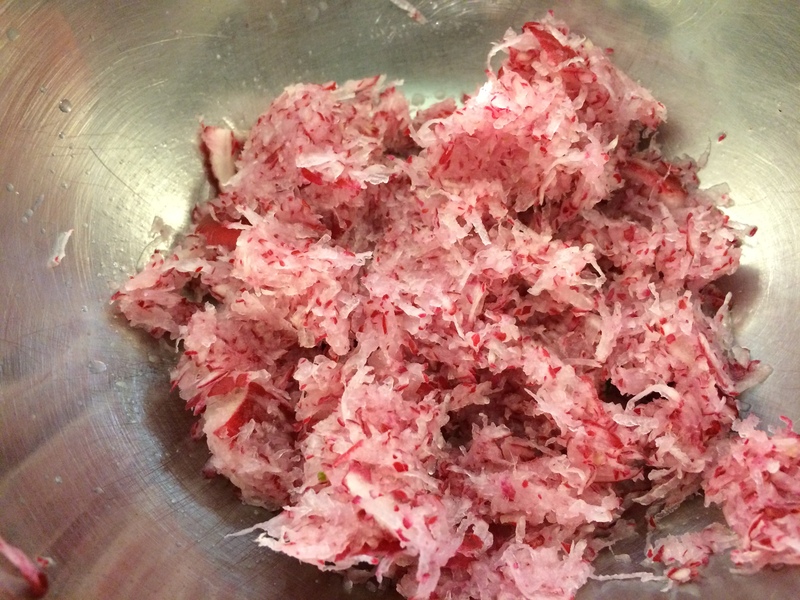 fine) grater to shred the radishes. Shredding the radishes. If you don’t have a small grater, you can use your food processor with the fine grater attachment. Just be sure to drain the radishes afterwards. 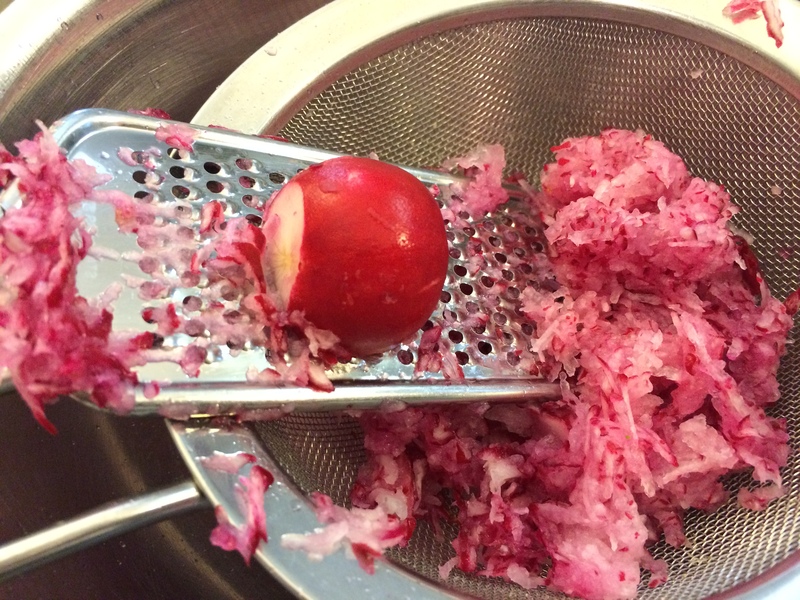 Once you have shredded all the radishes, press down on the shreds in the strainer to get out as much of the liquid as you can. Remove the strainer from the bowl, pour off the liquid, and place the shredded radishes back in the bowl. Amazing how much water comes out of a bunch of radishes. That’s close to a cup of liquid. The finished radishes. The whole shredding and draining process goes much faster than you would think. Add the tahineh, lemon juice, and a good pinch of salt. Mix. The tahineh will start to thicken due to the lemon juice (it’s an acid-base reaction; chemistry!). 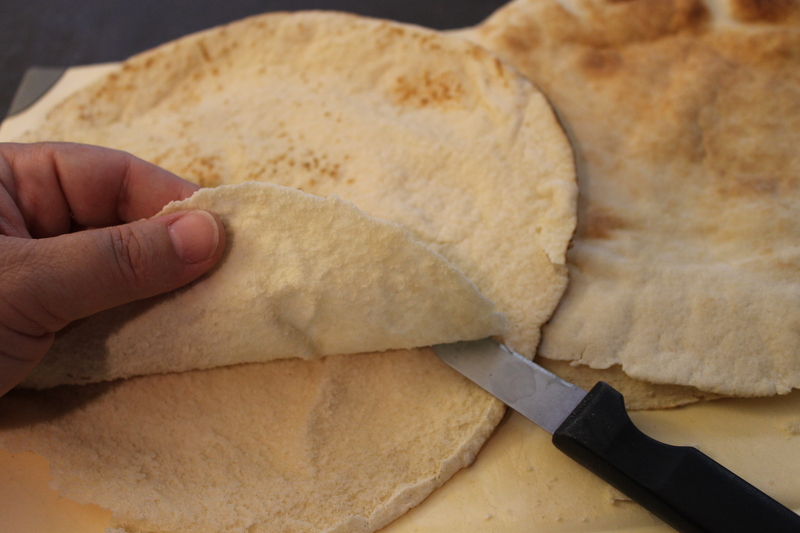 The tahineh will start to thicken when you add the lemon juice. It’s a chemistry thing. Add water until the sauce loosens up and becomes a smooth consistency. Adjust the seasoning. Adding the water. You may not think this will come together, but it does. Trust me. 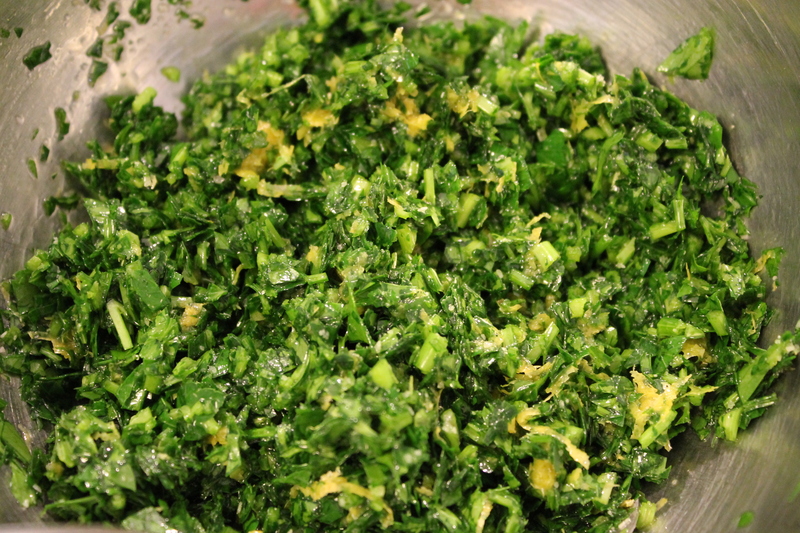 Once the sauce has smoothed out and it is the consistency you like, stir in the parsley. I think I ate this in about 5 minutes. I love a good glass of lemonade. Real lemonade. Not the powdered stuff. And, with summer lasting about 8 months in Texas, it’s almost a necessary staple, along with water, iced tea, and beer, to power through the heat. The basic lemonade recipe consists of three things: lemon juice, water, sugar. The flavor all depends on how you personally prefer it – sweet or tart. Personally, I like it more on the tart side. 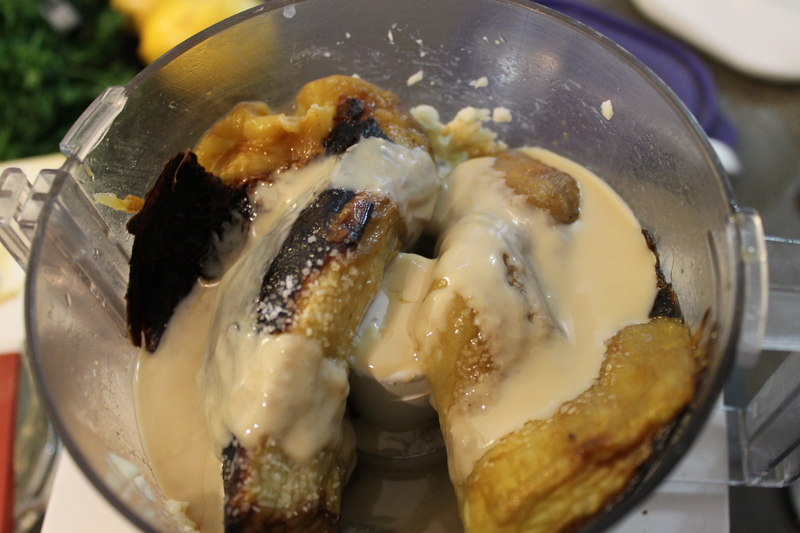 Of course, since it is such a basic recipe, it leaves lots of room for interpretation and experimentation. You can add just about any herb or spice that goes well with lemon – mint, basil, thyme, rosemary, oregano, tarragon, ginger, pepper – for example; or, even add other fruits or juices to the mix – the list on that is pretty much endless. My personal favorite is probably one of the more obvious ones – mint and berries. I think it’s because during the summer, when berries are truly in season, I like to find as many ways possible as I can to use them. And, mint is a natural affinity flavor for lemons and berries. It’s a win-win. 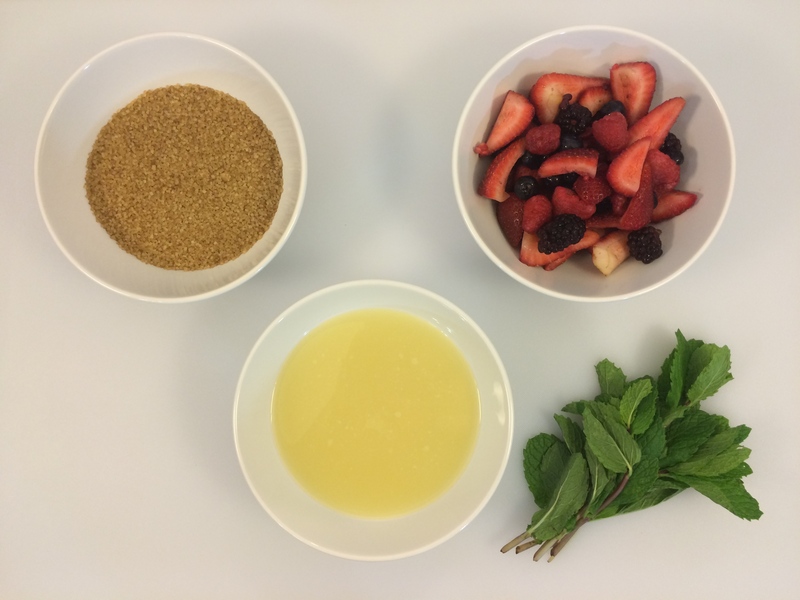 So, here is my recipe for Berry-Mint Lemonade. 1. Yes. I have used lemon juice from the green plastic bottle. I know fresh squeezed is better, but I don’t always have a bottle of the fresh-squeezed juice around. If you really want fresh squeezed and don’t have any or can’t find it, you can either squeeze it yourself (a pricy and time consuming prospect), or just go for the green bottle. It’s fine and most people won’t know the difference. I will say the one distinct added plus to the green bottle lemon juice is that the flavor is consistent. Fresh lemons can vary in tartness and yield. 2. You can use all of one berry in this if you like. I just always happen to have a large container of cut berries in my fridge during the summer as Husband Steve’s & my go-to fruit. Bear in mind, however, that the color and overall flavors will definitely change. As it is with anything completely natural, there are always going to be differences in flavor – either more sweet or tart. 3. You can use either white or raw sugar in this. I prefer the raw because it’s a little less sweet than the white. 4. If you don’t like or don’t have mint, you can use another herb in this. Most herbs & spices that go with lemon work well with berries, too. You may want to experiment on the amount you want to use. Some are definitely stronger than others (i.e. 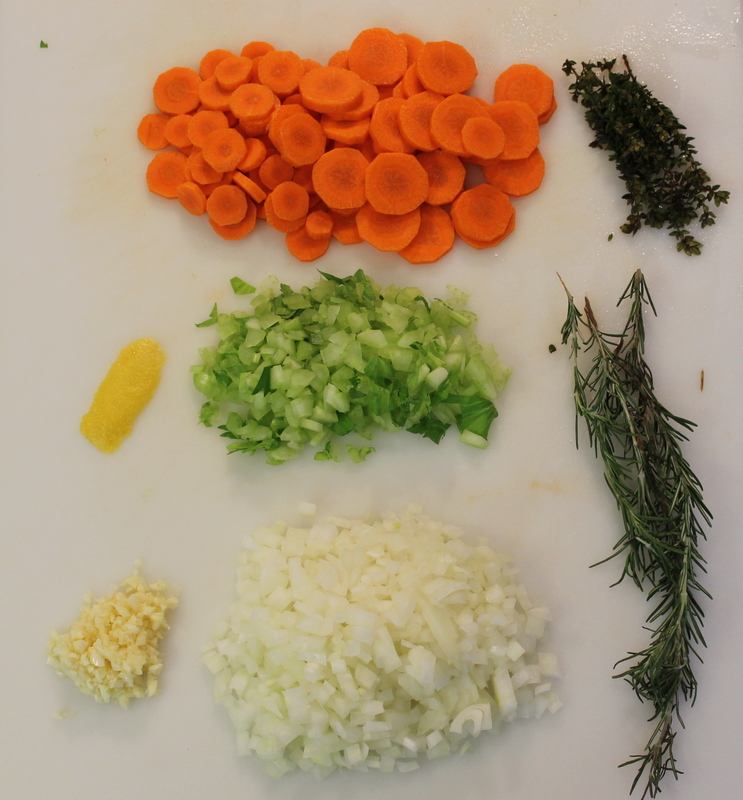 rosemary, ginger, oregano), so you want to be sure what you’re using won’t overpower the other flavors. 1. 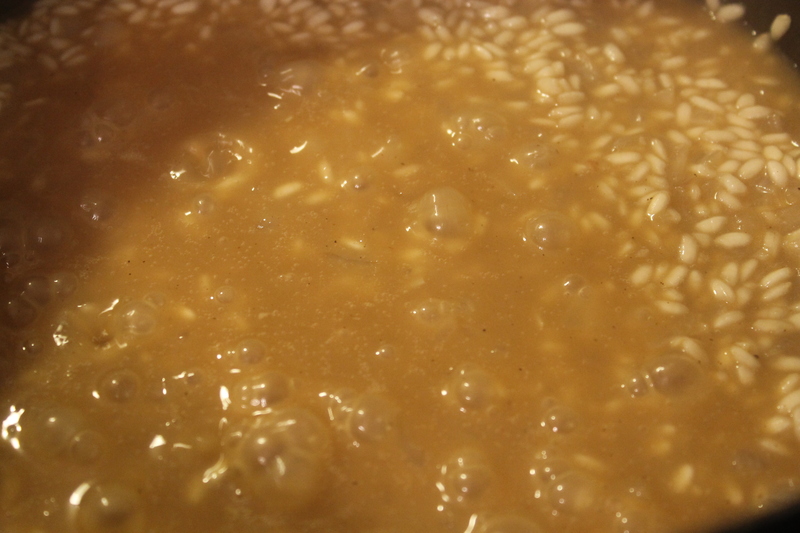 In a small saucepan, combine the water and sugar over high heat. Stir frequently to make sure the sugar is dissolved. The simple syrup. Since I made this with raw sugar, it is obviously going to be darker than with white sugar. 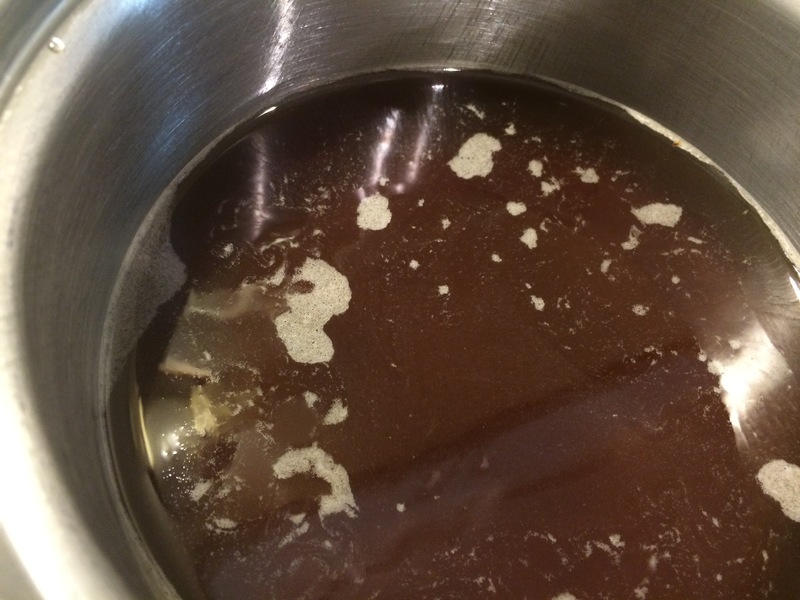 A simple syrup made with white sugar will be completely clear. 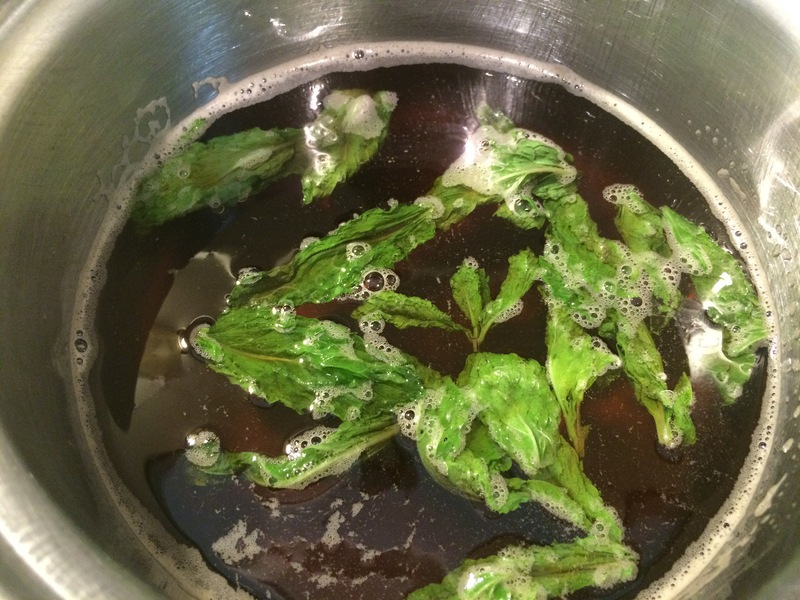 Bring the syrup just to a boil, take the saucepan off the heat, and add the mint leaves. 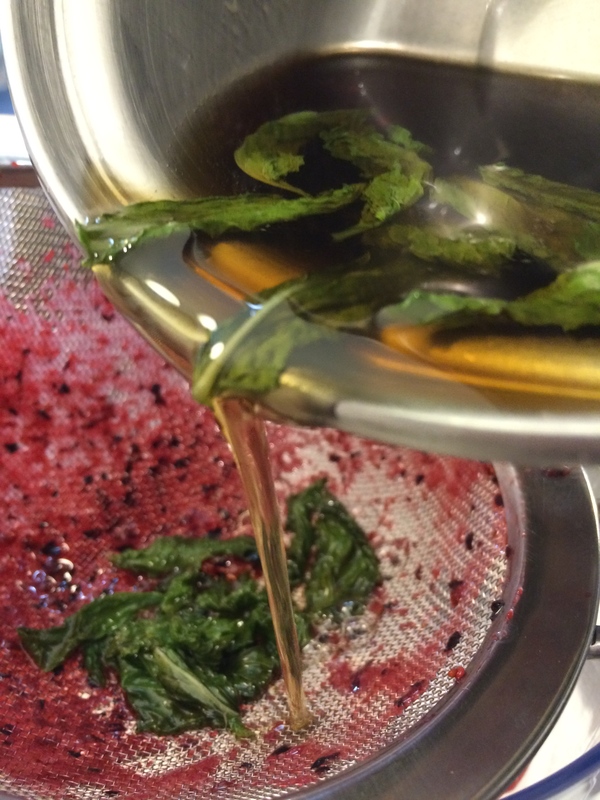 Allow the mint to steep in the syrup until it has cooled, about 1 hour to 1-1/2 hours. Adding the mint to steep. 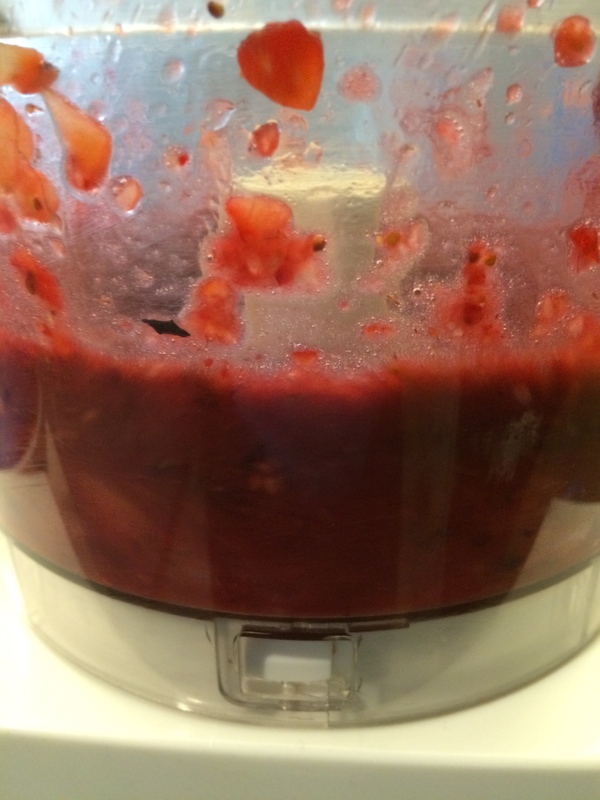 Adding the berries to the food processor. I like to wear gloves to keep the berries from staining my hands. 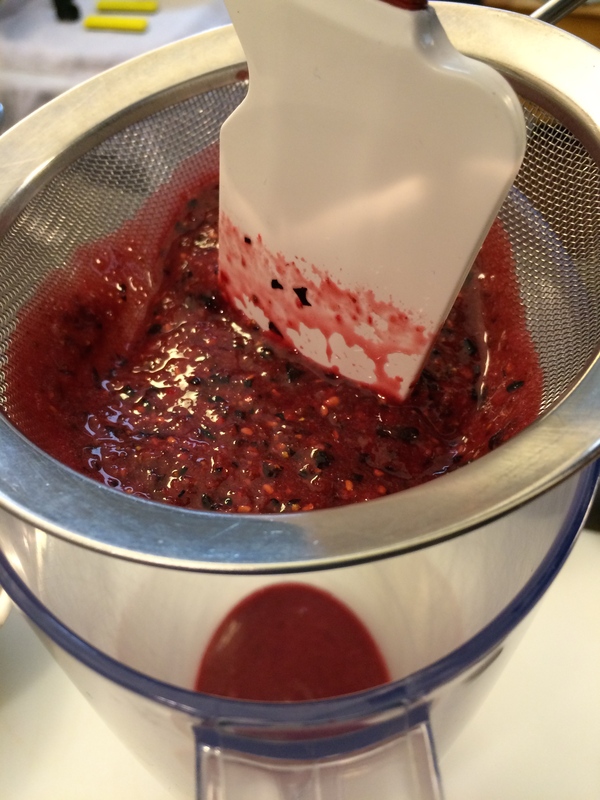 Let the berries process until they are pureed. Place a small strainer over a large measuring cup (at least a 4-cup), large bowl, or a pitcher. 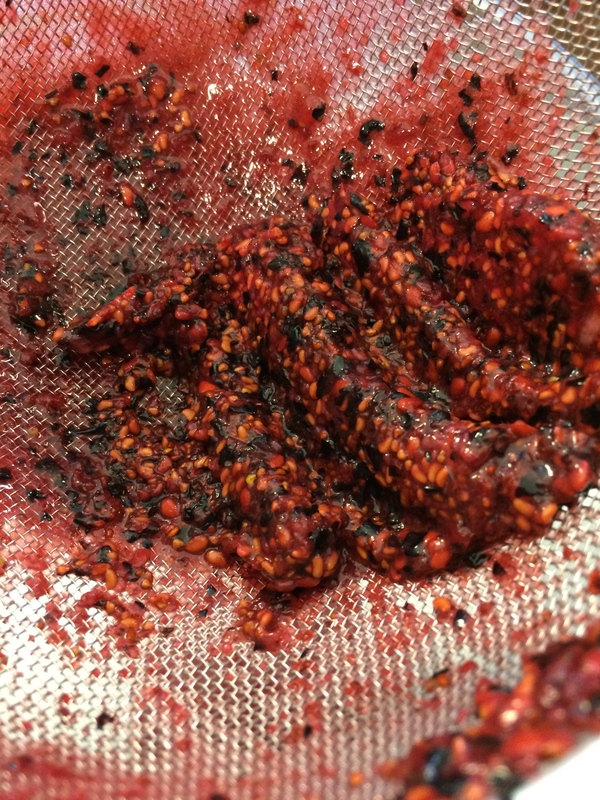 Pour half of the pureed berries through the strainer and, with a rubber spatula, work as much of the liquid out of the pulp through the strainer as possible, leaving behind the seeds and pulp. Be sure to scrape the outside bottom and sides of the strainer. 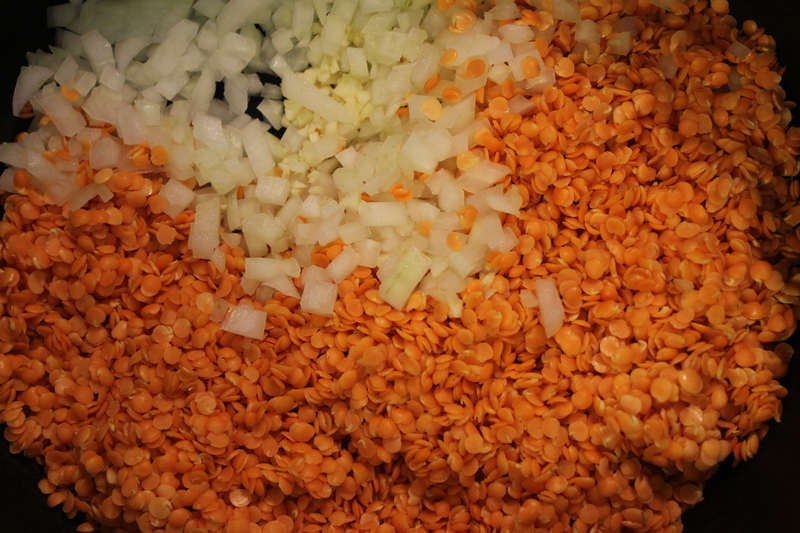 Dump the leftover seeds and pulp into a small bowl and repeat with the other half. 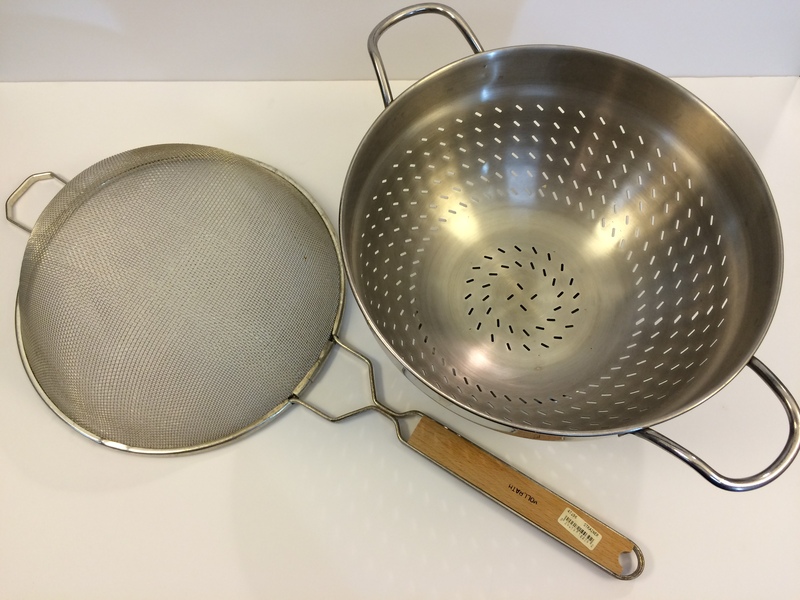 On the left, a strainer; the right, a colander. They do a lot of the same things, but a strainer is used for finer work (i.e. sifting, straining purees, etc.). Don’t confuse the two. Pressing the pureed berries though the strainer. The final leftovers after two sessions in the food processor and straining. 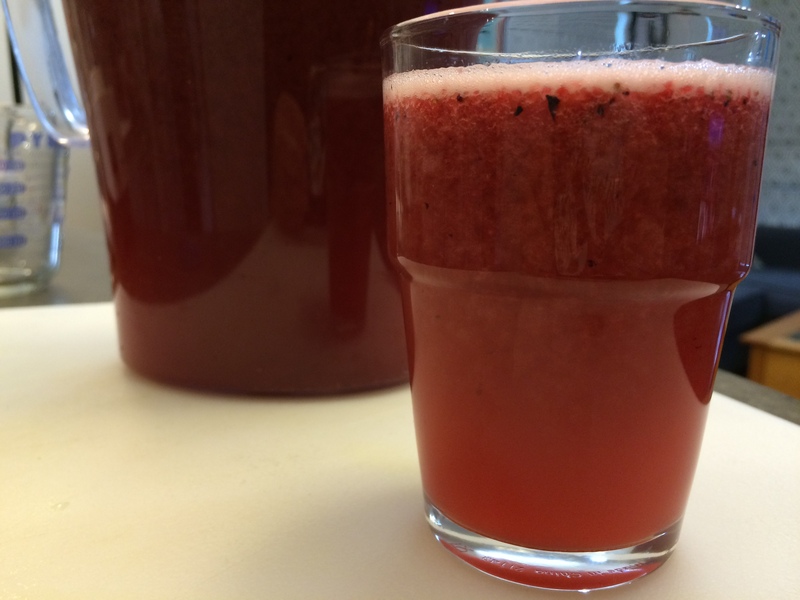 You want to get as much of the juice as possible out of the berries. I generally just put this in the compost. 3. 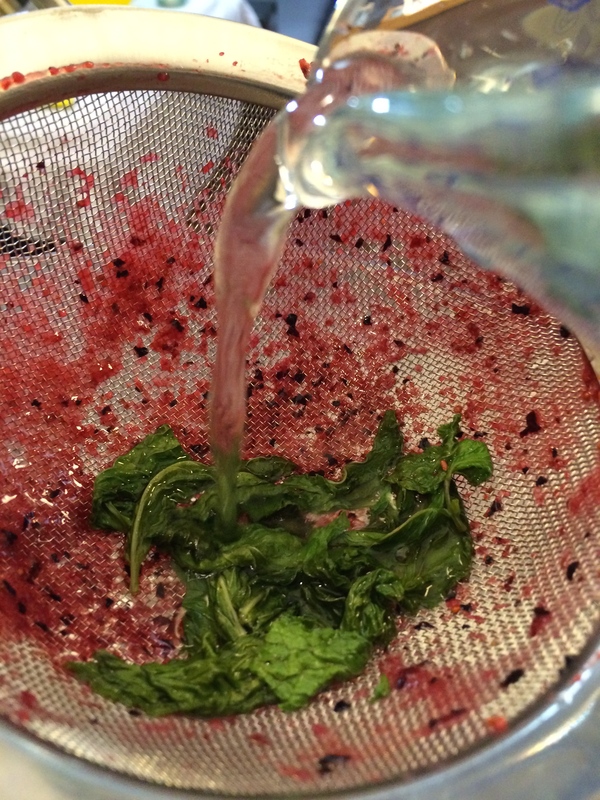 Once the syrup is cooled, pour the syrup through the strainer so it can catch the mint. 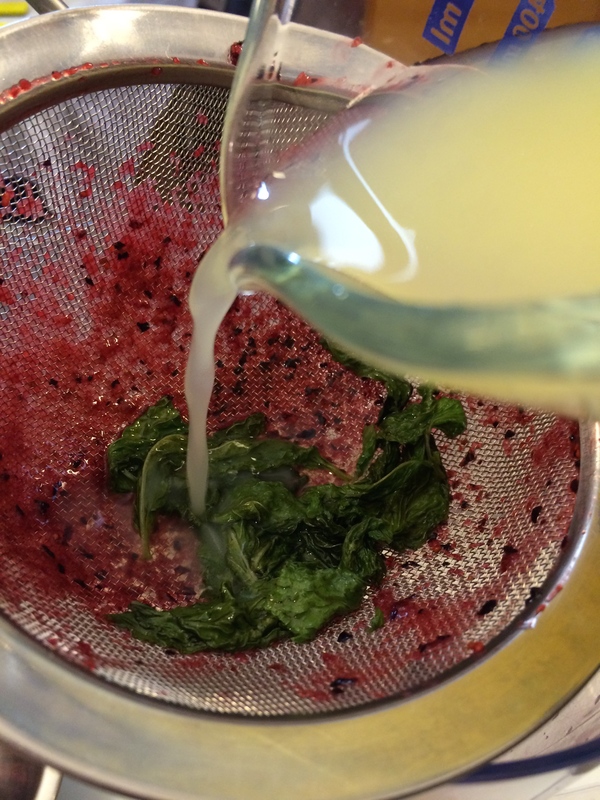 I like to leave the strainer on so I can pour the lemon juice and water over the mint as well. This way, you can get as much flavor out of the mint as possible. Mix thoroughly. 4. Place the lemonade in the refrigerator and let chill. Mix it again before checking for flavor. Lemonade. This also makes a great mixer, by the way. 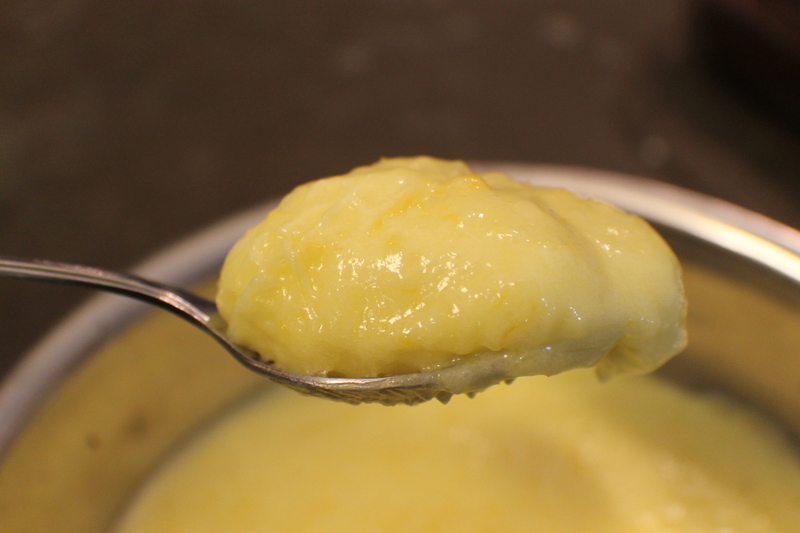 For me, winter is the best time of the year to make Lemon Curd. Why? you ask? Because winter is when I can find Meyer Lemons at the store. While I can certainly make lemon curd with regular lemons, I find Meyer Lemons have just the right mix of tart and sweet that take this lovely confectionary spread to the next level. 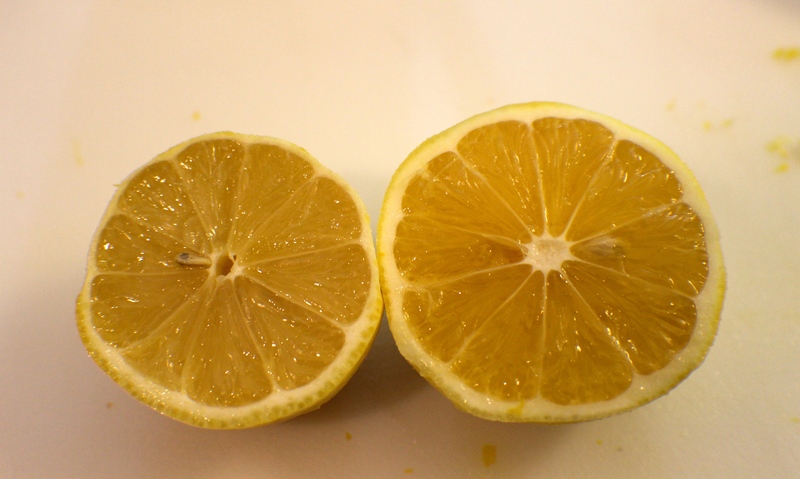 Meyer Lemons were grown in China for centuries and were introduced in the US in 1908 by F.N. Meyer. Botanists believe it is a cross between a lemon and an orange. It is generally larger, juicier, and less acidic than regular lemons. They are usually available from fall through early spring, with their peak season during the winter. 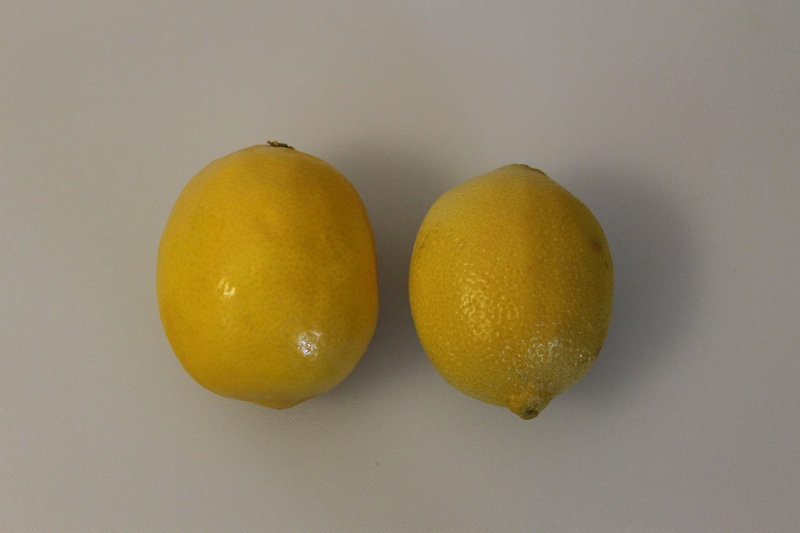 A Meyer Lemon (l) and a standard lemon (r). Now, wait, you may be saying. 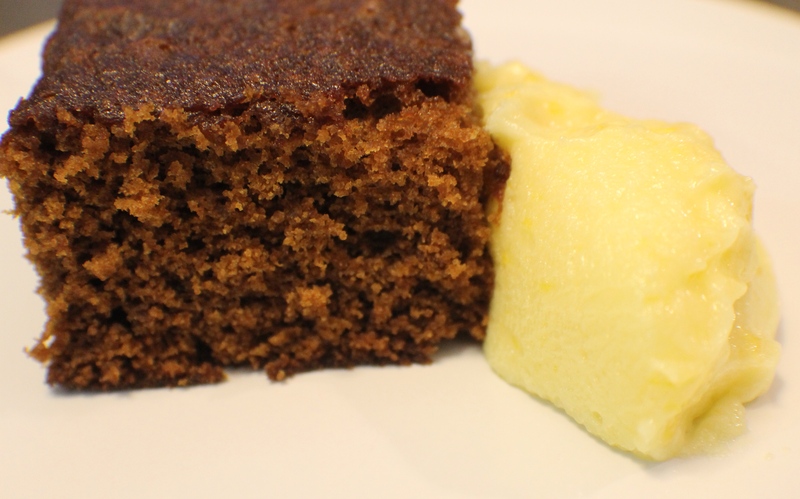 What is exactly Lemon Curd? 1. 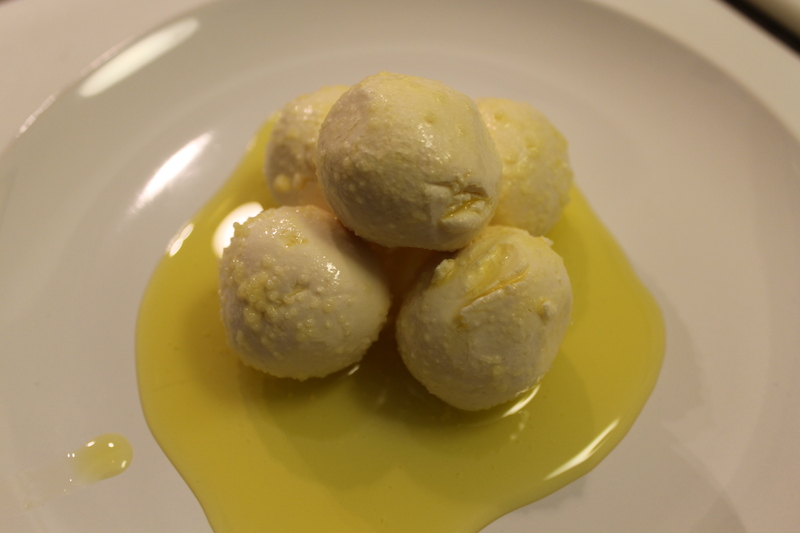 Curd solids from milk. These solids are formed when rennet (or another acid) is used to separate the milk solids from the liquid (whey) during the cheese making process. 2. A sweet creamy spread that consists of (usually) citrus juice, egg yolks, sugar, and butter. It can be made with other fruit such as berries. A curd is a type of sauce called an emulsion. The simplest explanation for this comes from The New Food Lover’s Companion: “A mixture of one liquid with another with which it cannot normally combine smoothly. 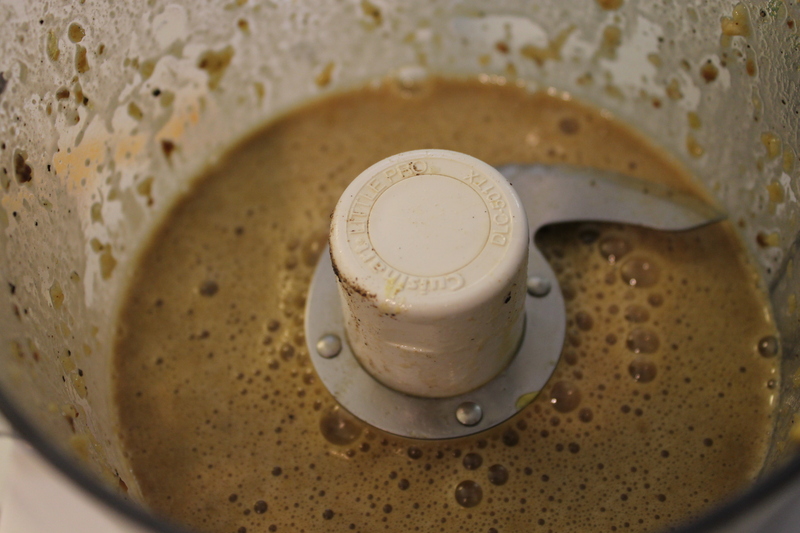 Emulsifying is done by slowly adding one ingredient to another while at the same time mixing rapidly (usually whisking). This disperses and suspends tiny droplets of one liquid throughout the other. 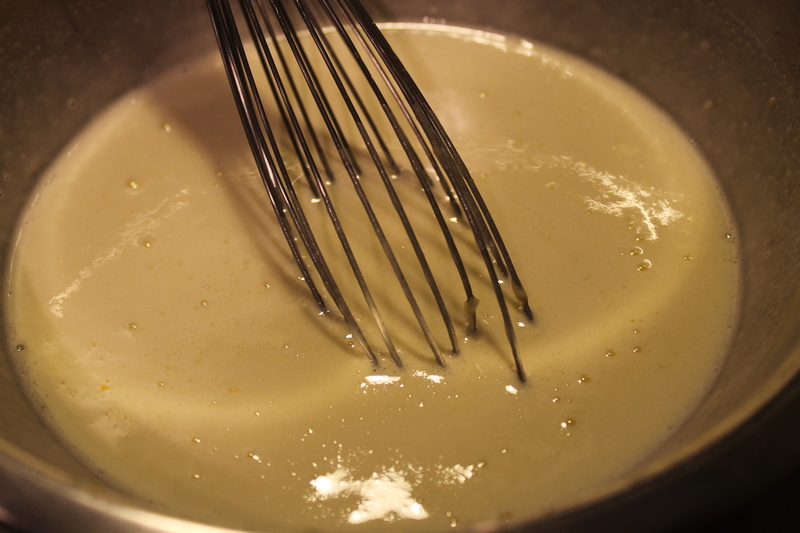 Emulsified mixtures are usually thick and satiny in texture.” Mayonnaise, vinaigrette, hollandaise, and bearnaise are all examples of emulsion sauces. 1. You can make this with regular lemons. Find lemons that feel heavy for their size. 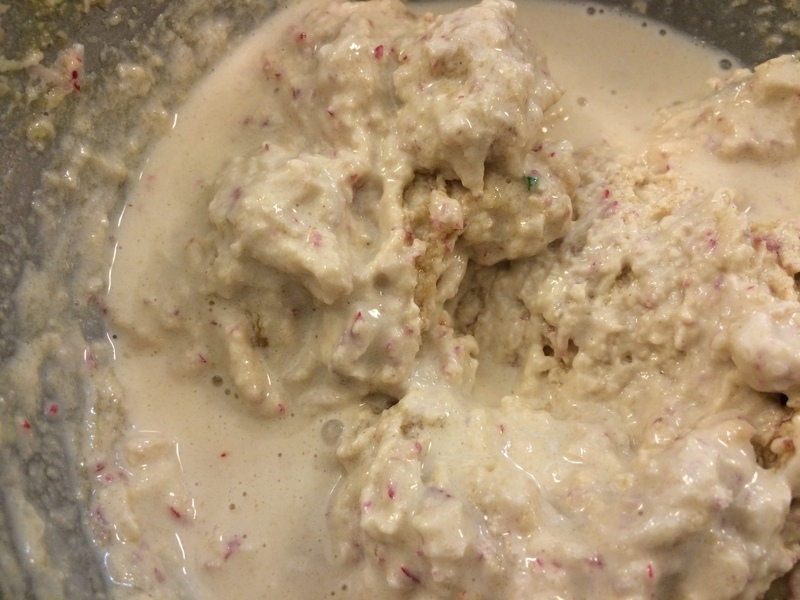 The final product will be more tart, but you can add some sugar to taste if you like after the curd is finished. 2. The best way to go about this is low and slow. If you show any impatience or lack of attention, you could easily over cook the curd and end up with sweet scrambled eggs. 3. Always have extra bowls on the side in case you need to move your curd to a cool, clean bowl. 4. Having an instant-read thermometer will come in handy. You want the curd to come to about 160F. It will be fully cooked at this point without scrambling the eggs (that is, if you are careful). 5. 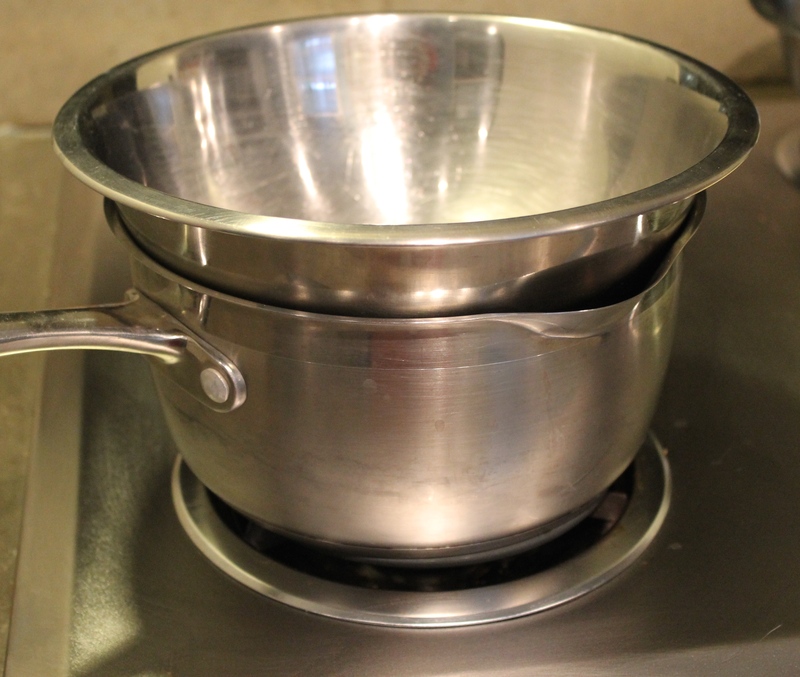 When using the double-boiler, the boiling water should never touch the bottom of the bowl. This will cause the eggs to cook too quickly. 6. You can make lemon curd into a preserve: Fill a half-pint jar with a 1/2″ head space and process the jars for 15 minutes. Take the canning pot off the heat and leave the jars in the hot water for a further 10 minutes, then take the jars out of the water, and place them on racks to cool and seal. Because of the nature of the curd, however, the texture will change during the processing, and it will only have a shelf life of 2 – 3 months because of the high dairy content. The lemon zest. I use a Microplane for mine. If you don’t have a Microplane, just very finely mince the zest. Early in the process. The mixture is still dripping unevenly. I kinda cheated here and used the electric beaters. About 10 minutes later. 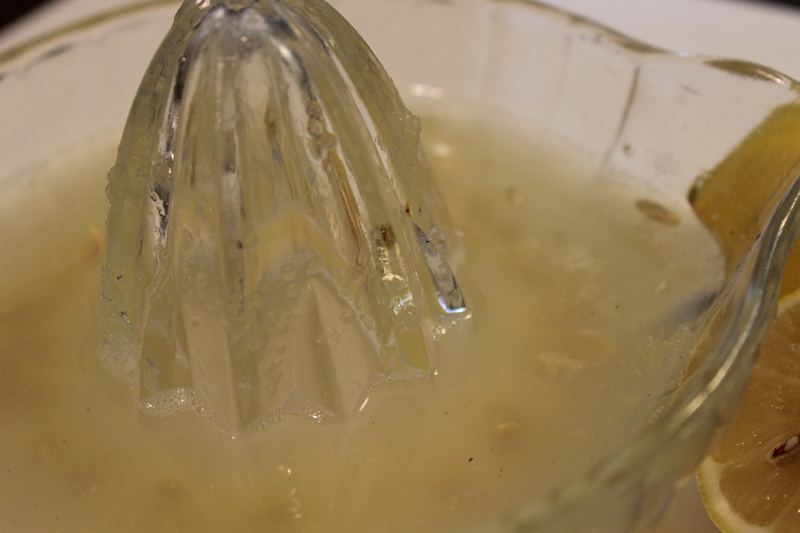 The mixture is thickened and is falling much more smoothly from the beaters. If it doesn’t fall in a ribbon, you want the mixture to at least leave a “trail” in the bowl as it falls back in. 2. Carefully mix in the lemon juice and zest. Adding the zest and juice. Setting up the double boiler: Fill the saucepan about 1/4 full of water. Make sure that the boiling water never touches the bottom of the bowl. Have a second bowl on the side in case the mixture cooks too quickly and begins to curdle (that would be the eggs scrambling). 4. 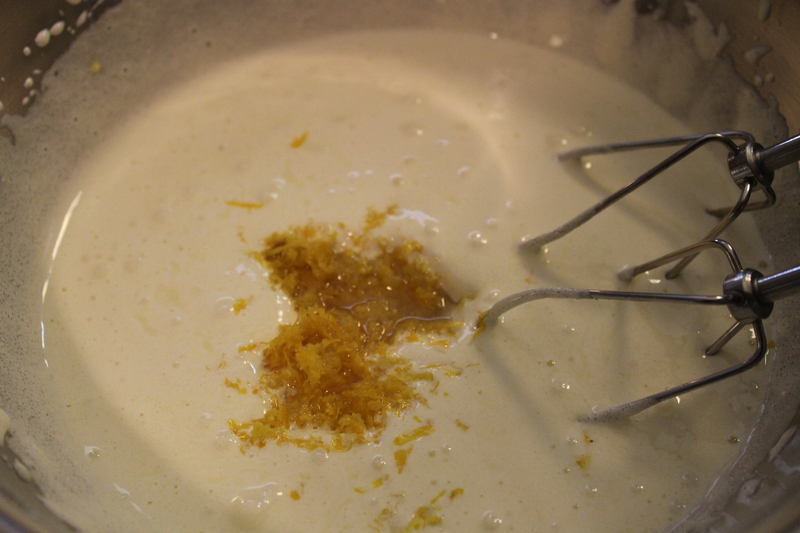 Stir the lemon mixture with the whisk constantly until the foam subsides and begins to thicken. Adjust the heat as needed (the easiest way to do this is to take the bowl from off the top of the saucepan, or, if the mixture is cooking too quickly, move the mixture to your second bowl; if you do move to a second bowl, very carefully scrape or do not scrape the original bowl – what’s left in the bowl is more than likely going to be scrambled). 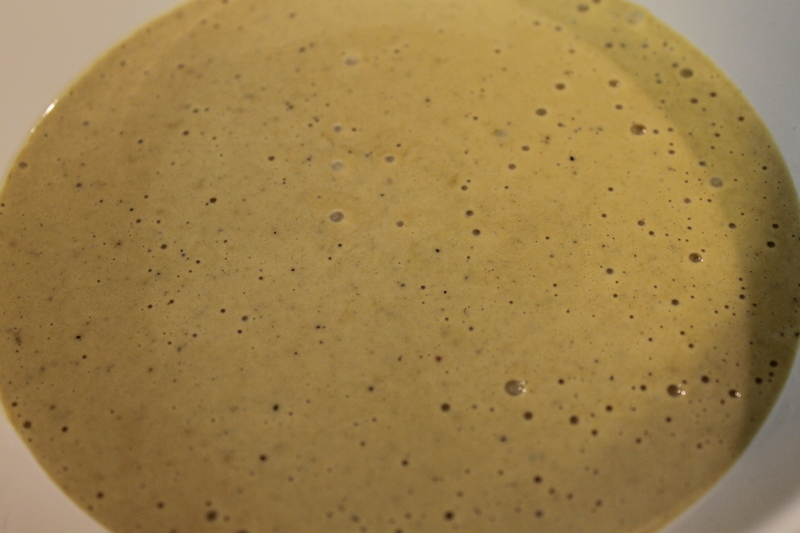 The foam has pretty much subsided and the mixture is beginning to thicken and look darker. If you use an instant-read thermometer, it should read between 155F – 160F. 5. Begin to slowly add the softened butter. Just add 2-3 pieces at a time, still whisking constantly. 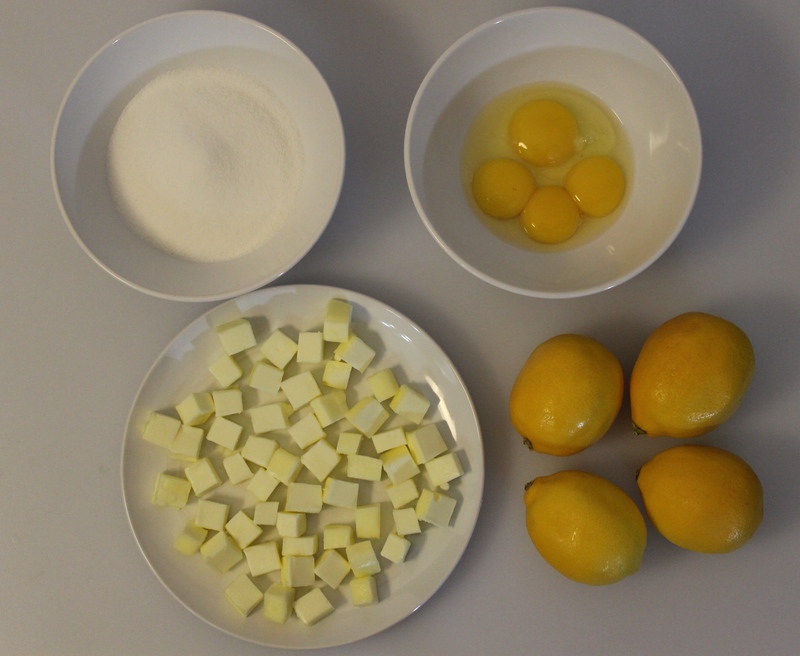 You want to incorporate the butter into the lemon mixture. If you simply add the butter and let it melt without whisking, the fat in the butter will separate and you won’t be able to incorporate it. You’ll simply end up with butterfat floating on top. Adding the butter. 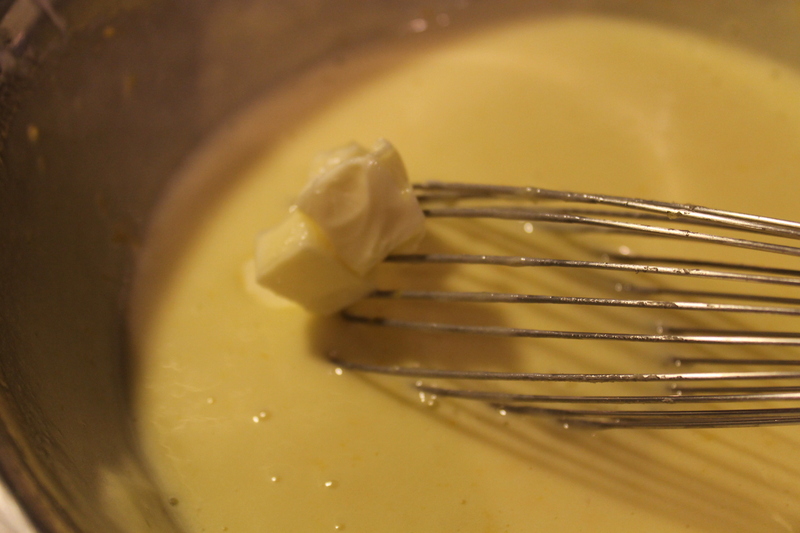 Be sure to whisk constantly to make sure the butter is incorporated evenly into the lemon mixture. Do not let it simply melt on top. 6. After you have incorporated the butter, switch to either a wooden spoon or heat-proof spatula. 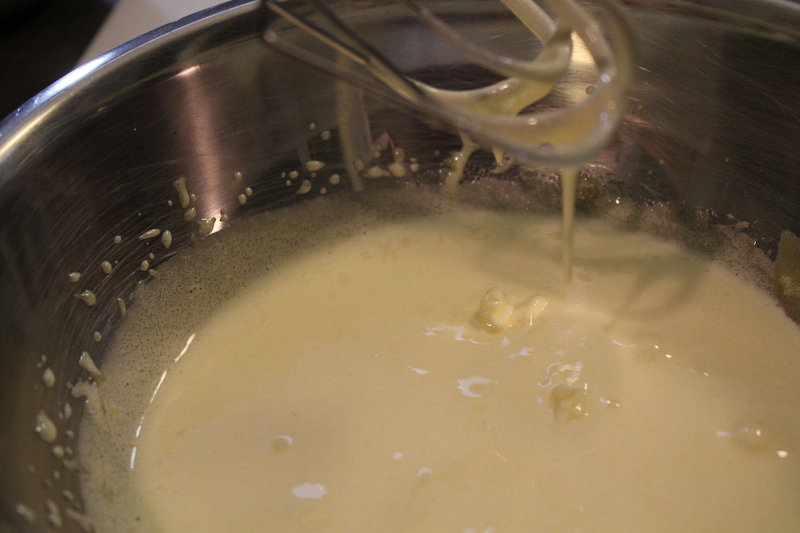 Continue stirring constantly until the curd is thick enough to coat the back of the spoon or spatula. Stirring the curd after the butter has been incorporated. 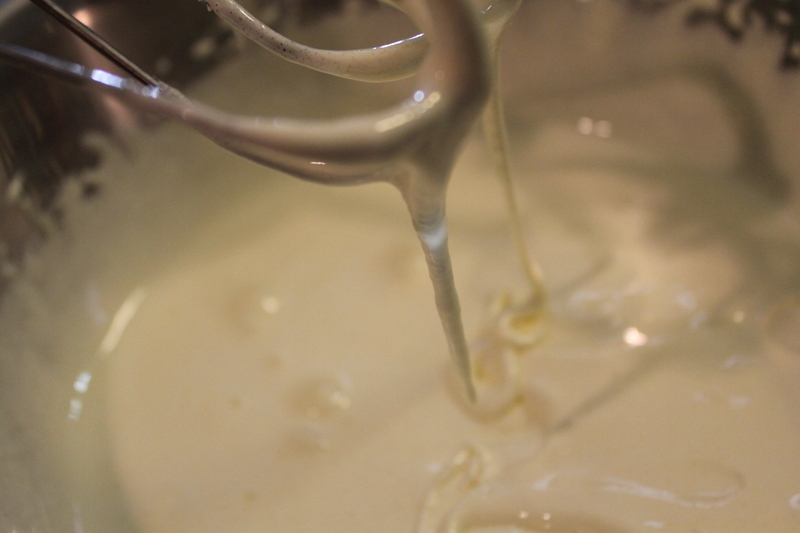 Again, keep stirring constantly, making sure to keep, especially, the curd on the side and bottom of the bowl moving. 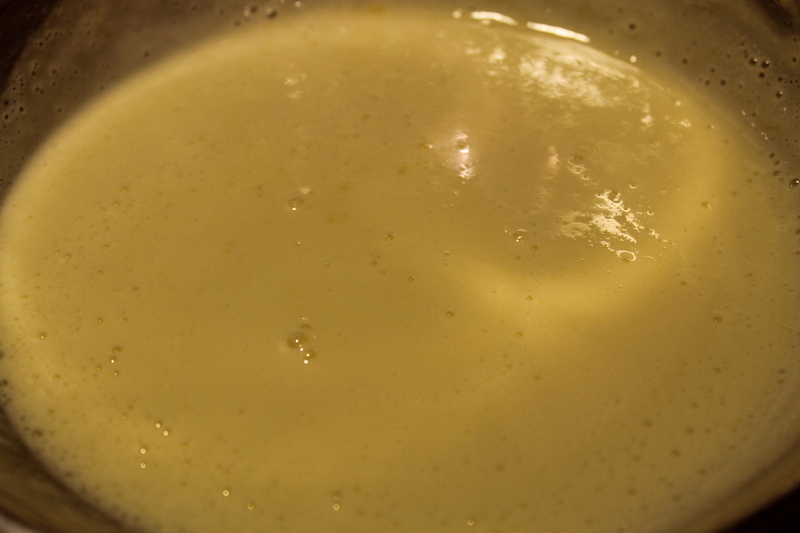 That is the curd that will quickly over cook if it isn’t constantly stirred. Coating the back of a wooden spoon. 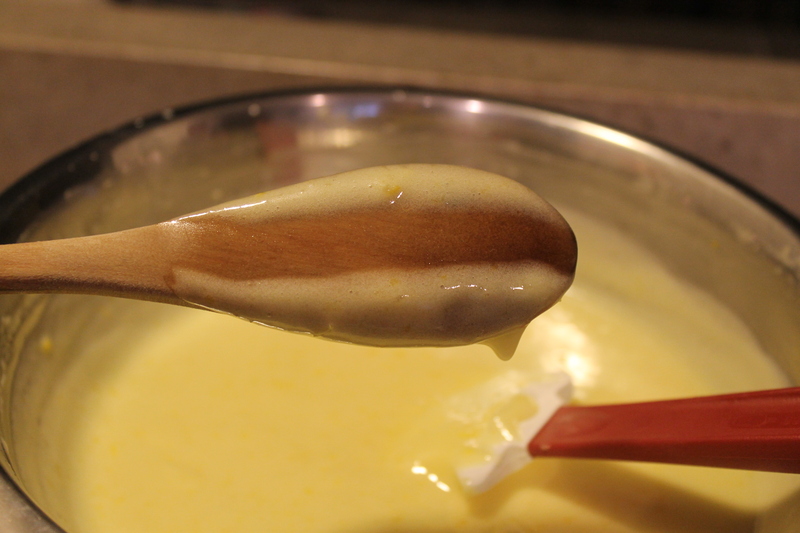 Running your finger through the curd on the spoon will test if it’s ready. If the curd doesn’t drip, it’s ready. This means that the eggs are cooked and your emulsion was successful. If, when you are done cooking, your eggs are curdled or scrambled, or your butter separates out, you can pour the mixture into a blender (not a food processor) and try to make a smooth curd. However, there’s no guarantee this will work; and if it does, you may still need to strain it to remove any remaining lumps of scrambled egg or the butter may separate out again. 8. 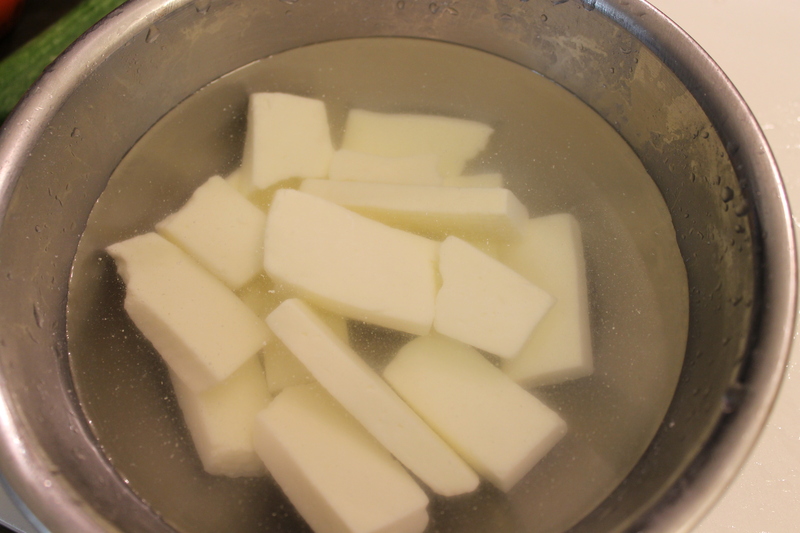 To store, place a piece of plastic wrap directly on the surface of the curd and place in the refrigerator. 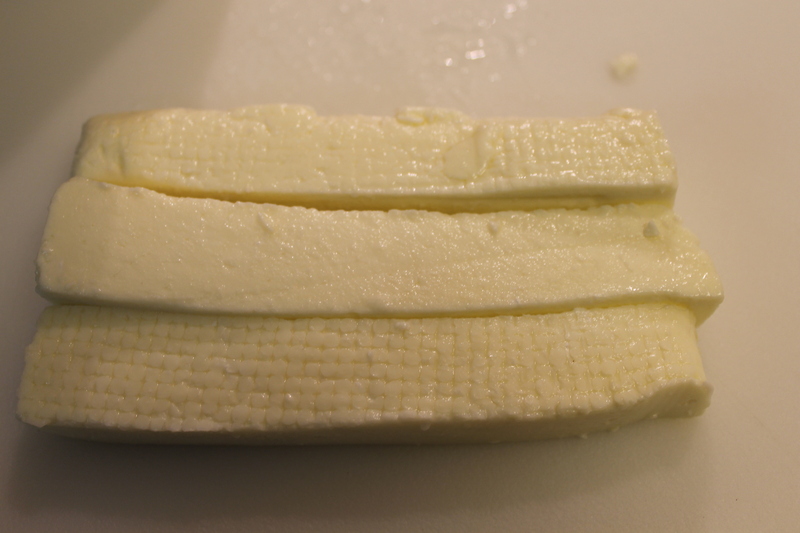 Because of the high butter content, it will set up into a fairly firm spread. It will keep for 4 – 5 days. 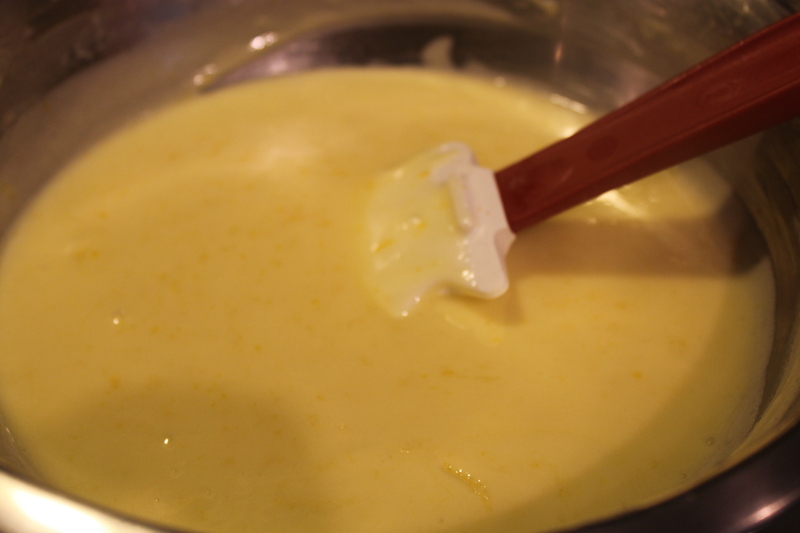 A lovely, creamy lemon curd. Sometime, I eat it just like this. Fattoush is another one of those Middle Eastern salads can be as simple or as complex as you like. It is ubiquitous throughout the region, including Turkey. While it can contain different ingredients, the base is always stale toasted or fried bread. 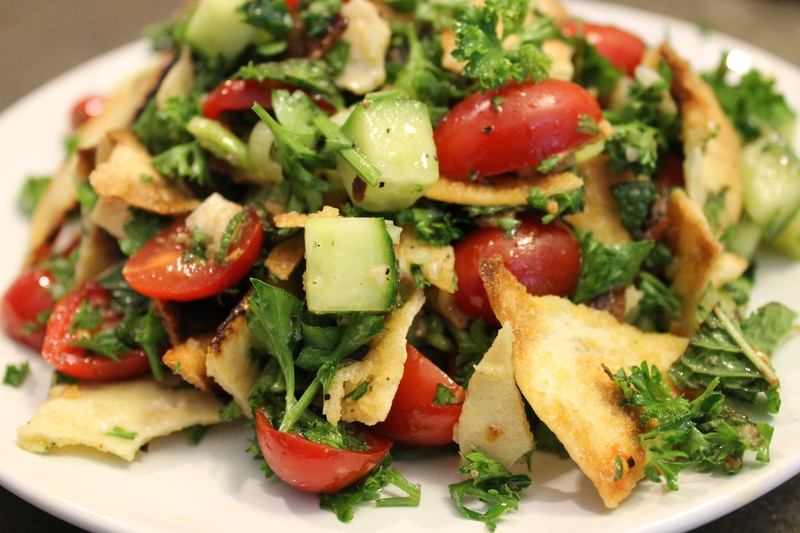 The word Fattoush comes from a mix of Arabic (fatt فت – meaning “broken”) and Turkish (ush). 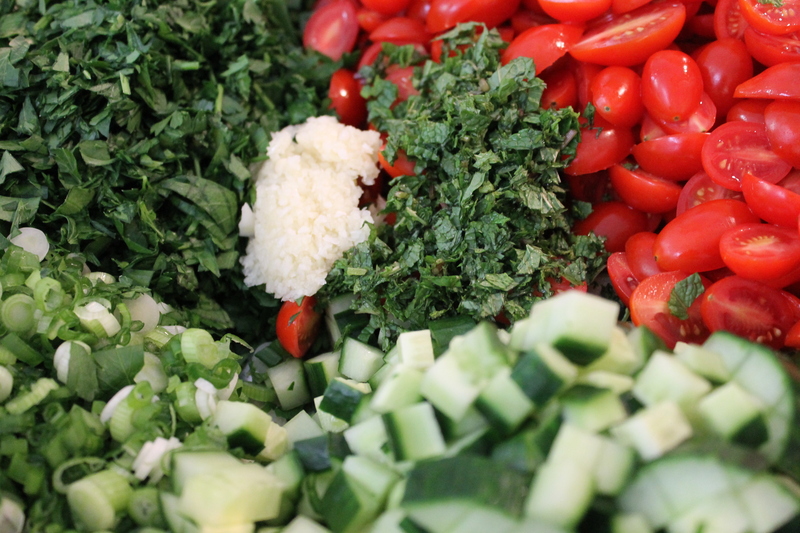 The chief ingredients are generally tomatoes, cucumber, onions, parsley, mint, olive oil, and lemon. Other ingredients can be radishes, lettuce, cabbage, bell peppers, pickled chiles, olives, sumac, garlic, and pomegranate syrup. 1. While I have given some measurements here, there are no hard and fast rules other than the bread. 2. English (hothouse) or Persian cucumbers are preferable. They have less water, fewer seeds, and don’t need to be peeled. 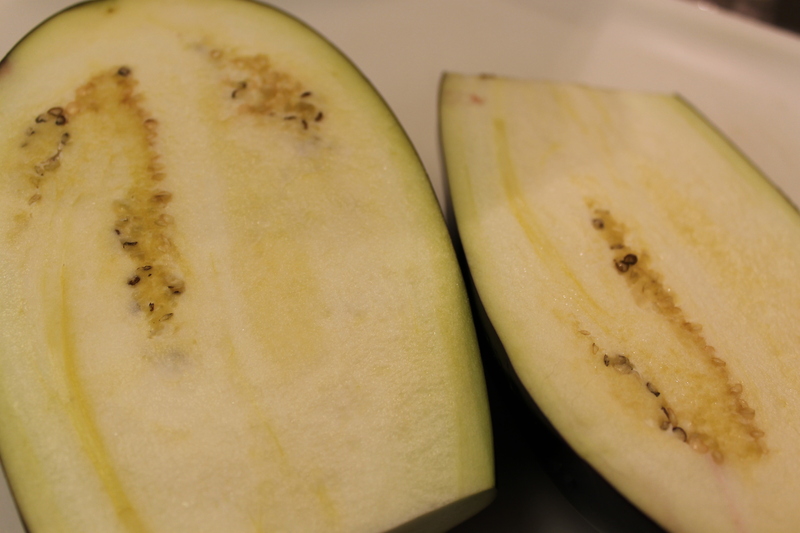 If you need to use the more familiar salad cucumber, then you will need to peel it (the skin is tough and usually waxed) and scoop out the seeds. 3. If you use large tomatoes, be sure to seed them. If you use cherry tomatoes, don’t bother with seeding. Just cut them in half. 4. Curly parsley is more traditional. However, flat leaf (Italian) is fine. 5. If you use garlic, use less than you think you need. Raw garlic is powerful stuff and can easily take over the rest of the salad. 6. You don’t need to cut the vegetables fine. They can simply be chopped. 1. Prepare the bread: If you are toasting the bread, preheat the oven to 450F. Split the loaves around the outside edge. Splitting the bread. A serrated knife is especially helpful with this task. Don’t worry if the loaves aren’t split cleanly. 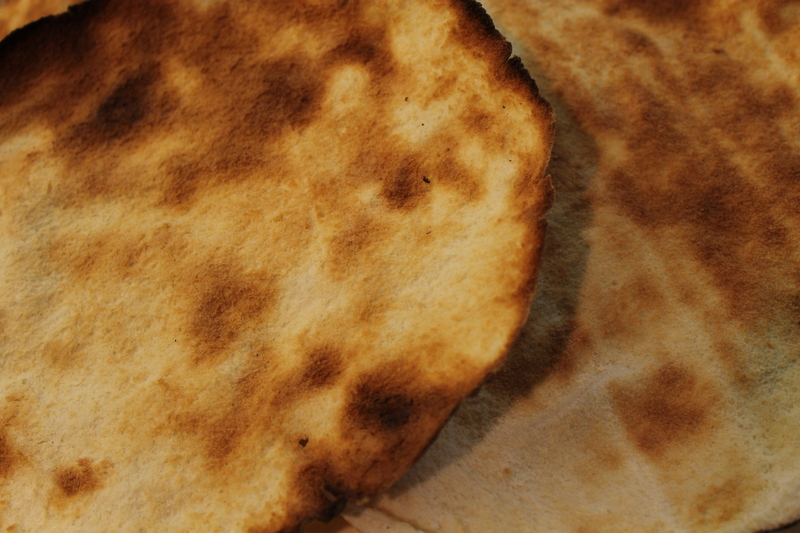 You’ll be breaking them up after they’ve been toasted. The split loaves. if they’re not perfect, don’t worry. They’re going to get broken up anyway. Place the split bread directly on the oven rack and let toast until it is a golden brown. Try not to let the bread get too dark or will add a bitter flavor to the finished salad. It should take about 2 – 3 minutes for the bread to toast. The toasted bread. Once it’s cooled, break it up into bite-sized pieces. Let the bread cool and then break it up into bite-sized pieces. I generally like to accomplish this by putting the bread into a large zip bag and breaking it up. No mess and the bag can be re-used. If you decide to fry the bread, heat your oil to 375F. 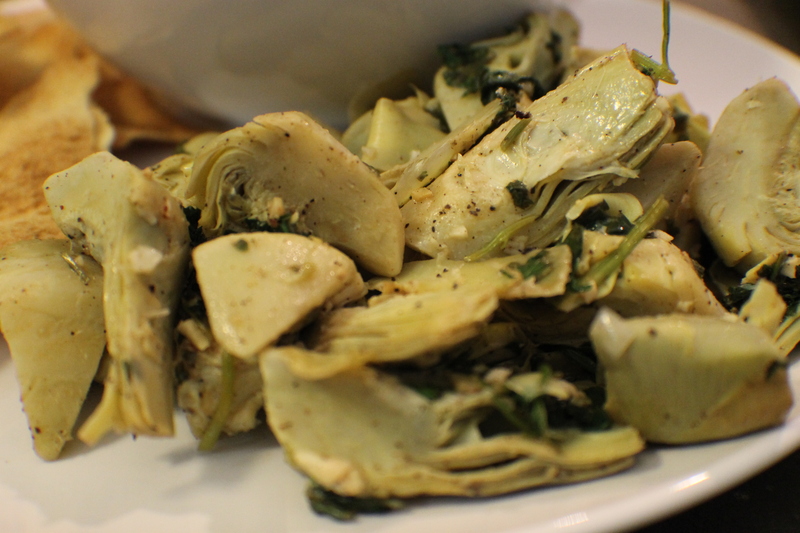 A mix of vegetable and olive oil works well for the flavor. 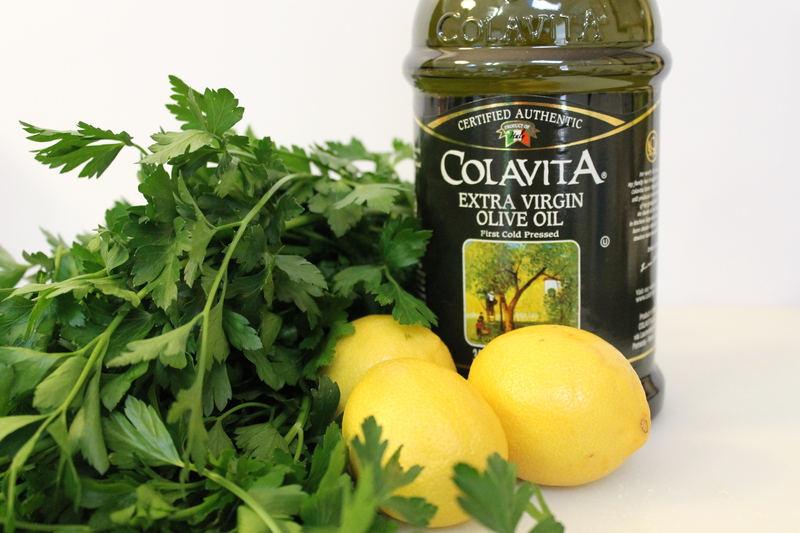 (use pure olive oil, not extra virgin.) Cut the bread into bite-sized pieces and separate them. Fry the bread in batches until golden brown. Drain on paper towels and set aside. 2. 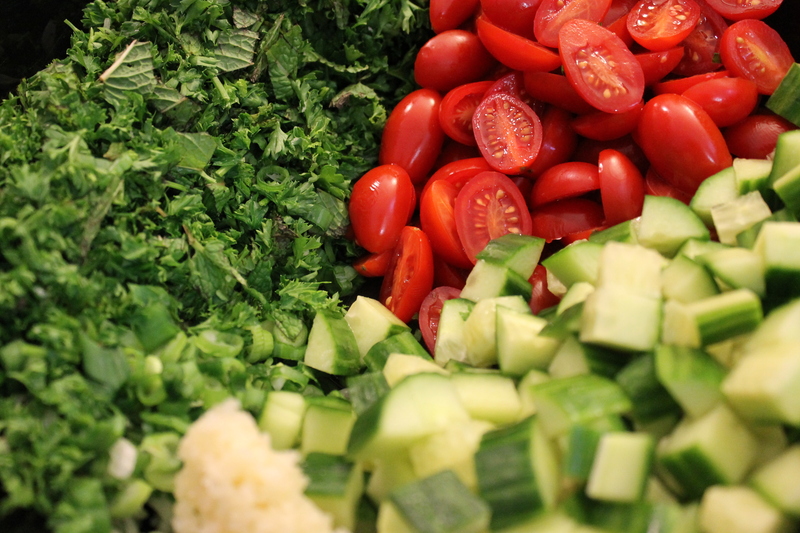 Place all of the prepared vegetables in a large bowl. Add the bread and toss. Add the olive oil, lemon juice, salt and pepper and toss again. Taste for seasoning. The vegetables ready for the bread and seasonings. Let the salad sit for about 15 minutes, then serve. The salad will keep for a day or two in the refrigerator, but it’s really best the day it’s made. The classic Caesar Salad can make a diner recall the days of martini lunches, 2-inch steaks, paneled dining rooms, and the Rat Pack. In short, it’s an American classic. An American classic that originated in Tijuana, Mexico. 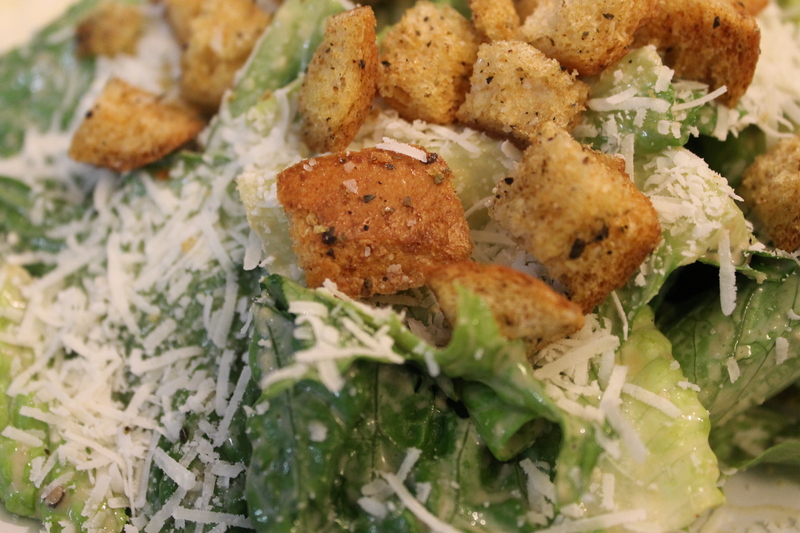 Legend has it that Caesar Cardini, a restauranteur in San Diego, invented the salad in 1924. He also operated a restaurant in Tijuana to circumvent Prohibition. According to his daughter, the Caesar Salad was invented out of sheer necessity when the kitchen supplies were depleted. After a rush on the restaurant one July evening, Cardini made do with what he had, adding the dramatic flair of the tableside preparation by the chef. And thousands of tableside performances were born. 1. 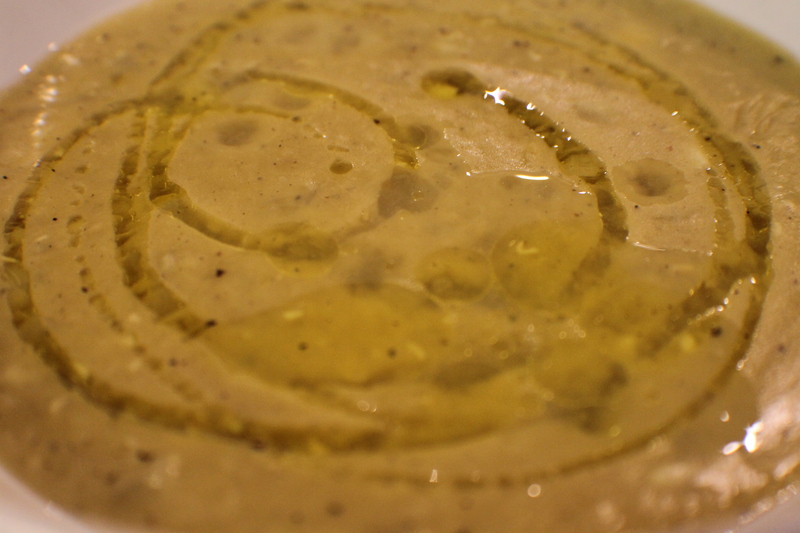 I (and many others) use anchovies in the dressing. The original recipe didn’t use them; the anchovy flavor came from Worchestershire sauce. If you would prefer to leave them out, go ahead. 2. To make this dressing vegetarian/vegan, omit the egg, anchovies, and Worchestershire Sauce and use vegan mayonnaise and vegetarian Worchestershire Sauce. 3. 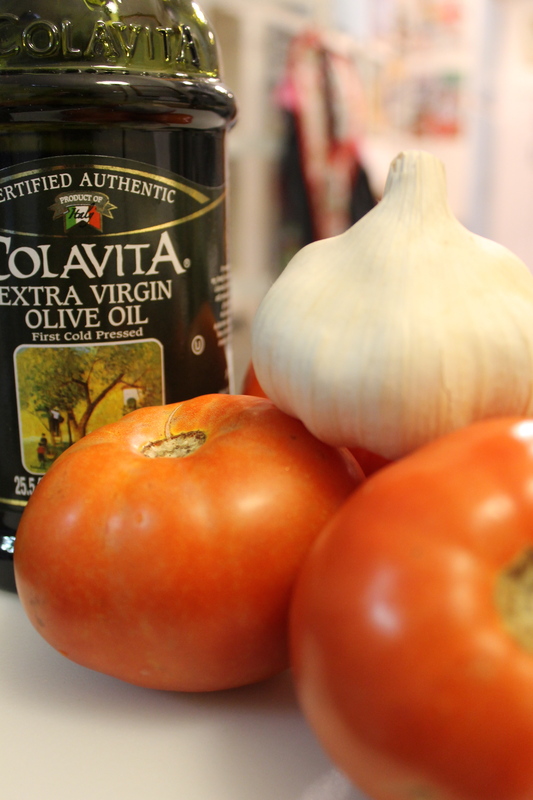 If you find the addition of all extra virgin olive oil too strong, you can cut it with half pure olive oil or an unflavored oil like vegetable or grapeseed. 4. Since this recipe does use raw egg yolks, it is best not to serve this to anyone who might have a compromised immune system. Healthy adults should be fine – especially if the eggs are fresh. However, if you are concerned about using raw eggs, substitute the mayonnaise. 5. 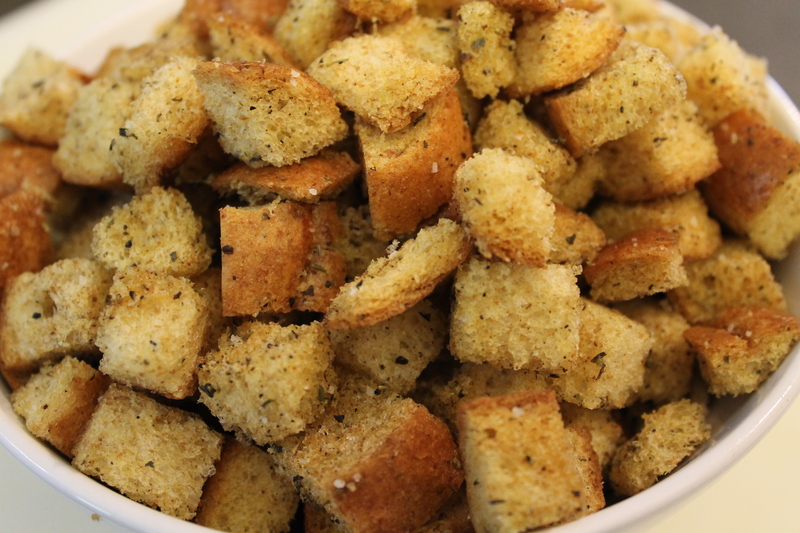 Croutons are essential in this recipe. You can buy them, but they are easy to make. I’ve included instructions. 6. When you grate the cheese, don’t use a Microplane; the cheese will be too fine. Either do shavings of cheese with a vegetable peeler or a larger grater. 7. 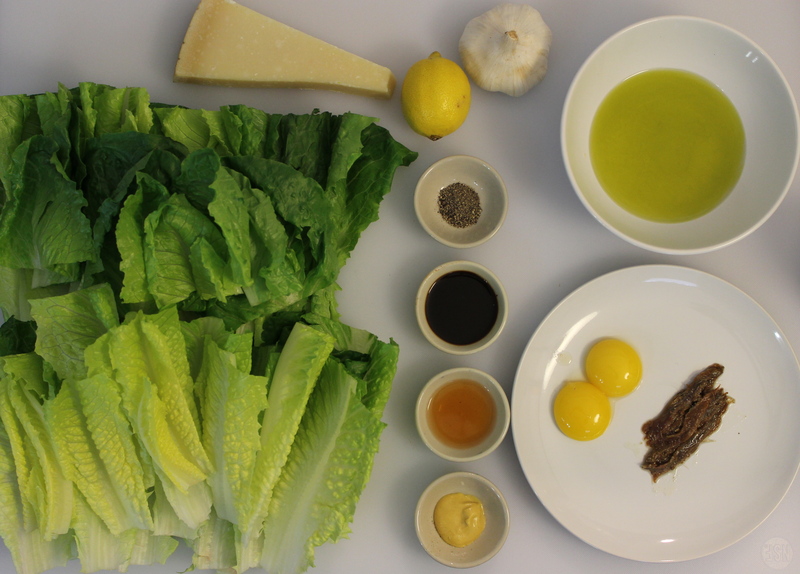 The most common proteins served with Caesar Salad are grilled chicken or shrimp. However, this does go with almost anything. Or, alone. 1. Make the croutons: Preheat the oven to 250F. Line a large baking sheet with foil and lightly coat with pan spray or line with parchment paper. Set aside. 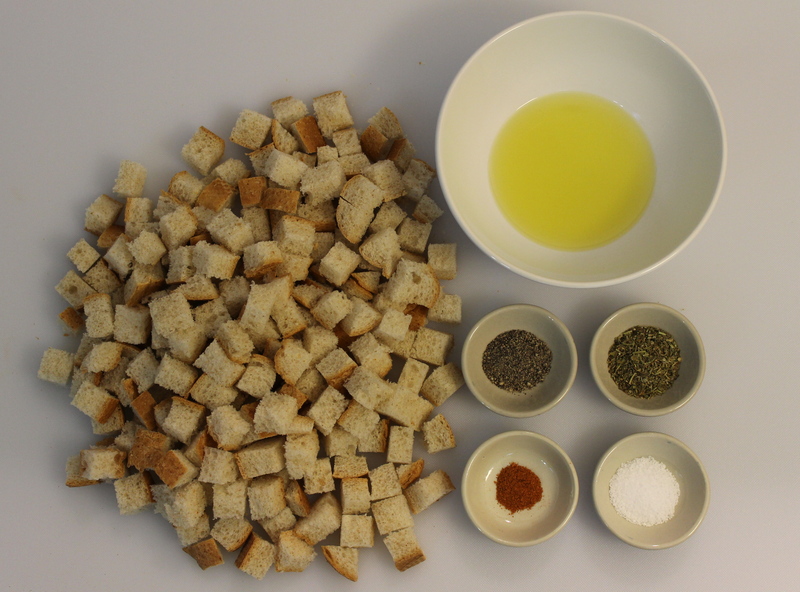 In a large bowl, toss the bread cubes with the oil, salt & pepper, and whatever other seasonings you like. Spread the cubes out in an even layer on the baking sheet and place in the oven. 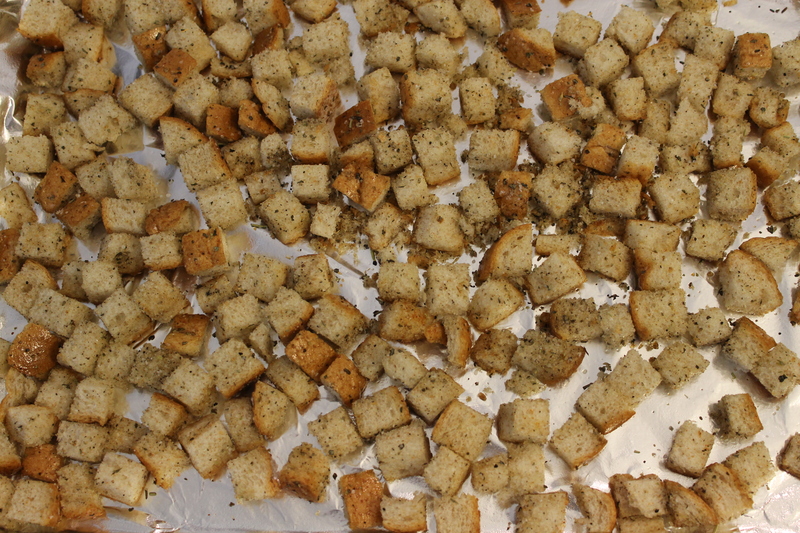 Croutons ready for the oven. 2. Bake them for one hour, or until they are dried and crispy. Set aside and let cool. The finished croutons. Easy, right? 3. Meanwhile, make the dressing: Have a blender or food processor running. 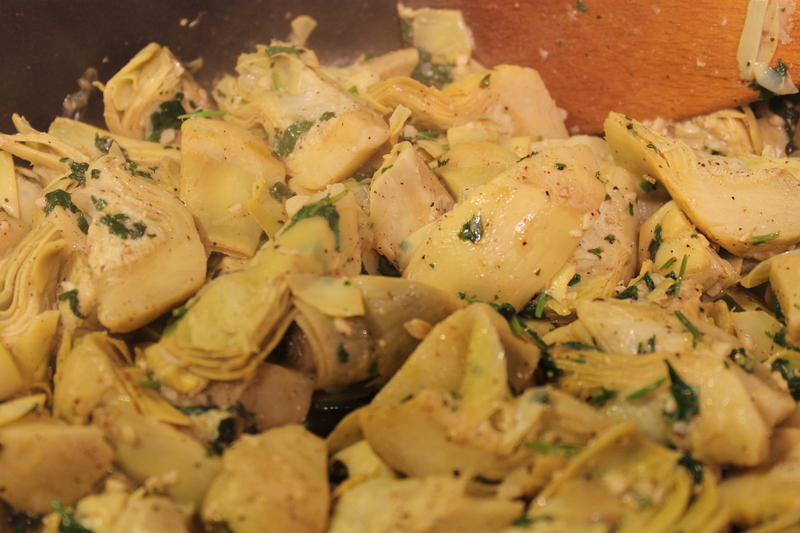 Drop in the garlic and anchovies and let them chop. 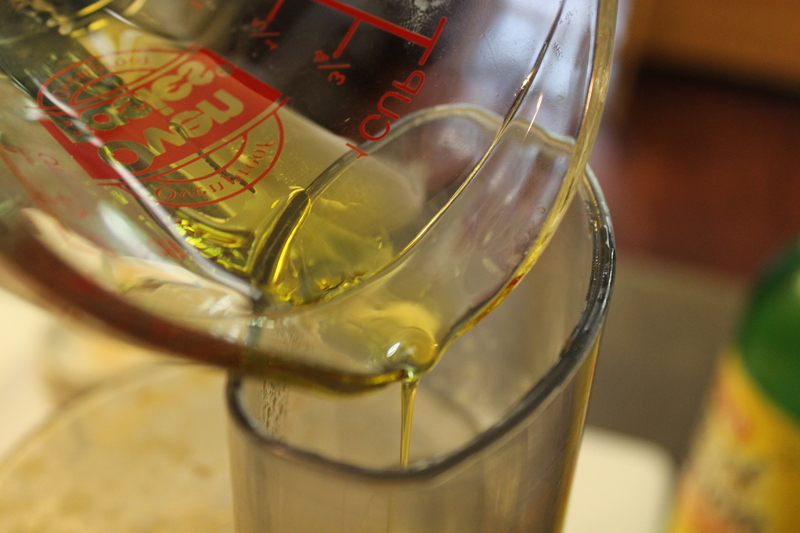 Turn off the blender or processor and add all of the other ingredients, except the oil. Blend or process until all the ingredients are incorporated. Adding the oil. Be sure to do this in a slow, steady stream. 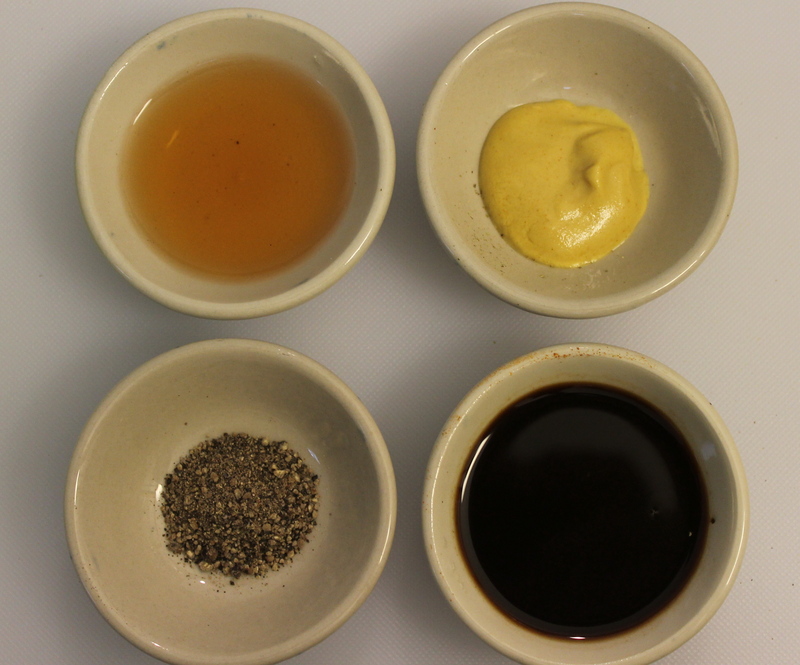 When you’re done processing/blending the dressing, taste it for seasoning. It will be thick. 5. Place a couple of big handfuls of the lettuce in a large bowl. 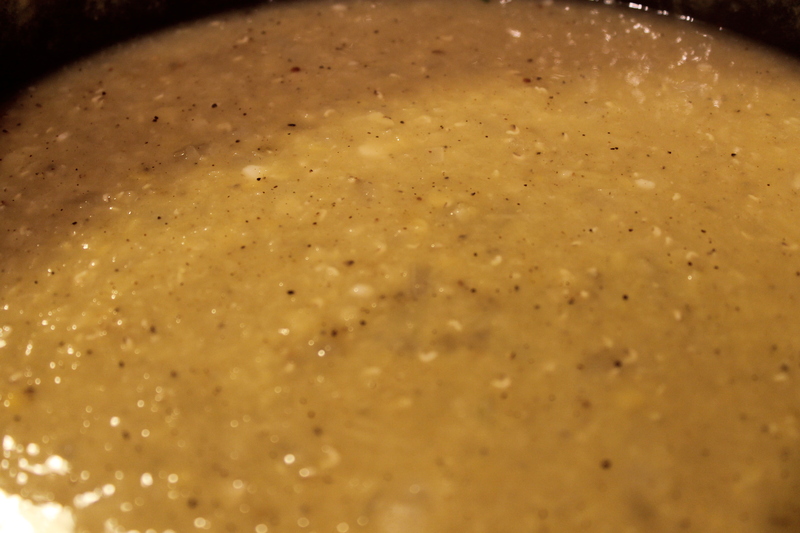 Drizzle over about a tablespoon or two of the dressing and toss until the leaves are lightly coated. (You don’t want the leaves soggy, just lightly coated.) Place the lettuce on a plate and add some of the cheese and croutons on top. Some people also like to sprinkle on some additional black pepper as well. Have a bowl of the dressing on the side in case anyone wants more. The dressing will last 3 – 4 days in the refrigerator if you use eggs and up to 1 week if you use mayonnaise. The croutons will keep a week in an airtight container. Tabouleh (or Tabooly, Tabouley, Tabouly, Tabboole, Tabbouleh) is one of those ubiquitous Arabic dishes that has entered the Western diet along with Shish Kebabs, Baba Ghannouj, Hummous, and pita bread. Few people really give any of these dishes much thought about where they originated, but what they do know is with the ever-popular Mediterranean Diet, these dishes have become almost de rigeur to the Western palate. 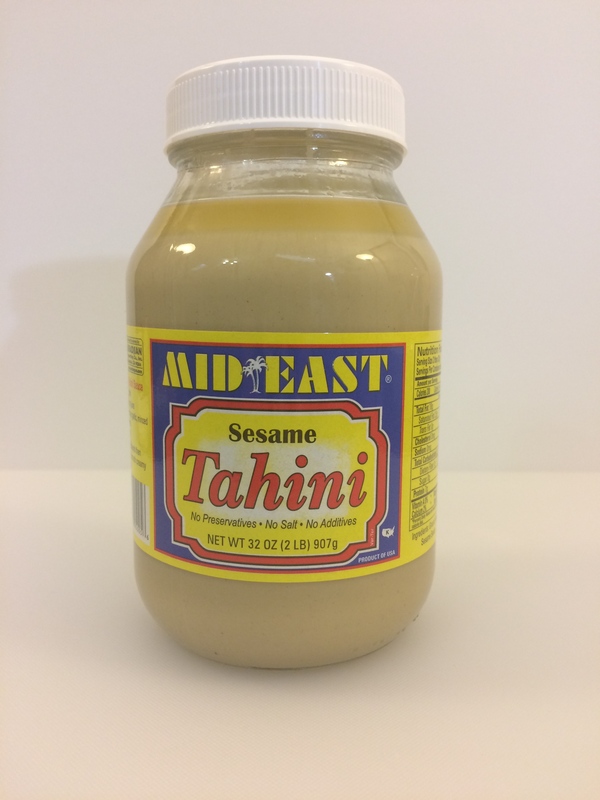 Tabouley did originate in the Middle East, namely Syria, and has been eaten since at least the Middle Ages (and quite likely further back than that). 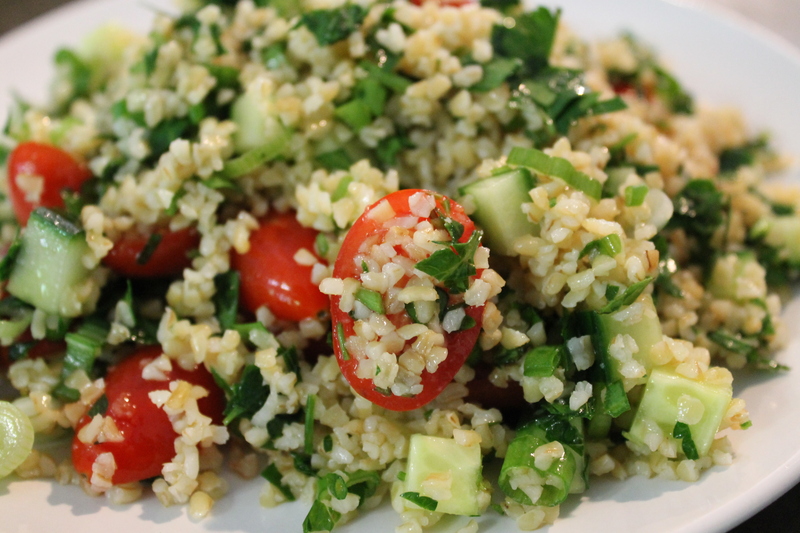 The word tabouleh comes from the Arabic word taabil (توابل) meaning “seasoning”. There are, of course, regional variations. 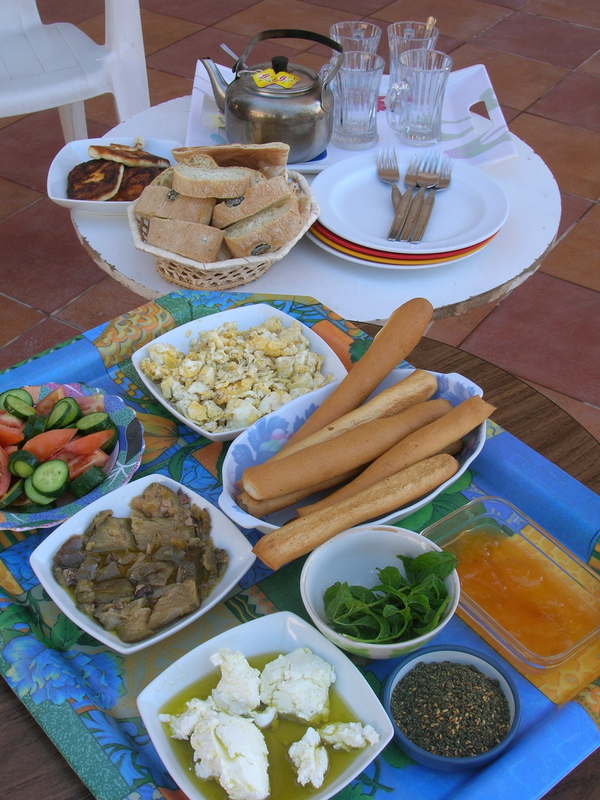 In Iraq, Syria, Jordan, Lebanon, and Palestine, it is usually served as part of a meze (appetizer), with romaine lettuce. 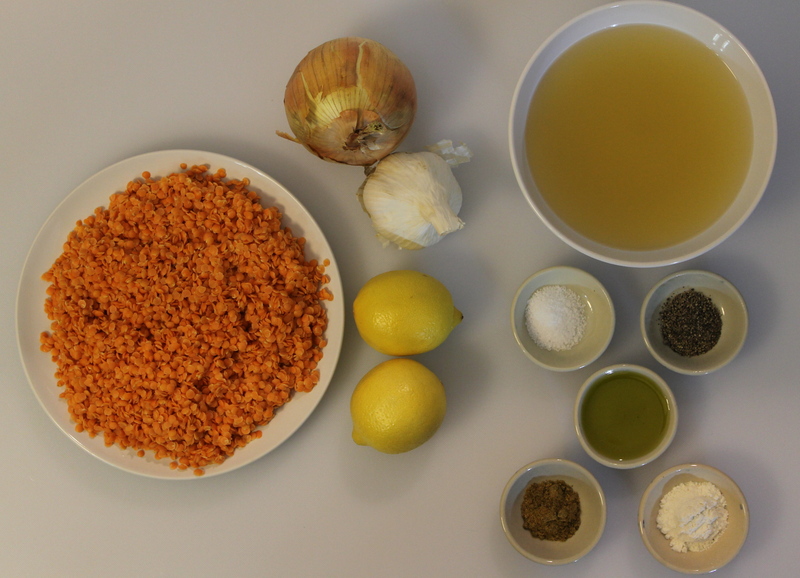 In Lebanon, cooks use more parsley than bulgur wheat in their dish. 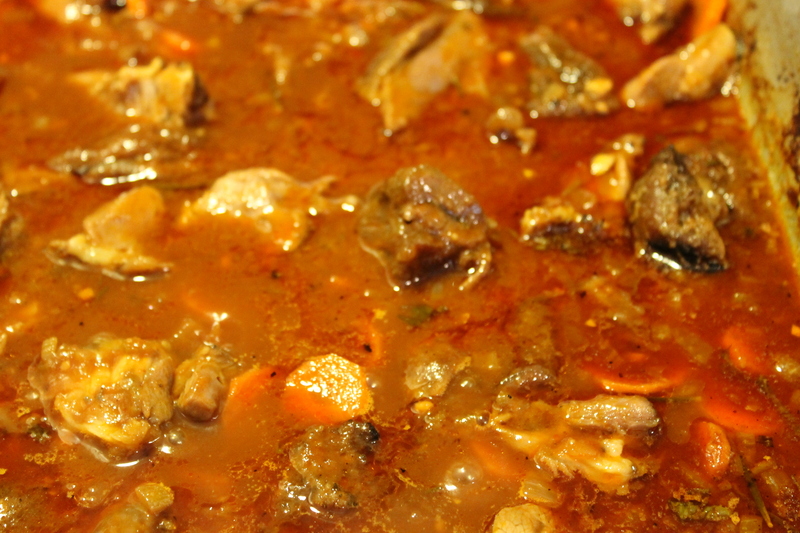 A Turkish variation of the dish is known as kısır, while a similar Armenian dish is known as eetch. For me, I like to stick to the classic preparation, with the inclusion of garlic. 1. If you use cucumber, use either English (hothouse) or Persian cucumbers. They have a lower water content and fewer seeds. Plus, they don’t need peeling. However, if you must use the standard cucumber, you will need to peel them (the skin is tough and usually waxed) and scoop out the seeds. I cut mine into a roughly 1/4-inch dice. 2. Tomatoes will need to be seeded and diced. Unless you’re using cherry tomatoes. Just cut them in halves and don’t worry about seeding them. 3. 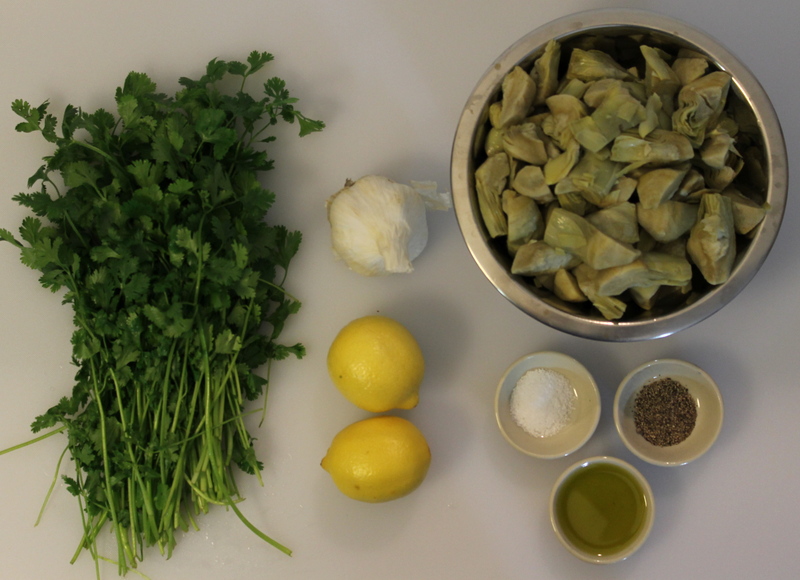 The traditional parsley used in tabouleh (or any Arabic dish, for that matter) is curly. However, if you have flat-leaf (Italian), that’s fine. I happened to already have some on hand, so that’s what I used here. 4. If you use green onions (scallions), use both the green and white parts. 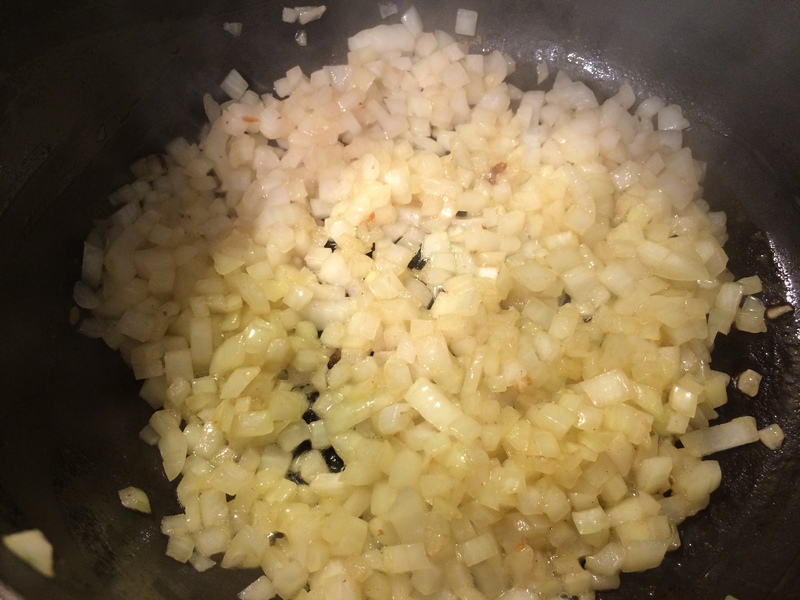 If you use yellow onion, use a fine mince. 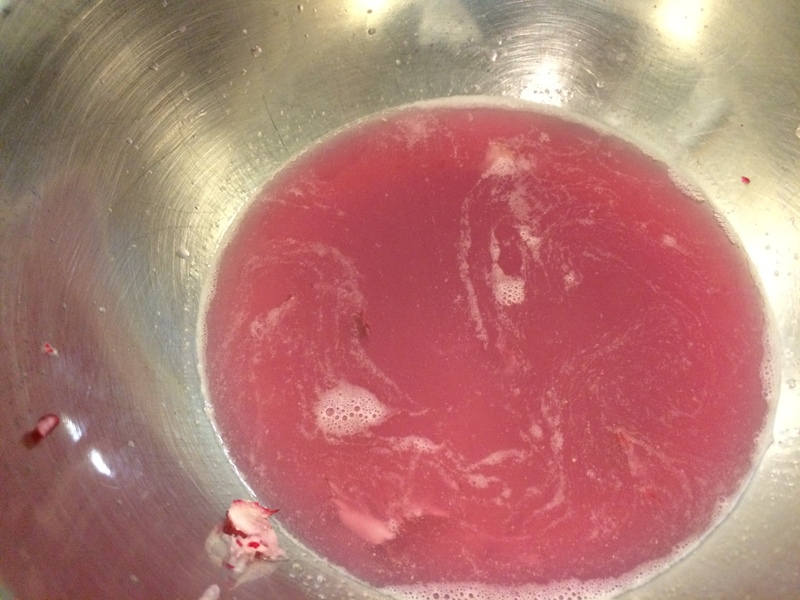 Don’t use red onion – the color will leach out. 5. 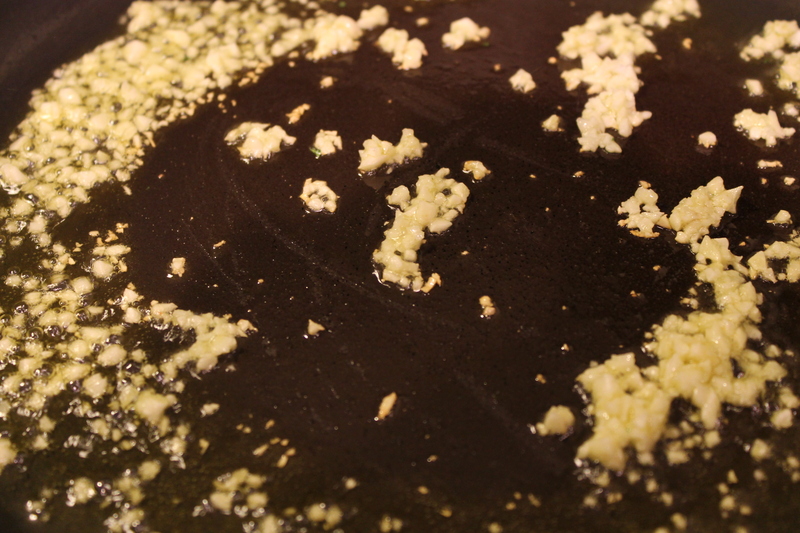 If you use garlic, make sure it is finely minced. And, remember, raw garlic is powerful stuff. Begin by using less than you think you should use. Once the salad is finished, taste. You want the garlic to compliment, not overpower. Remember, you can always add, but you can’t take away. The same can be said for any of the seasonings. I don’t include any measurements in this recipe because, like I said before, there are no true hard-and-fast rules. 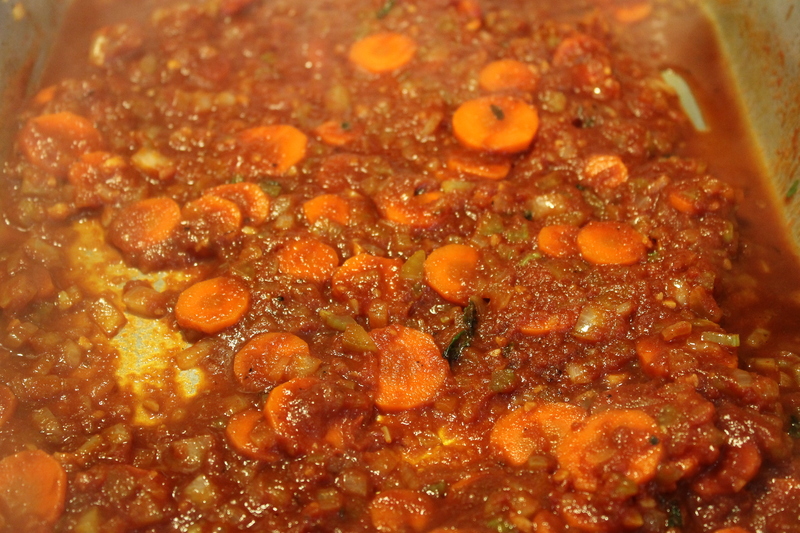 That being said, The ratio I prefer of bulgur-to-vegetables is about 1 cup (soaked) bulghur to 2 cups vegetables. As for the bulghur, I like to use is a medium-coarse grind. I prefer the chewiness of it, which is especially nice after the tabouleh has been sitting for a while, like overnight. 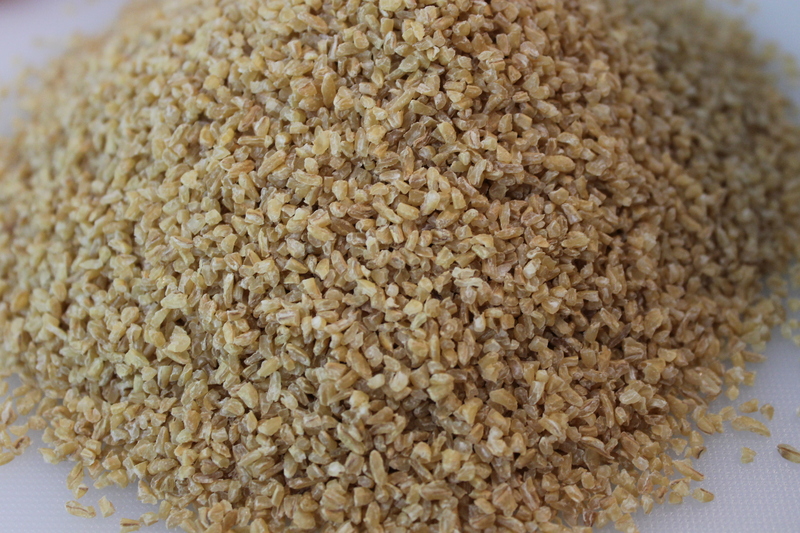 Bulgher Wheat. It’s basically wheat that has been parboiled, dried, then cracked. It’s also known as “cracked wheat”. You will need to wash and soak the bulghur before adding it to the vegetables. There is a lot of dust left on the bulghur during the manufacturing and packaging. The best way to accomplish this is to place the bulghur in a fine sieve (or a colander lined with cheesecloth) and run it under cold water until the water runs clear. Once you have rinsed it, transfer the bulghur to a large bowl and cover with water (about 1″ above the surface of the wheat). 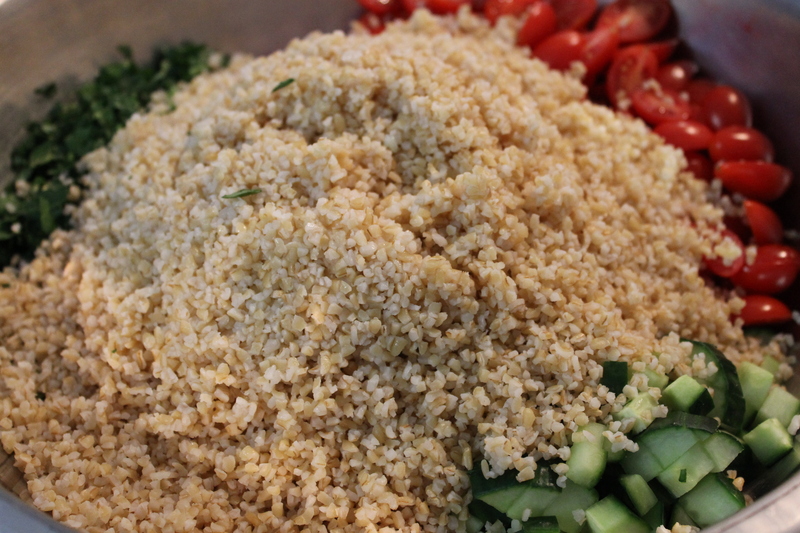 Let the bulghur sit for at least 20 minutes (depending on the grind) or until it is al dente. The wheat will increase in volume by 50% – 100%, again, depending on the grind. While the wheat is soaking, prepare the vegetables & herbs and place them in a bowl large enough for you to mix in when all the ingredients are ready. The vegetables and herbs ready to go. When the wheat is ready (taste some to be sure it’s to your liking), drain it thoroughly in a fine sieve or colander lined with cheesecloth. There shouldn’t be too much water left. If there is very little water, you can simply squeeze the bulgher in your hands and add it to the vegetables. Adding the bulghur to the vegetables and herbs. 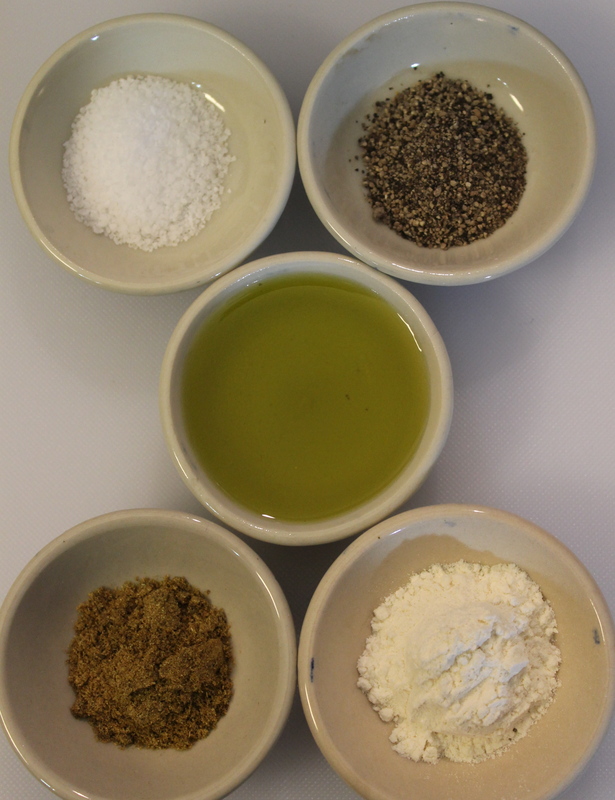 Now, carefully mix together all of the ingredients until they are fully incorporated. Add the olive oil, lemon, and salt to taste. Mix again. Taste again. 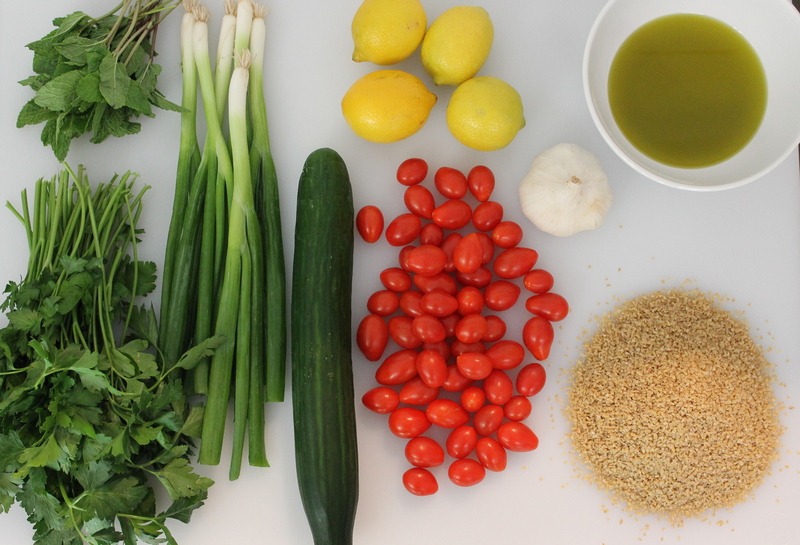 If you can, let the tabouleh sit for at least 30 minutes before serving. The real beauty of this dish is it can be served with anything or alone. It can be served cold or at room temperature. And, anyone can eat it – omnivore and vegan alike. It will keep in the refrigerator for 3- 4 days. This time of year provides the perfect excuse to break out some of the recipes that I would never make the rest of the year. Which, in central Texas, means that I have only about 3 months to indulge in some of my favorite comfort foods. Ossobuco is one of them. 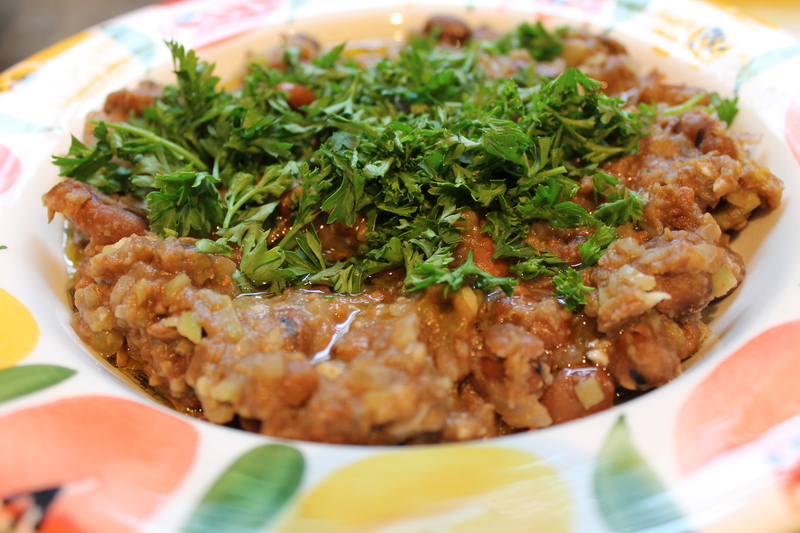 With the rich lamb, sauce, and risotto, it’s a wonderful accompaniment to a cold night. The name literally means “bone with a hole” (osso – bone; buco – hole). Ossobuco is a dish (legendarily) created in the Milano area in northern Italy in the 19th century. Some say it was created by local farmers as a way to cook tougher cuts of meat (i.e. 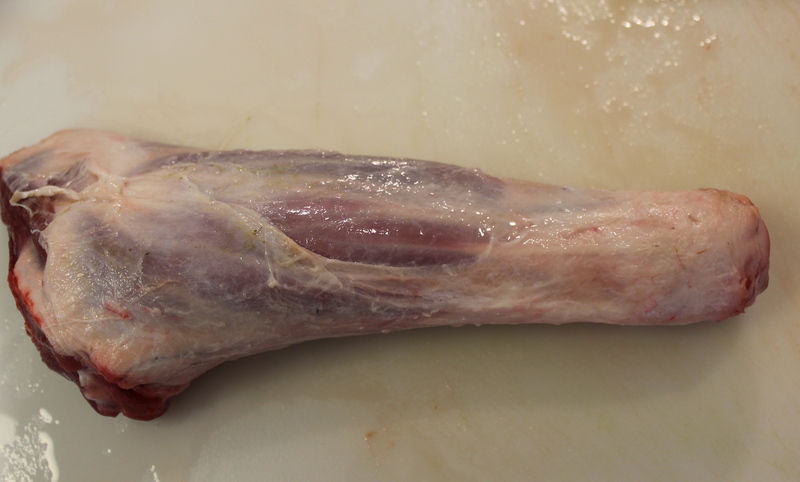 shanks – the shin portion of the leg. 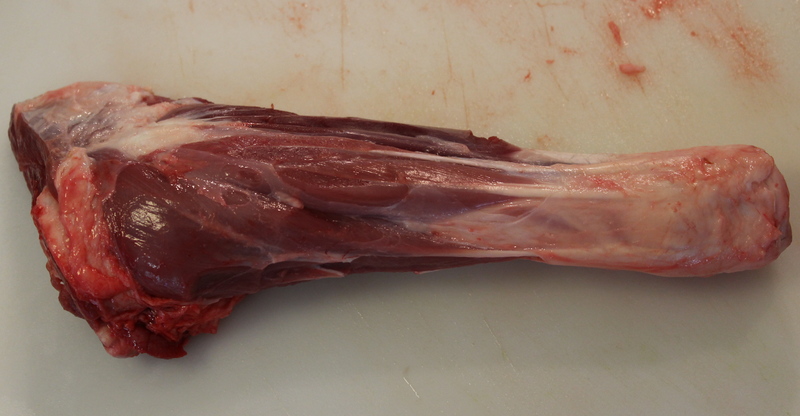 The fore shank is the bottom part of the shin; the hind shnk the upper part of the shin. ); others, it was created in an osteria. 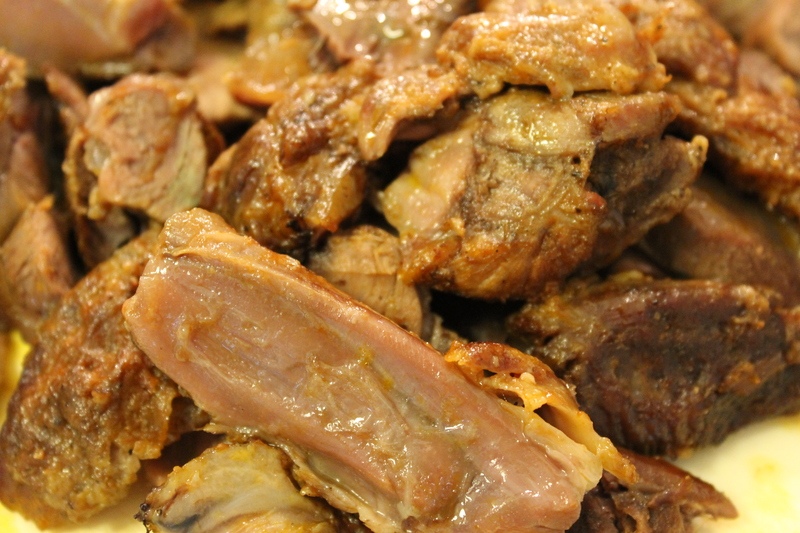 The original recipe is made with veal shanks, cinnamon, and bay leaves with no tomato. The more modern and more popular version is made with tomatoes, vegetables, and red wine. 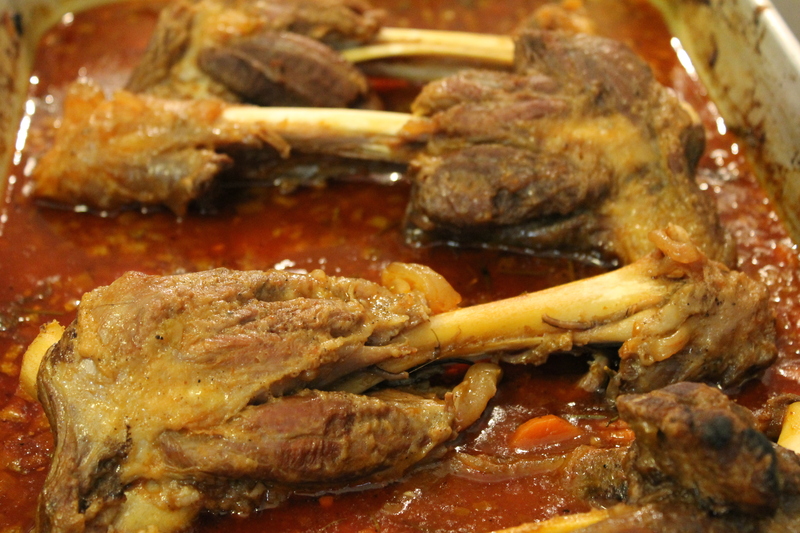 And, while veal shank is still used widely, lamb shank is gaining in popularity. As for myself, I prefer the lamb shanks. I find they have far more flavor. And, if you can get hind shanks, more meat for the money. 1. In this example, I’m using fore shanks. The butcher I bought these from didn’t have hind shanks that day. But, they were large and worked well in this dish. Also, I bought these still in the cryovac packaging. The butcher had received them from the farm that morning and they hadn’t been fully trimmed yet. 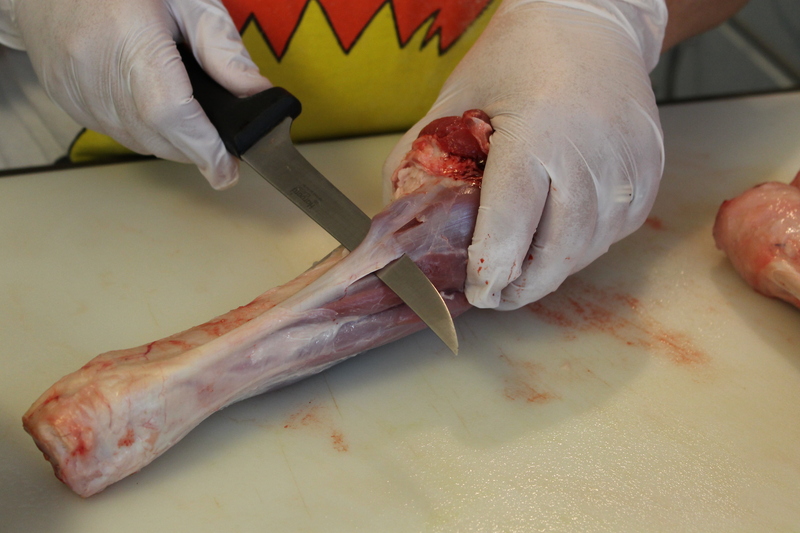 More than likely, the shanks you buy will be already trimmed and ready to go. 2. If you prefer not to use wine, then you can omit it all together. As substitutions for red wine you can use extra stock for deglazing (you can add 1 tablespoon red wine or balsamic vinegar per 1 cup of stock for tartness), or 100% cranberry or pomegranate juice; for white wine, you can use extra chicken or vegetable stock (you can add 1 tablespoon lemon juice or white wine vinegar to 1 cup of stock for tartness), verjus (a juice made from unripe green grapes), or unsweetened apple cider or juice. 3. 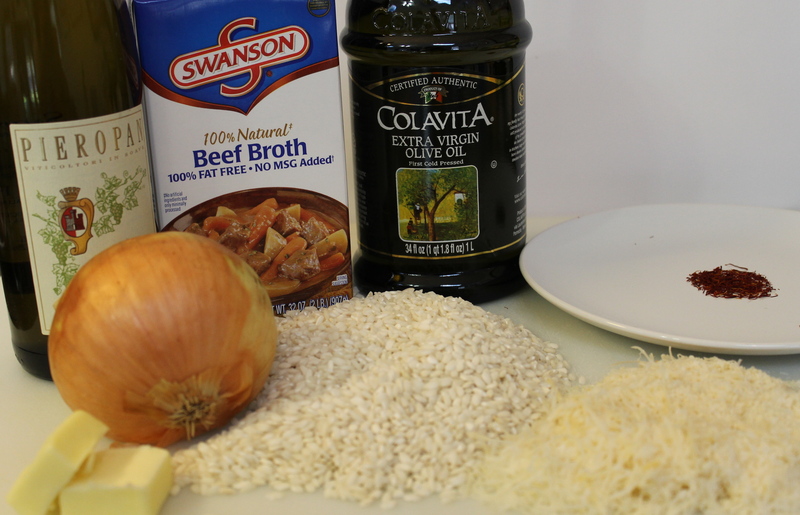 The traditional accompaniment for this dish is risotto. However, of you prefer, you can also serve this with polenta, mashed potatoes, or pasta. If you do use pasta, use a shaped pasta (such as campenelle or rotini) or a wide pasta (such as paprdelle or bucatini). 4. Gremolata is served alongside the Ossobuco as a way to cut through the richness of the dish. 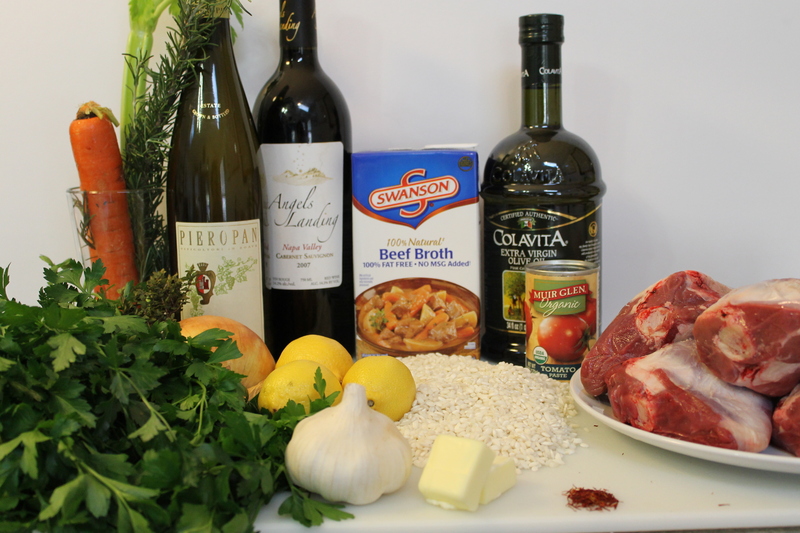 The ingredients for the Ossobuco. Lamb shank fresh from the farm. If you can get hind shanks, do so. These fore shanks were great. I just had to clean them. Cleaning the lamb shank. You must remove the silverskin (or have your butcher do it). It doesn’t cook down and your meat will be chewy and tough. The cleaned lamb shank. Admittedly not perfect, but a whole lot better. 1. Preheat the oven to 350F. 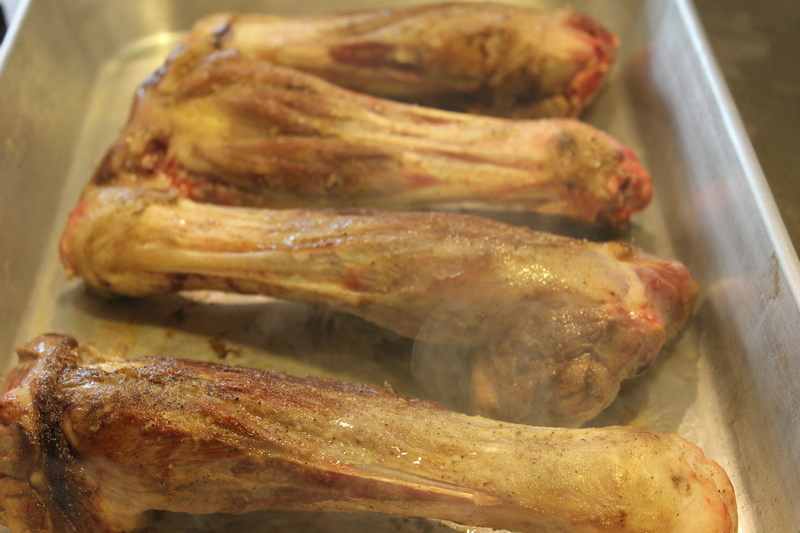 Lightly sprinkle salt on the lamb shanks. Then, lightly flour the them, shaking off any excess flour. Set aside. 2. In a large Dutch oven or a deep, stove-proof casserole dish, heat the olive oil over medium-high heat. Add the lamb shanks and sear until browned. Cook the them in batches if needed. Remove the shanks from the heat and set aside. Browning the shanks. Do this in batches if you need to; don’t crowd the pan or the shanks will steam and not brown. 3. Reduce the heat to medium. 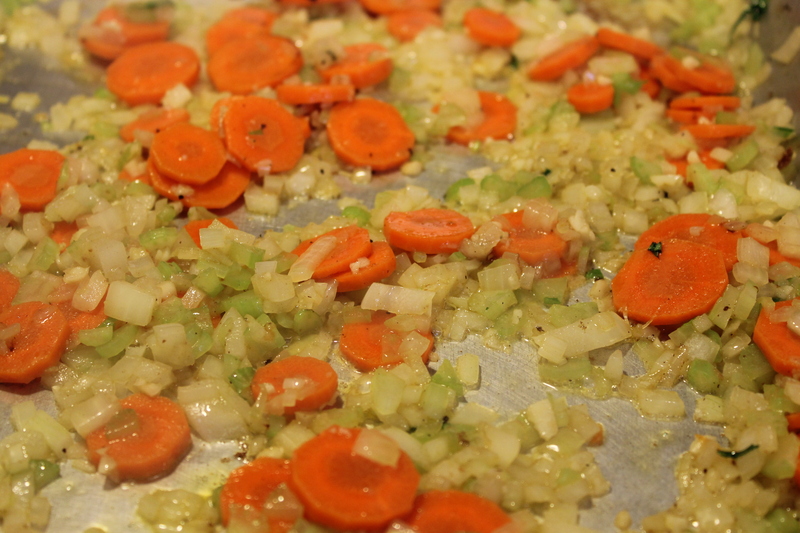 Add the vegetables and garlic and saute until the vegetables are slightly softened, about 5 minutes. 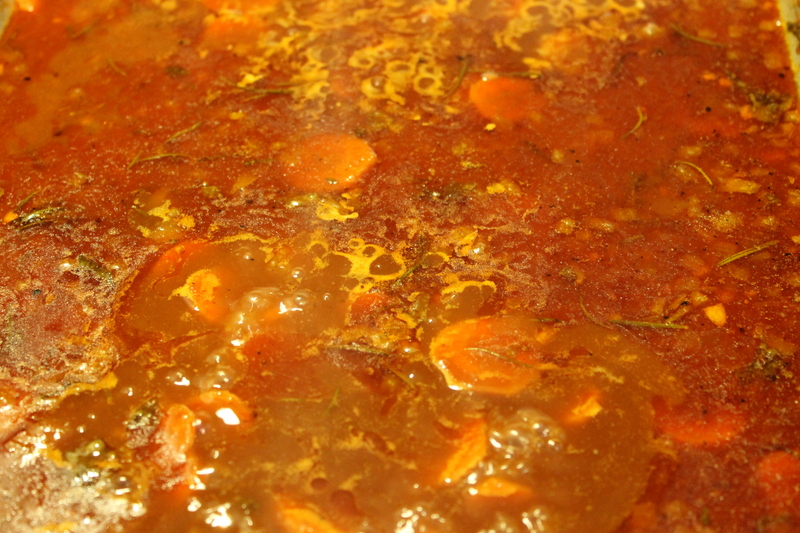 Add in the tomato paste and cook another 3 – 4 minutes. Adding the tomato paste. 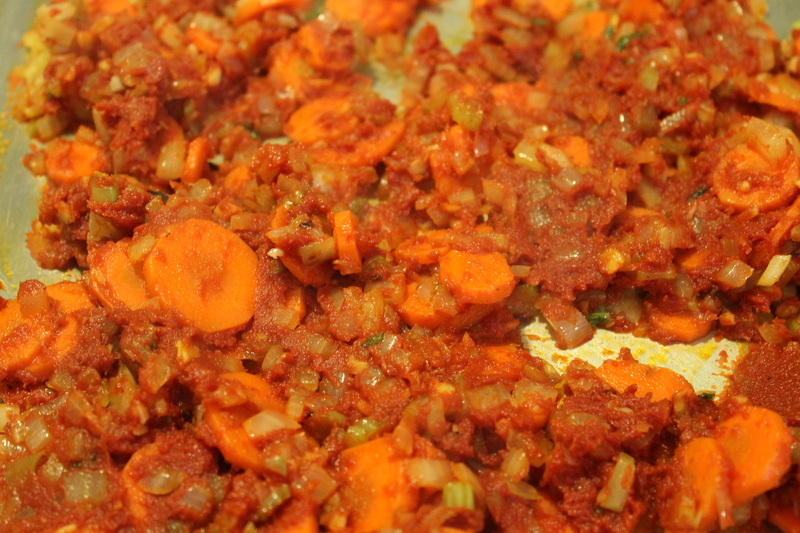 Let the paste cook until it begins to turn a burnt orange color. This is the sugar caramelizing and helps to deepen the flavor. Add in the red wine to deglaze the pan and cook another 5 – 7 minutes to reduce the wine and soften the flavor. Then, add the rosemary, thyme, lemon zest, and 1 teaspoon each salt and pepper. Simmer another 2 – 3 minutes. Adding the lemon zest, rosemary, and thyme. 4. Lay the reserved shanks on top of the vegetables and add just enough broth to come halfway up the shanks. Cover the casserole or Dutch oven and place in the oven. Cook for 2 to 2-1/2 hours (flipping the meat halfway through) or until the meat is tender. Check for liquid content, adding more if needed. 5. After you take the baking dish out of the oven, remove the shanks and set aside. So tender, it’s falling off the bone. If you like, set the baking dish on the stove over medium-high heat to reduce the sauce. Remove the rosemary and thyme stalks and discard. I like to reduce the sauce a bit to concentrate the flavor. It’s up to you, however. 6. 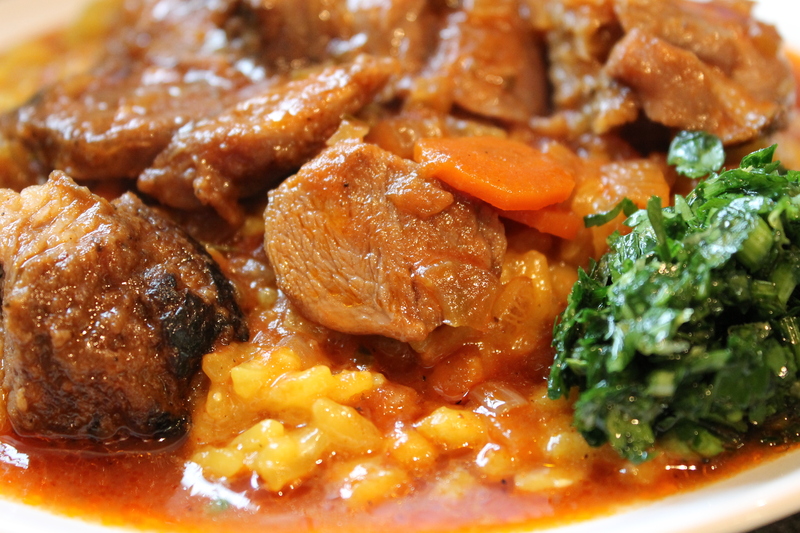 Traditionally, the shank is served whole with the risotto and Gremolata. 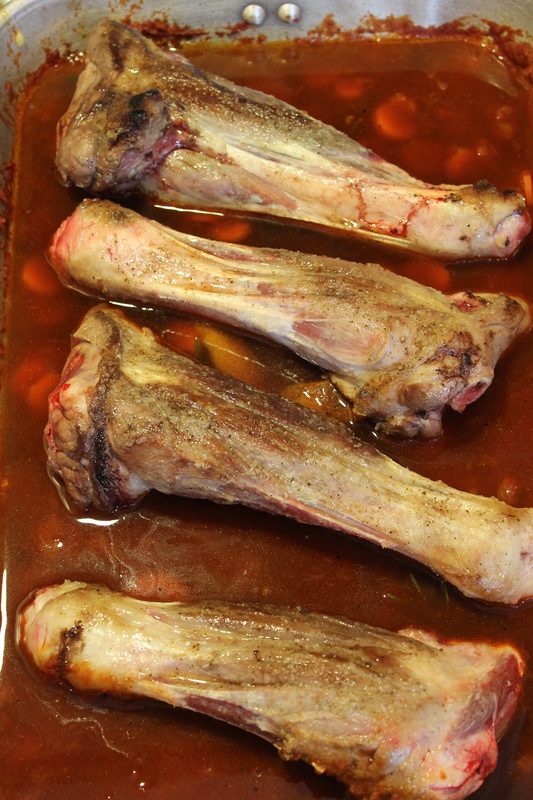 However, if you prefer (and I do if I use fore shanks), trim the meat off the bone and mix it back into the sauce; then serve with the Risotto and Gremolata. The meat trimmed off the bone. I prefer to do this if I use fore shanks. The meat back in the sauce. You can do this if you want to help stretch the meat. I like to do it when I use fore shanks. Saffron. The world’s most expensive spice (currently about $3000/lb.). It comes from the stamen of the Crocus flower. 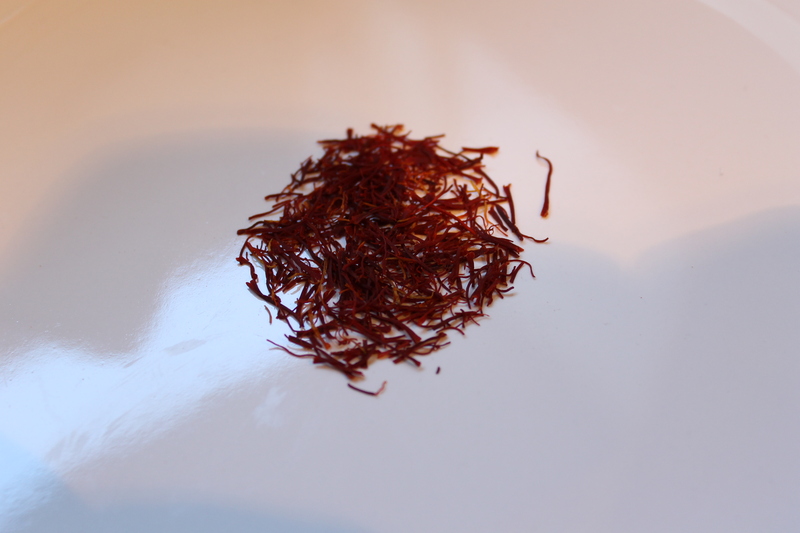 It takes approximately 50,000 – 75,000 flowers to make one pound of saffron. Be sure to buy saffron that is in it’s whole form. 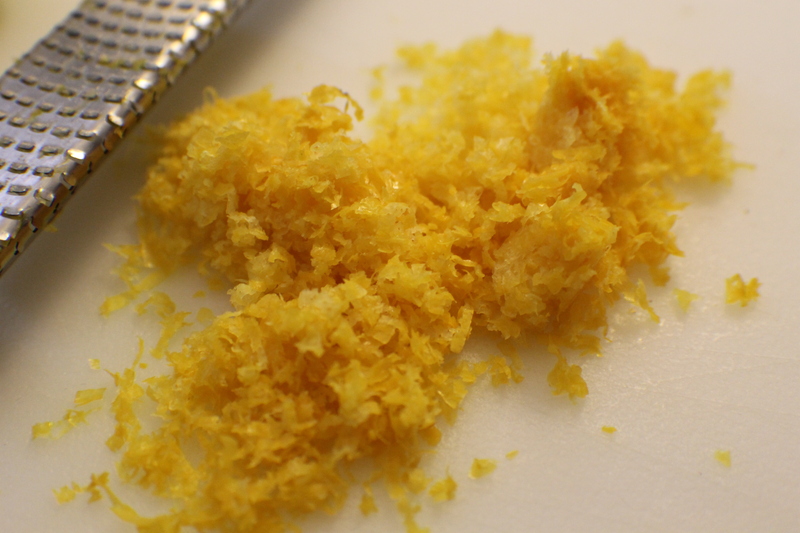 Don’t buy powdered saffron; it’s usually cut with turmeric. 1. Bring 5 cups of the stock to a boil in a medium saucepan. Reduce the heat to low and keep the stock warm. 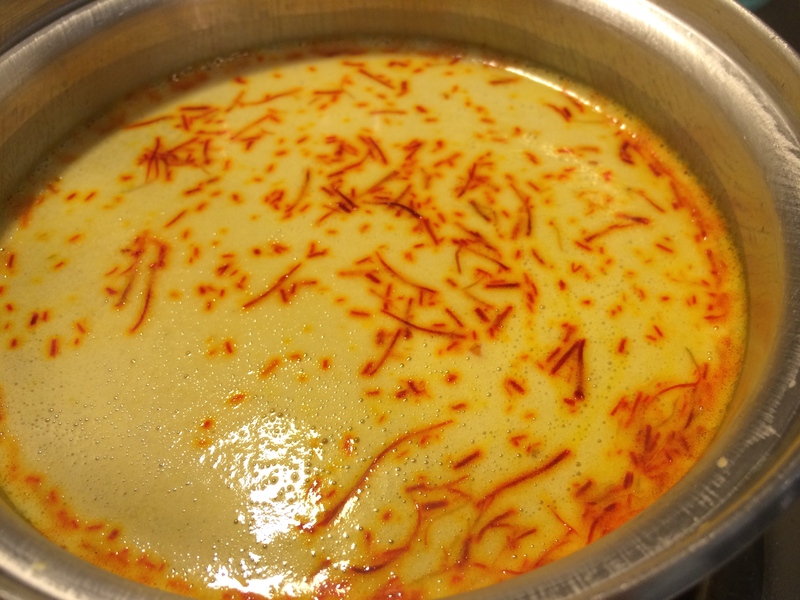 In a small saucepan heat the remaining 1 cup of stock with the saffron. Again, reduce the heat to low and keep warm. 2. In a large saucepan, heat 2 tablespoons of butter and the olive oil over medium-high heat. 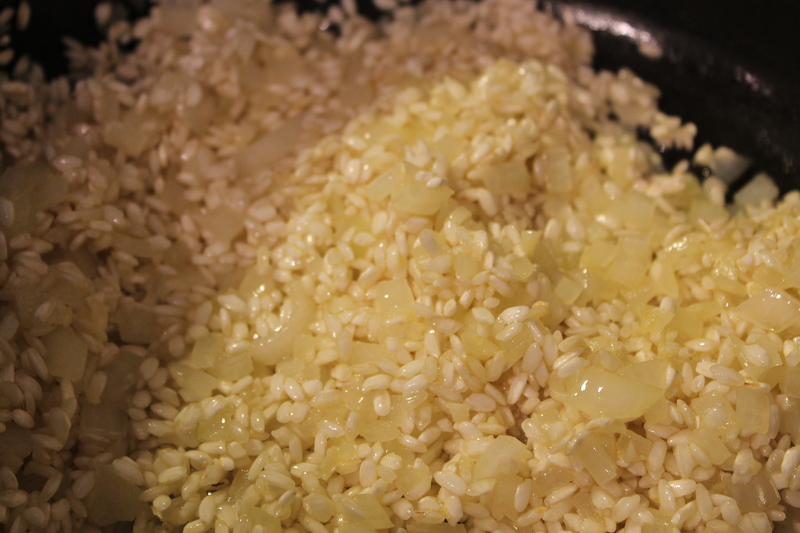 Add the onion and garlic and sauté until softened, about 5 – 7 minutes. Sauteing the onion and garlic. Add in the rice and sauté, stirring constantly, another 5 minutes. Adding the rice. This will help to flavor the rice and begin the cooking process. Add a pinch or two of salt, stir again, and add in the wine. 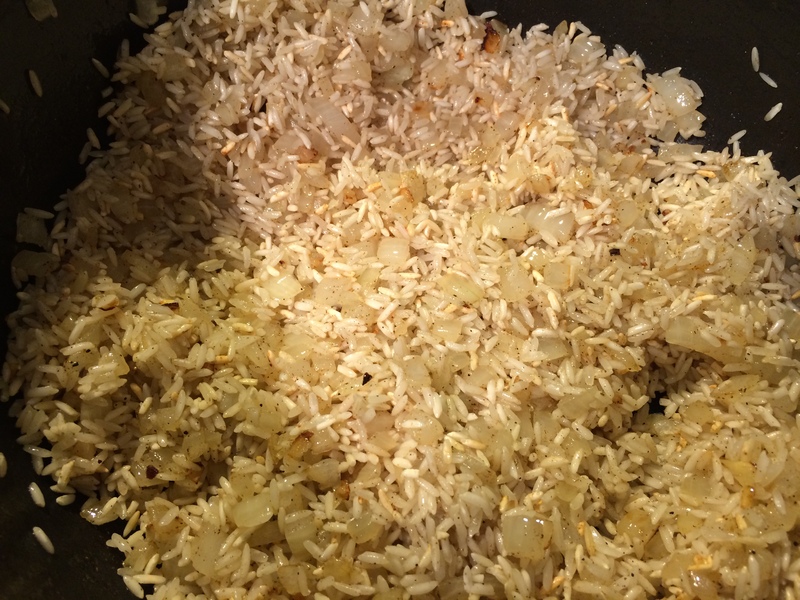 Stir constantly until the wine has been absorbed by the rice. Adding the wine. At this point, constant stirring of the rice will help to release the starch. 3. Lower the heat under the rice to medium. 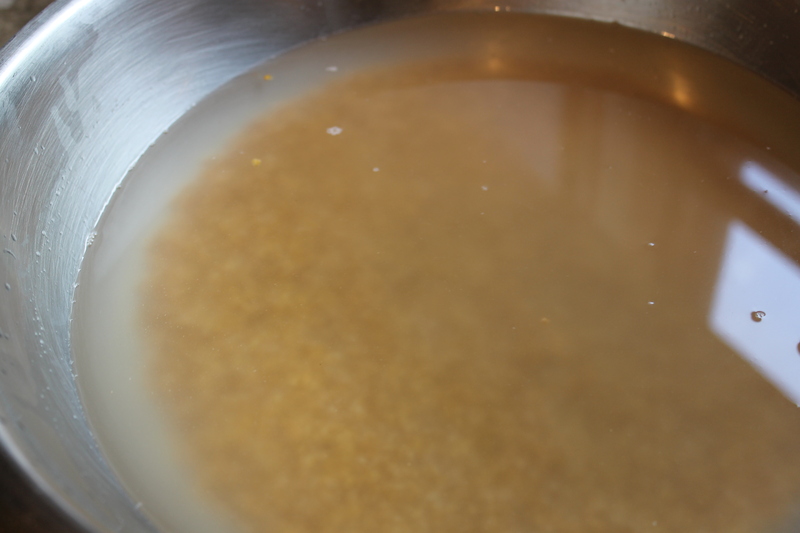 Begin adding the 5 cups of stock, 1 cup at a time, stirring after each addition until the broth has been absorbed. Adding the broth. Be sure to constantly stir the rice. 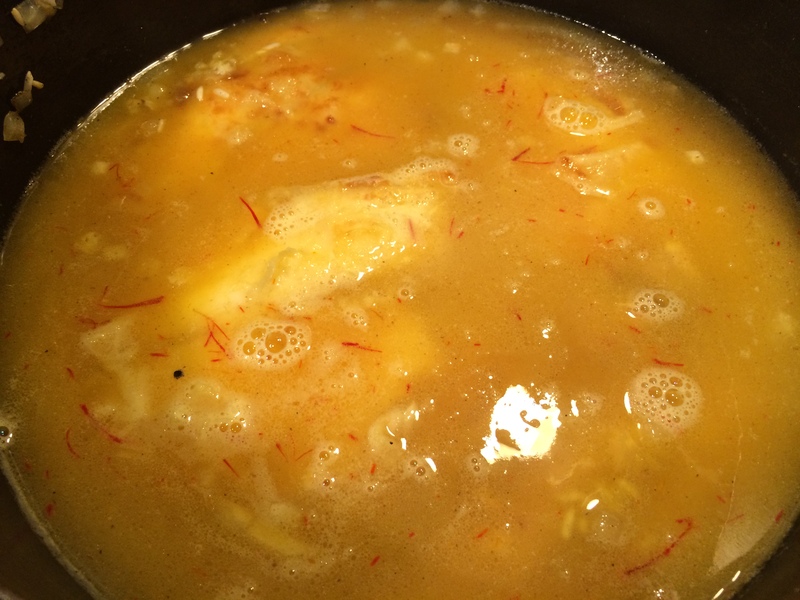 After you have added the 3rd cup of broth, add in the broth with the saffron. Continue stirring. Adding the saffron broth. 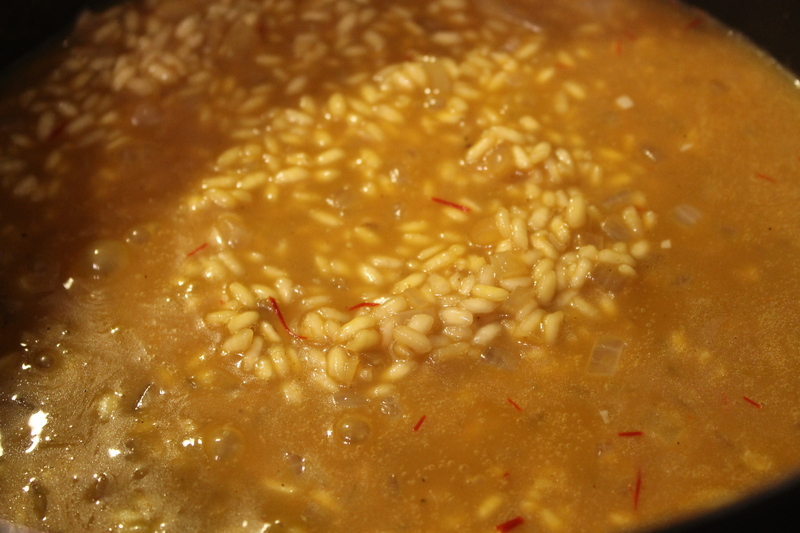 Now, the risotto will become its classic yellow color. 4. 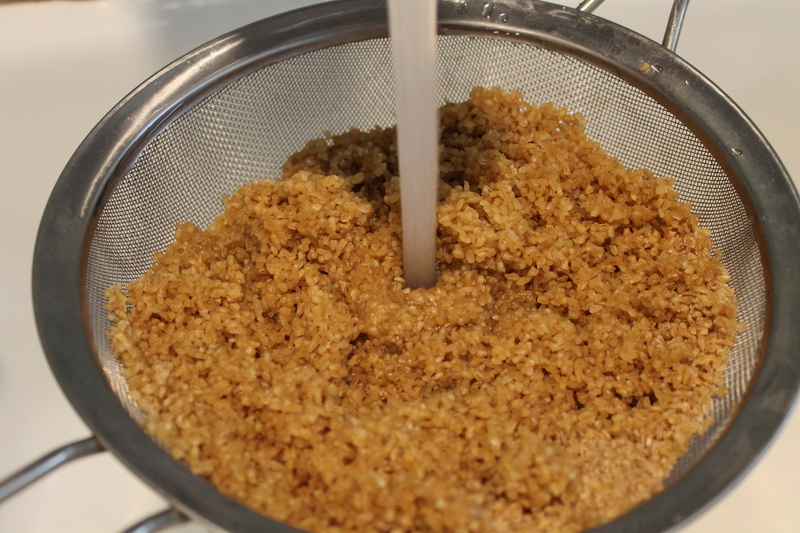 After you have added the 5th cup of stock, begin testing the rice to make sure it is al dente. You may not need all the broth. 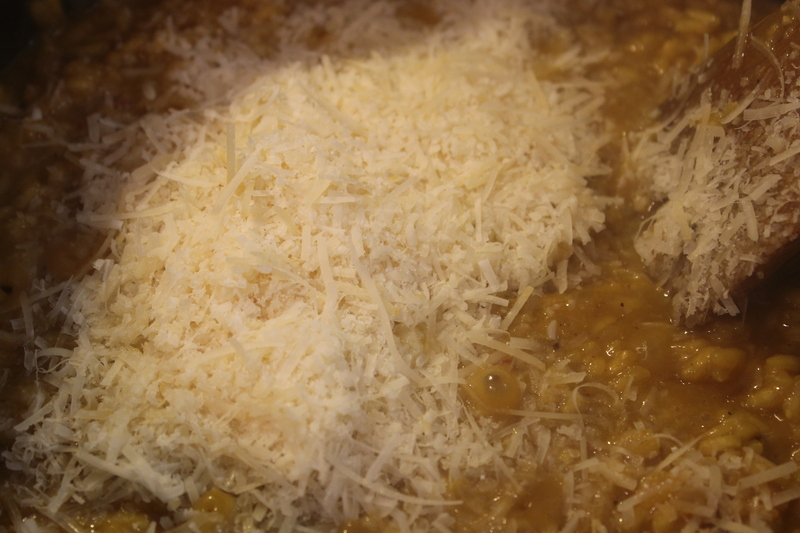 When the rice is al dente (or to your liking), add the remaining 2 tablespoons of butter and the Parmigiano. Season to taste with salt and pepper. Serve immediately. Adding the butter and parmesan. 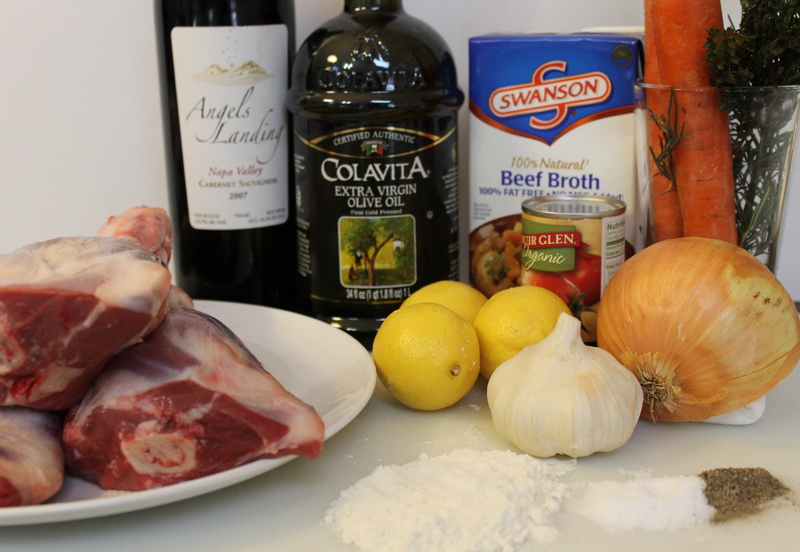 Mix all the ingredients together in a small bowl and serve along side the Ossobuco. One of the great things about having a parent, or parents, who were born and/or grew up in another country is getting to learn and experience mores, manners, customs, and, yes, food that are different than what you might experience daily in the wider world. My sisters and I grew up with just such a parent. Our father is Palestinian. He’s originally from a town called Nablus. When he was born, it was a part of western Jordan. Now it is in the Occupied West Bank under the supervision of the Palestinian Authority. Dad came to the US in 1960 to go to college. Eventually, he met and married our mom, graduated from college with an engineering degree, co-raised three girls without losing his mind, worked for the same company for 40 years, and happily retired. Along the way, Dad did impart in us some of his old-world wisdom. Or, at least tried to. And while we didn’t always appreciate the lessons he tried to teach – especially Arabic, which I’m still struggling to learn – we always appreciated the food. And while my sisters and I certainly ate with glee the kibbeh, sayadieh (fish with rice), mjudarah (lentils and rice), mishi waraq (stuffed grape leaves), and knaffeh (sweet shredded phyllo dough with cheese) our parents made (Mom and Dad each have their specialties), we especially enjoyed breakfast with unrestrained glee. Breakfast in the Middle East isn’t necessarily a rushed thing. Well, it isn’t unless one has to rush off to work or school. Breakfast usually starts about 8 or 9 with a nice long chat over coffee. Then, the food comes out. It can be as simple as some jam, bread, and cheese on up to dips, za’atar (spice mix made with thyme, sumac, sesame seeds, and salt), fresh fruit and vegetables, olives, pickles, eggs, and occasionally leftovers from the night before. Unlike in the West, coffee isn’t drunk at breakfast. 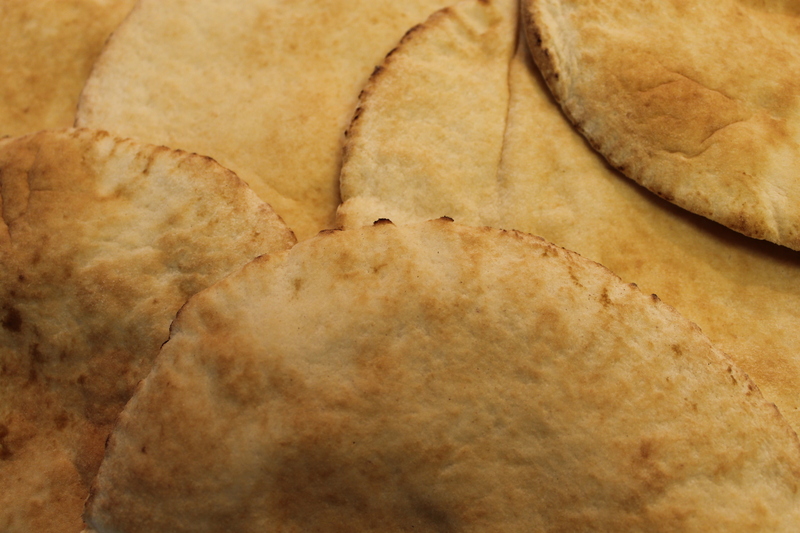 It’s used as an aperitif, digestive, at social gatherings, and with the desserts the Middle East is so famous for. Juice, water, or hot sweet tea is drunk at breakfast. 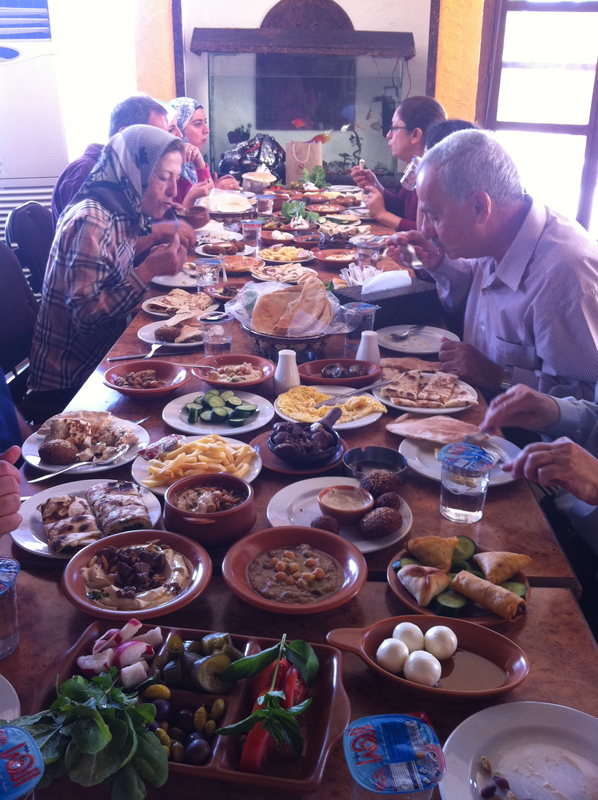 Just to make you hungrier, here’s a picture of my family at the restaurant my cousin Salam owns with her husband. Tarweea. It serves breakfast 24 hours a day. And it’s amazing. The family at Tarweea. Damn good food. And company. 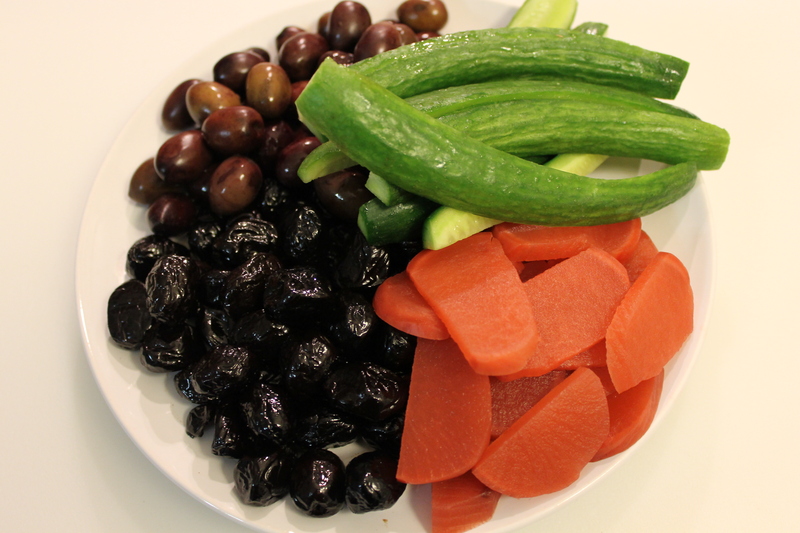 So, welcome to my version of Arabic Breakfast. The recipes I’m showing you are ubiquitous throughout the Middle East. Like anywhere else, there are regional variations for each dish. 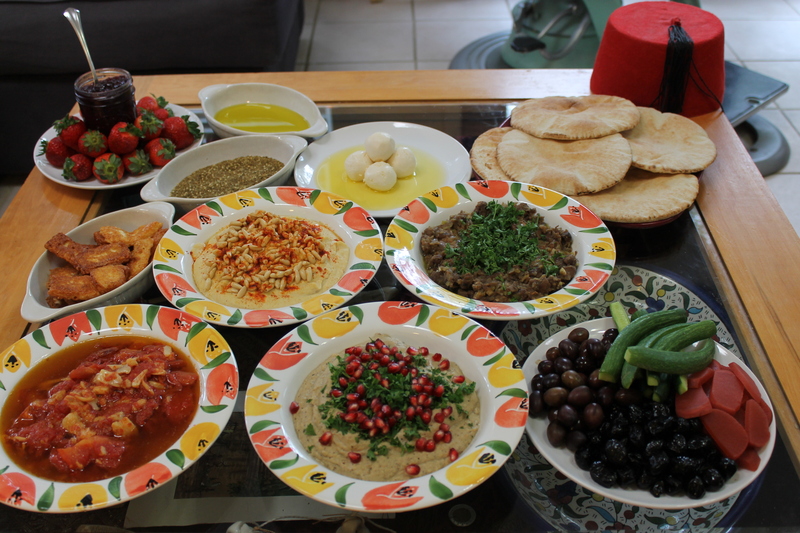 That being said, I’m going to show you the way I grew up eating these dishes and the recipes I learned Palestinian style. 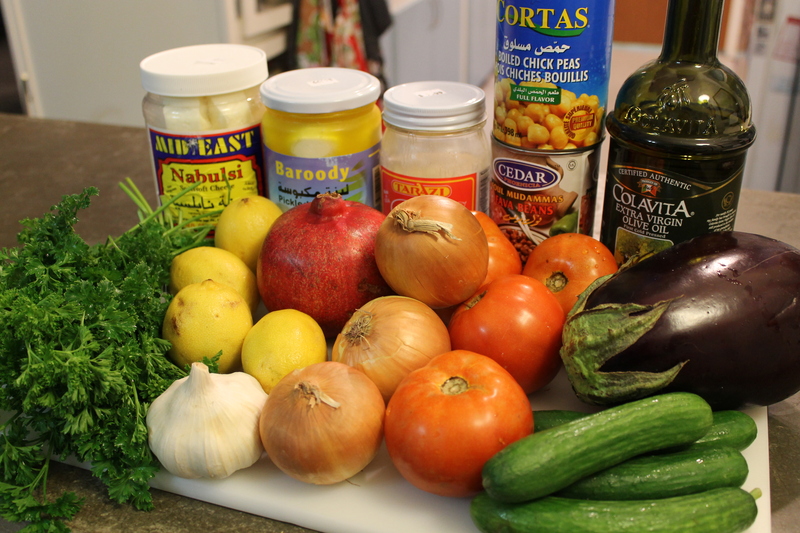 I will be making several recipes in this post: Ful Mudammas (Fava Bean Dip), Baba Ghannouj (Eggplant Dip), Tomatoes and Garlic Poached in Olive Oil (not sure if this is authentic, but my dad makes it on occasion), and Hummous (which I’ve already made for you, http://www.tartqueenskitchen.com/?cat=63). Click on the above link to get the recipe. 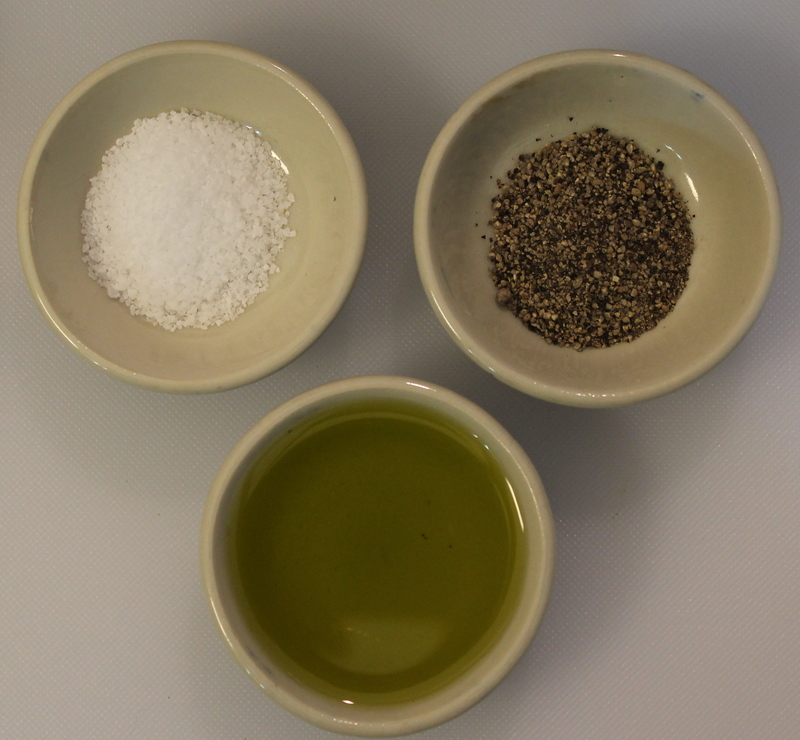 Plates of olive oil and za’atar. 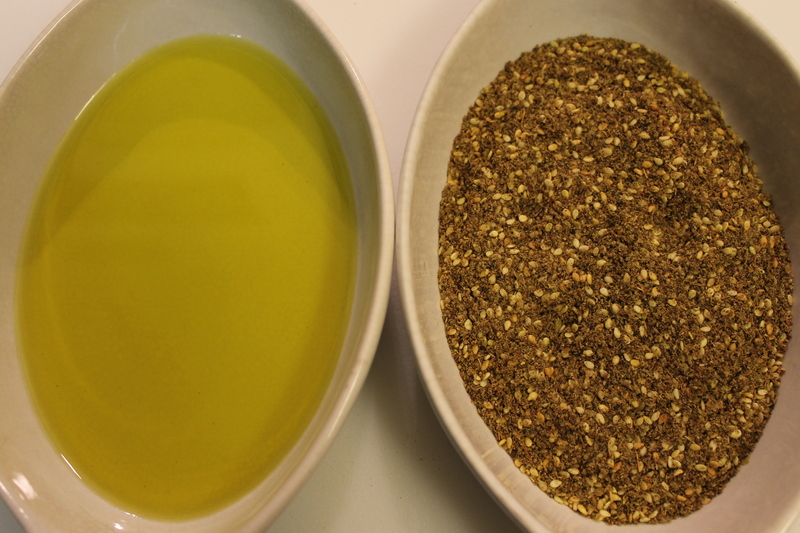 Bread is dipped in the olive oil and then the za’atar. It has a wonderful savory-slightly tart flavor. 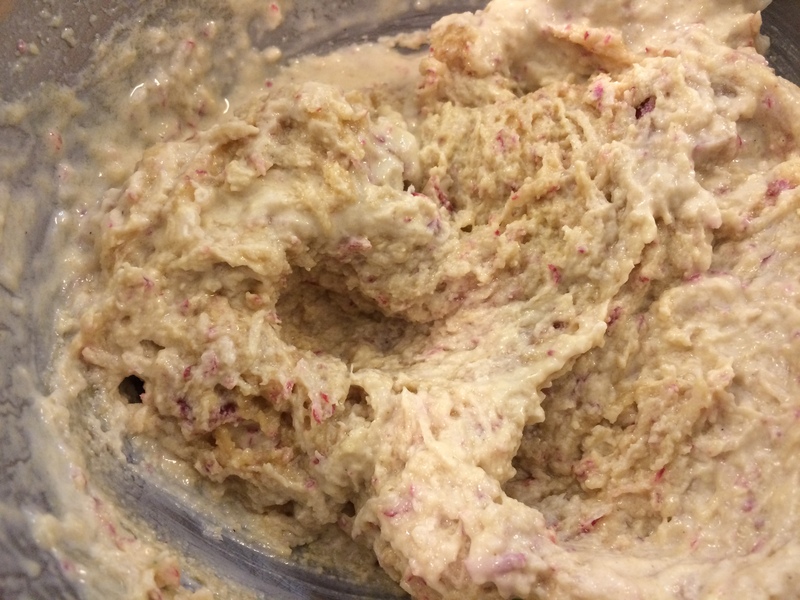 Some people will also make a paste of the two, spread it on bread and toast the bread until the top is nice and bubbly. It’s divine. 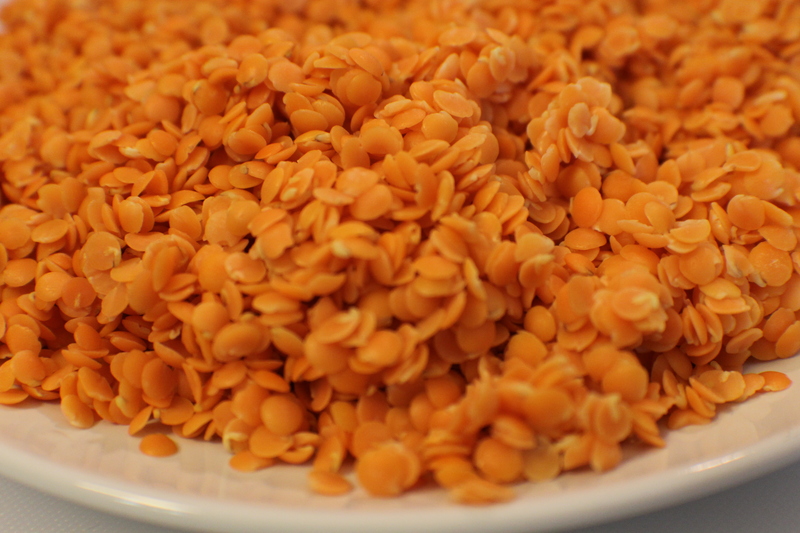 We also have some lebneh. It is essentially yogurt cheese. A lovely, delightfully slightly sour treat. Try it spread on bread with some tomato. Oh. Yeah. 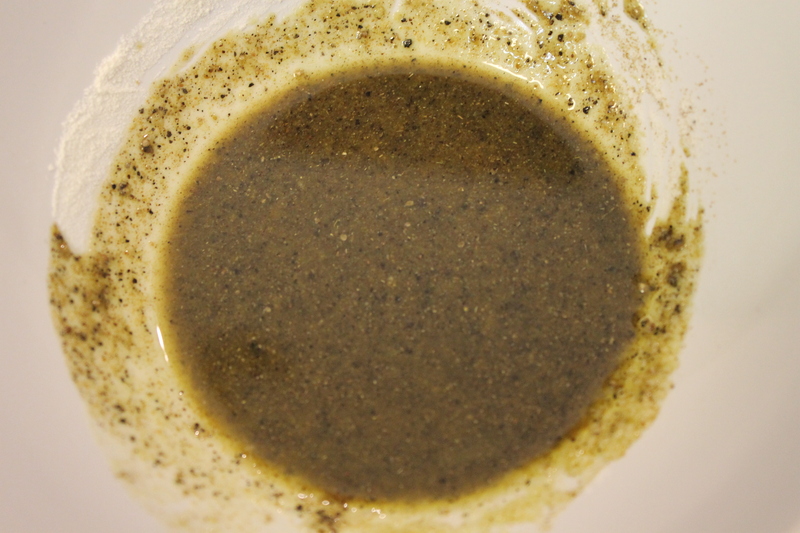 Lebneh in olive oil. This stuff is the bomb. Some farmers cheese is always essential on the table. 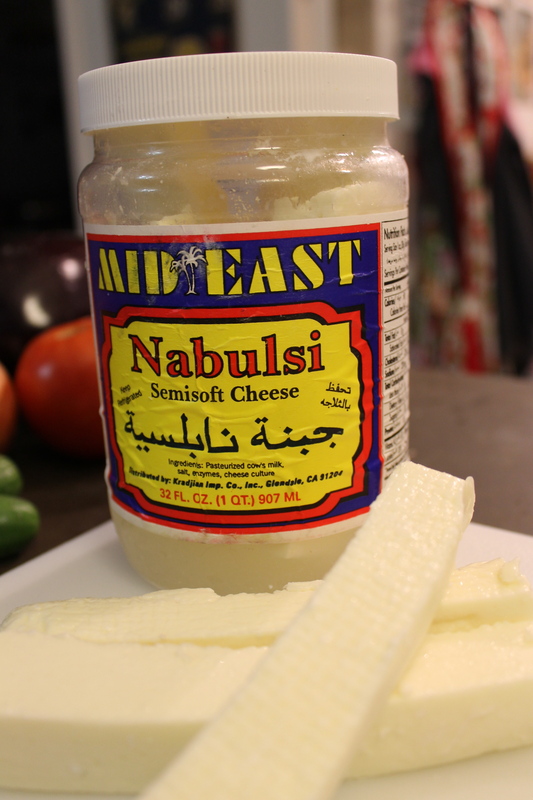 Jebne Nabulsi (Nablus Cheese) is our cheese of choice. Farmers cheese is used in both sweet and savory dishes. For sweet dishes, it’s usually boiled to remove the salt. The cheese we get in the US is always packed in brine. If you’re able to buy it in Jordan, it’s much fresher. The difference is striking. My favorite brand of Nabulsi Cheese. it’s not too salty and cooks well. 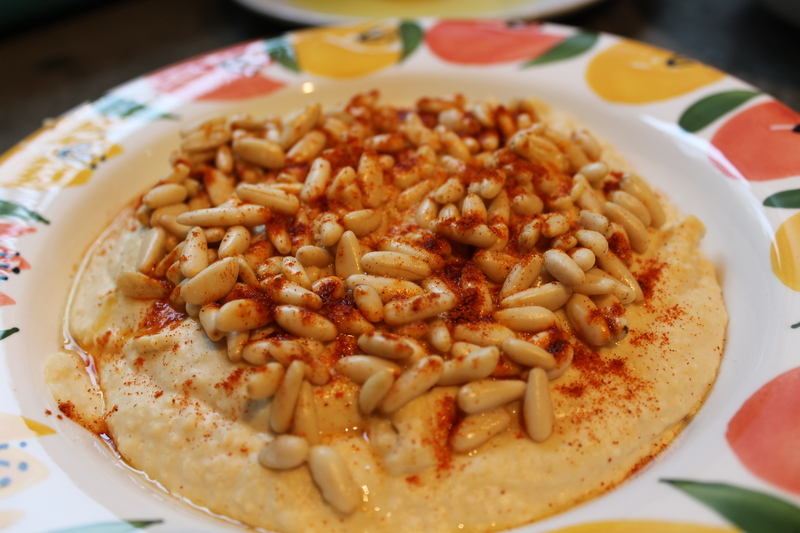 The first recipe I’ll show you is for Ful (pronounced “fool”) Mudammas (فول مدمس). It’s a breakfast dish made with fava beans. 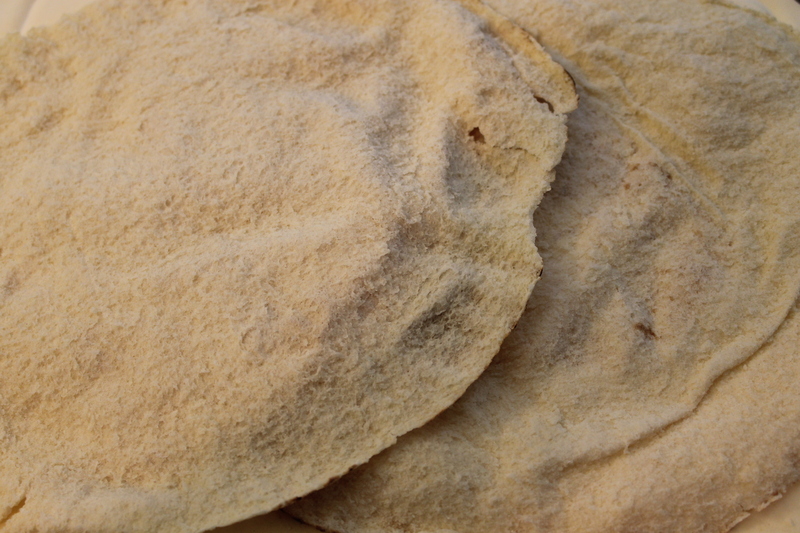 It’s a dish that’s been traced back to ancient Egypt and is still a very popular breakfast choice throughout the Middle East and parts of Africa. Now, I use the canned ones. However, if you want to use fresh or used soaked dry beans, it’s up to you. The ingredients for Ful Mudammas. 1. 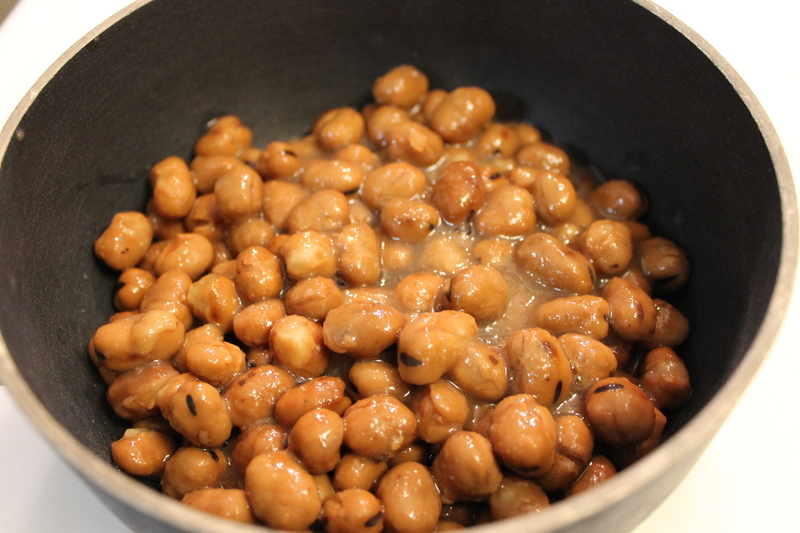 In a small saucepan over medium-low heat, mix together the fava beans, onion, garlic, peppers, about 2 – 3 tablespoons of the reserved liquid from the beans, and a pinch of salt & pepper. 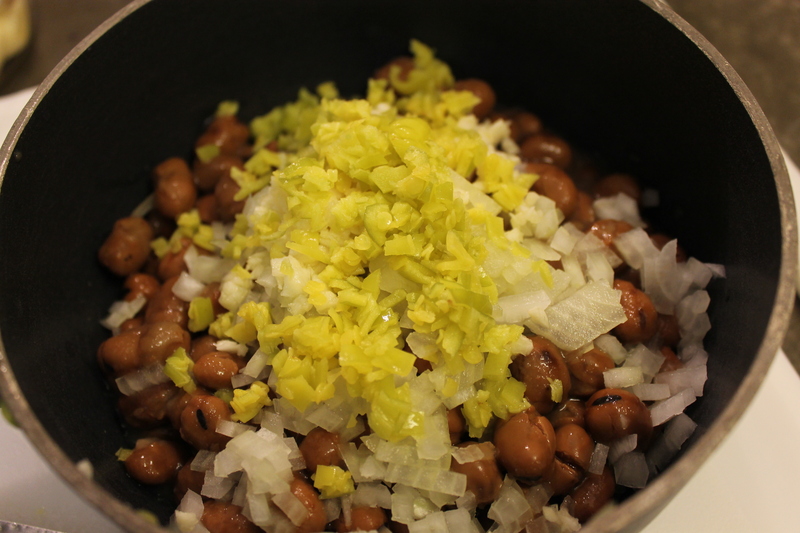 Beans, onion, garlic, and peppers ready to make magic. Heat the mixture slowly, stirring occasionally. Cook about 20 minutes. Add more liquid if the beans become too dry. Cooking the beans and vegetables. Be sure to not let the beans get too dry. 2. Once the mixture is cooked, taste it for seasoning and some lemon to taste. 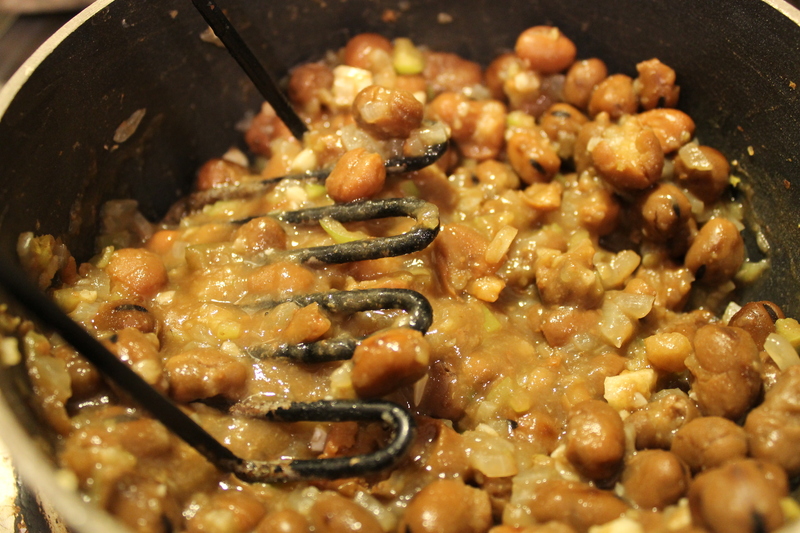 Remove the saucepan from the heat and mash the beans, leaving some texture. In other words, don’t make them a smooth mash. Mashing the beans. Leave some texture. Don’t make too smooth a mix. 3. 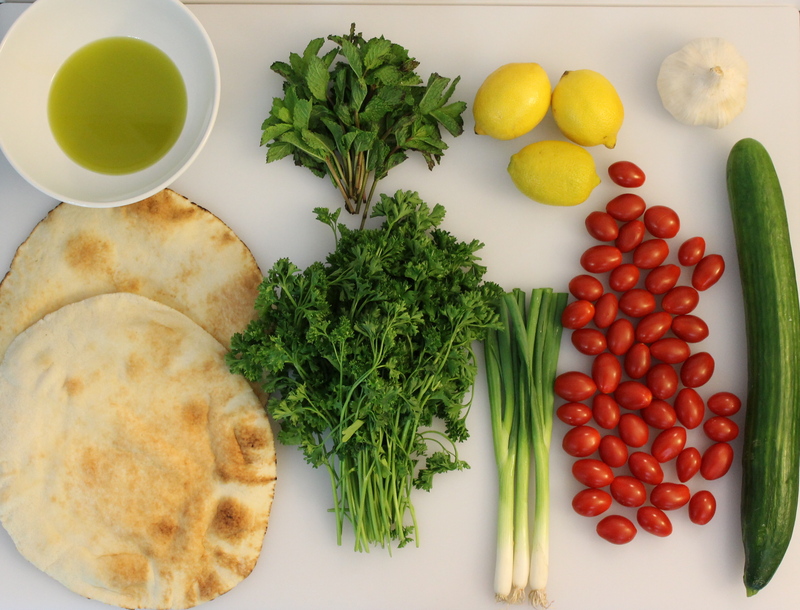 Place the ful on a plate, drizzle over some olive oil and additional parsley. The finished dish. Enticing, isn’t it. 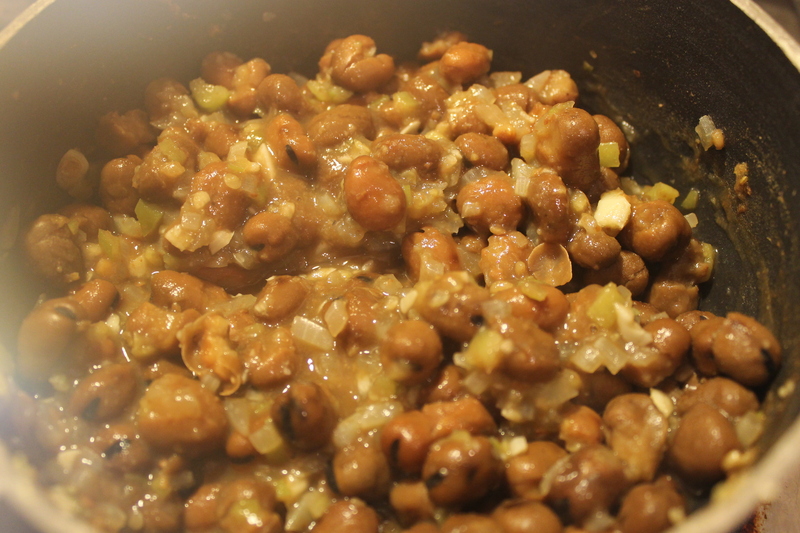 The next dish I’m going to show you is Baba Ghannouj (بابا غنوج.). 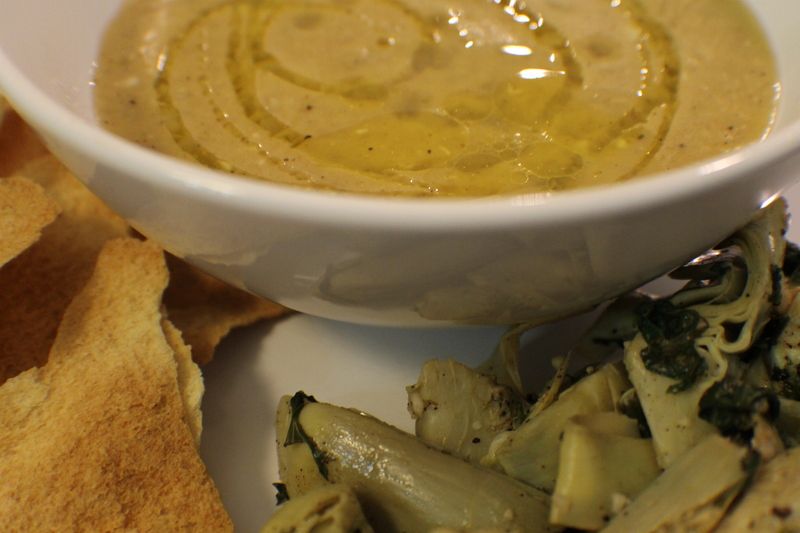 It’s a smooth dip made with eggplant. It can be served as a mezze, a salad, or a side dish. It is sometimes served with sliced or finely diced vegetables on top. Some will use parsley or mint. 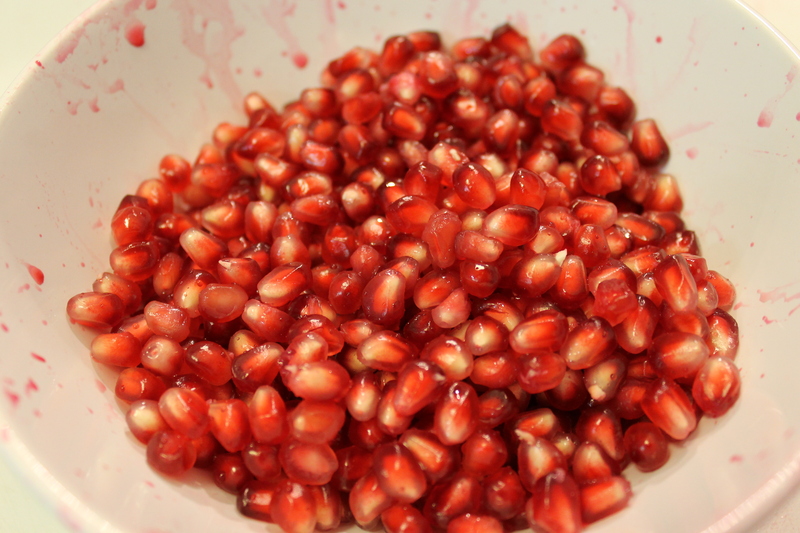 In some parts of the Arab world, particularly Syria, pomegranate seeds or syrup are used as well. 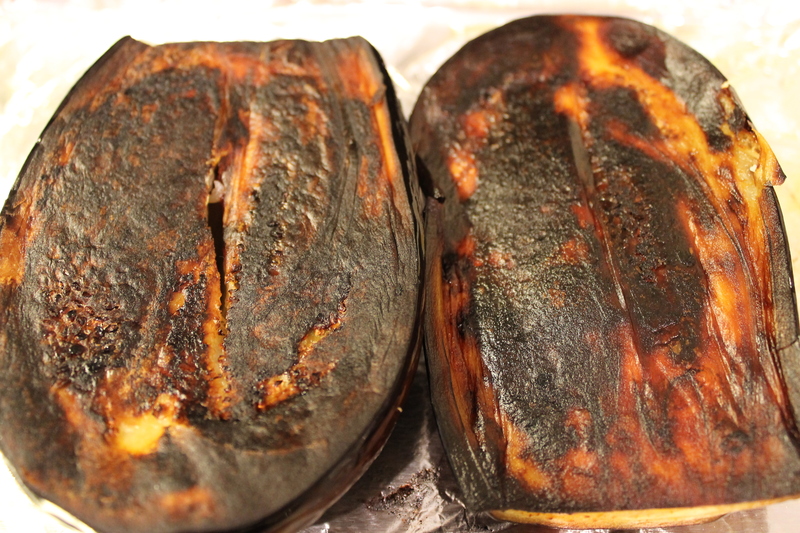 Traditionally, the eggplant is grilled over an open flame until it’s soft and charred. However, I’ve found the oven is an excellent alternative cooking source. When buying eggplant, look for ones with a smooth unblemished skin and no soft spots. 1. Prep the eggplant. Heat your oven to 400F. Line a baking sheet with foil and spray with non-stick spray. Drizzle some olive oil on the bottom and spread to cover. Take the eggplant, cut off the top, then cut in half lengthwise. The eggplant. You want the flesh to be white to off white. and firm. And not too seedy. A lot of seeds can make the eggplant bitter. Place the eggplant cut side down on the baking sheet. Drizzle to top with a little more oil and put in the oven. Bake the eggplant until it’s soft, about 20 – 25 minutes. Eggplant ready for the oven. 2. 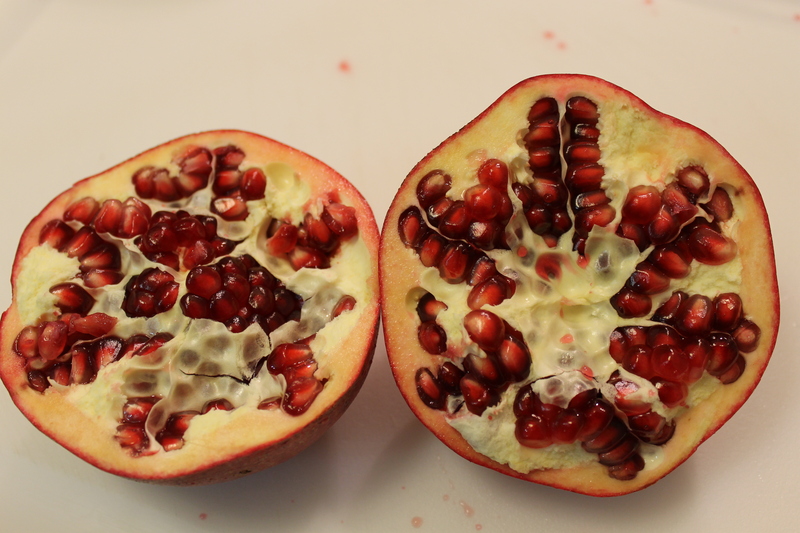 Meanwhile, if you are using pomegranate seeds, time to get the seeds out. 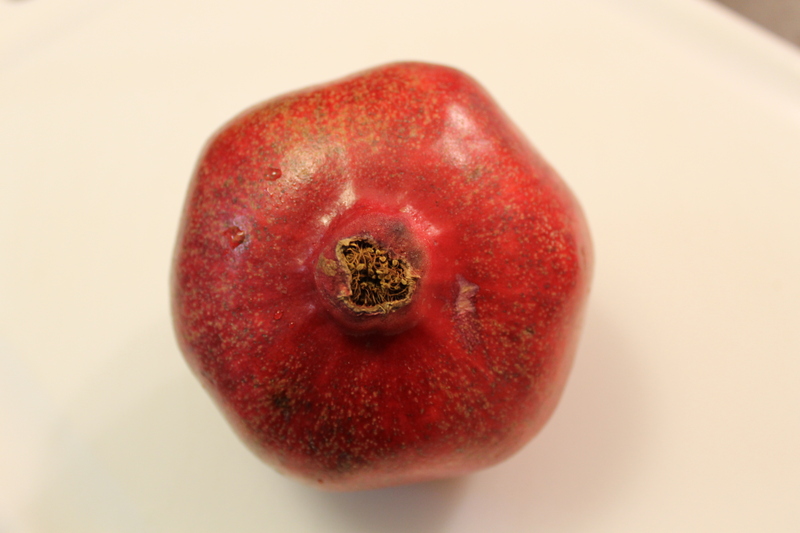 When buying a pomegranate, make sure there are no soft pots, the skin is smooth and free of blemishes, and be sure to check for pinholes in the skin. That’s a sign of infestation or spoilage. 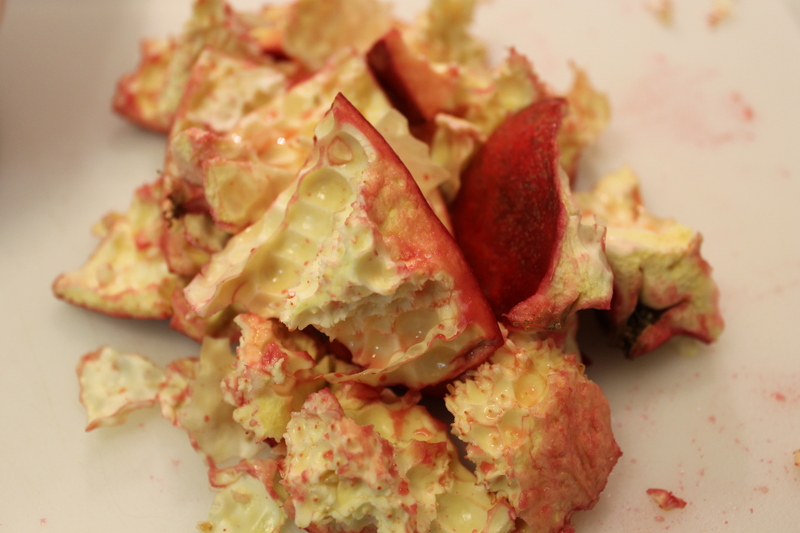 If you open a pomegranate and any of the seeds are brown or dried out, discard them. 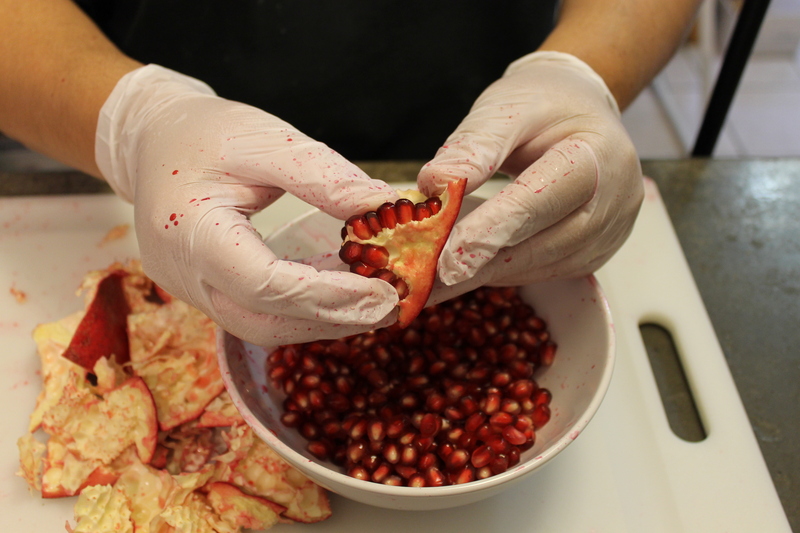 Cut around the equator of the pomegranate just until you break through the skin. Don’t cut all the way through or you’ll lose some seeds. Pull the halves until they separate. This takes a little doing, but it will happen. An excellent pomegranate. The seeds are bright, red, and juicy. The membrane is firm and a nice creamy color. I suggest wearing gloves for this next part. It is now time to separate the seeds from the membrane. It’s really not difficult. Just time consuming. if you can remove the seeds in clusters, all the better. The trick is to break as few seeds as possible and not include any of the membrane (edible, but very bitter). 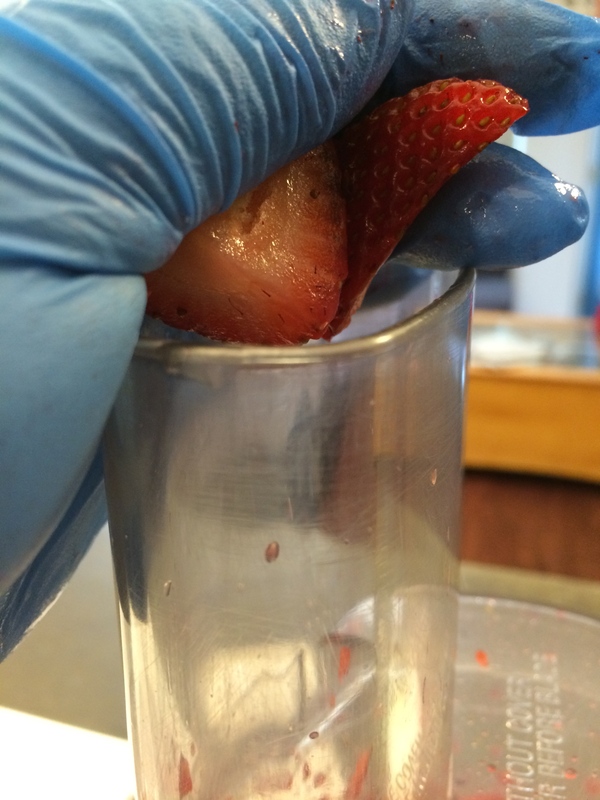 Removing the seeds from the membrane. Not difficult, but time consuming. You will be rewarded for your hard work. Your reward. They look like jewels. 3. Check the eggplant. Give it a quick poke with your finger or a fork. If it feels soft, it’s ready to come out of the oven. 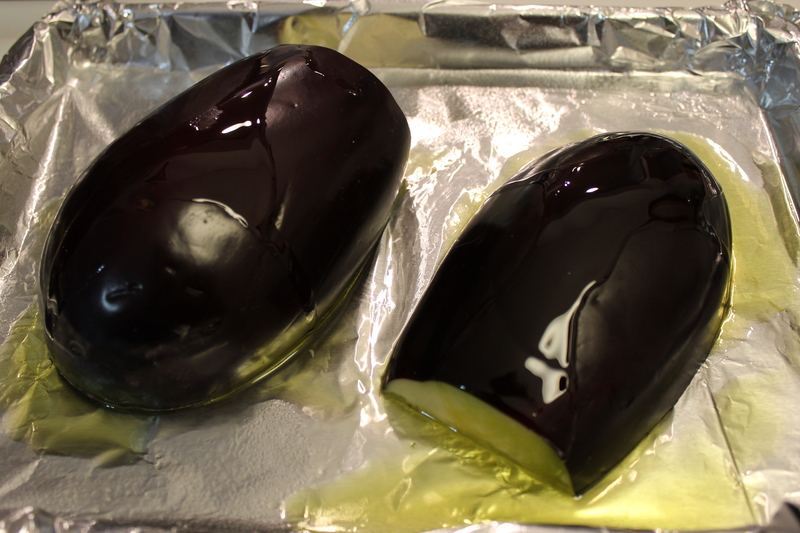 Take the eggplant halves off the baking sheet and set aside until cool enough to handle. The baked eggplant. You want the char. It adds a smoky flavor to the final dish. However, be sure not to let the eggplant burn. 4. when the eggplant is cool enough to handle, carefully peel off the skin and discard. Peeling the skin off the eggplant. 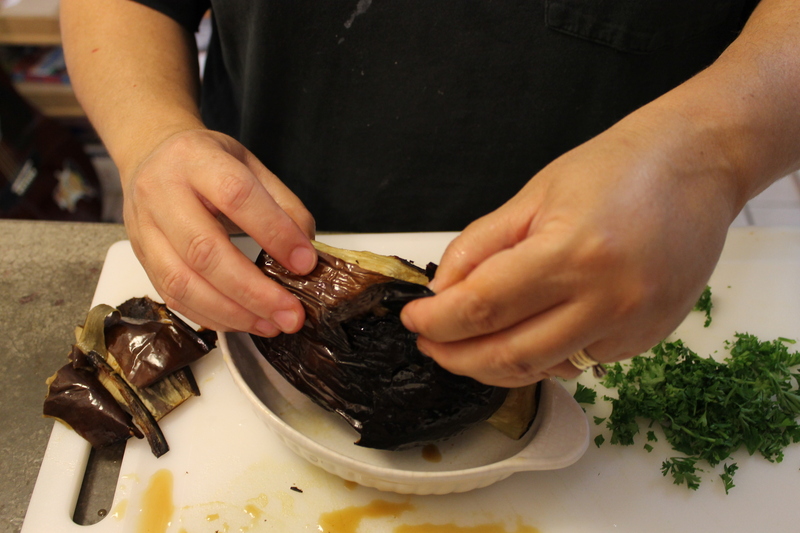 Place the peeled eggplant in a small bowl or dish. Set aside. 5. 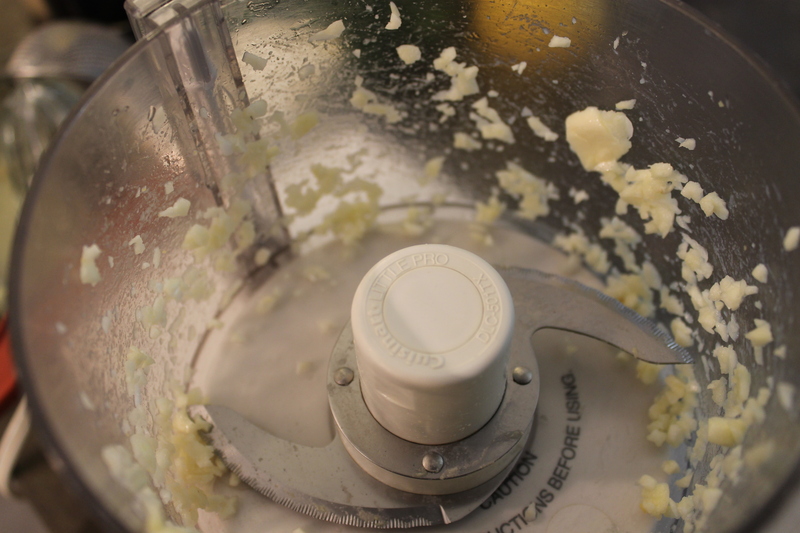 With a food processor running, drop the garlic cloves down through the feed tube and chop them. 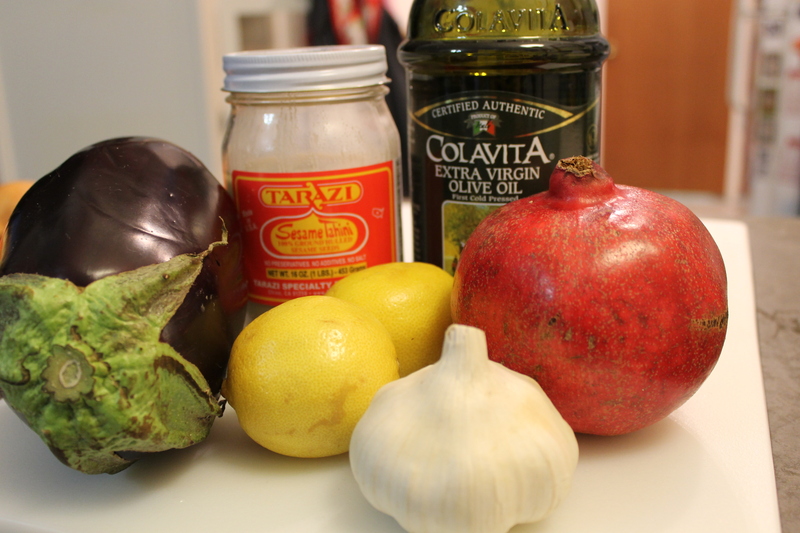 Add the eggplant, tahineh, and a little salt. Puree the ingredients until a smooth consistency is achieved. Add a little lemon juice through the feed tube while the machine is running. 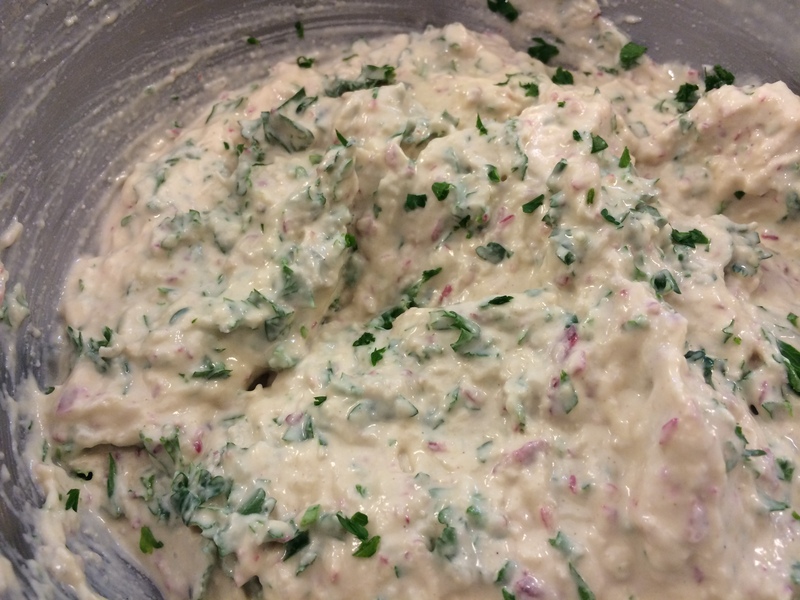 When the lemon is mixed in, taste the baba ghannouj for seasoning. 6. 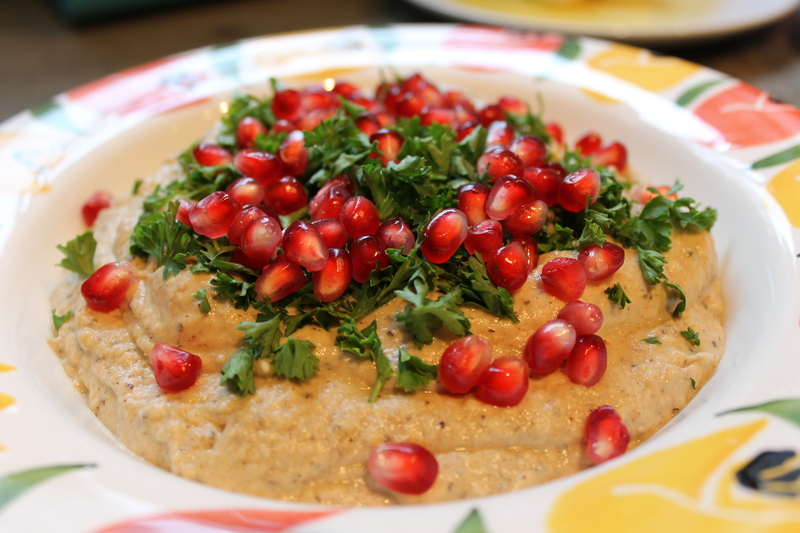 Place the baba ghannouj into a bowl and garish with a little olive oil, some parsley, and a few of the pomegranate seeds. This is delicious. And I don’t like eggplant. 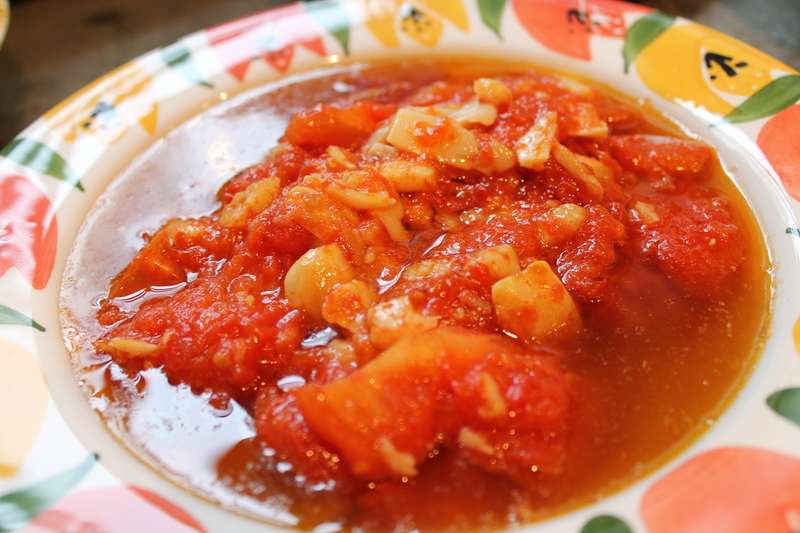 As for the Poached Tomatoes and Garlic, I really don’t know if it’s an authentic part of the meal. However, I remember my dad making this dish from time to time, so I do, too. My husband and I like this dish, so I make it for that reason as well. 1. Place all the ingredients in a large skillet or shallow saucepan over low heat. The ingredients ready to be poached. 2. While the ingredients cook, you can mash them a bit if you like. 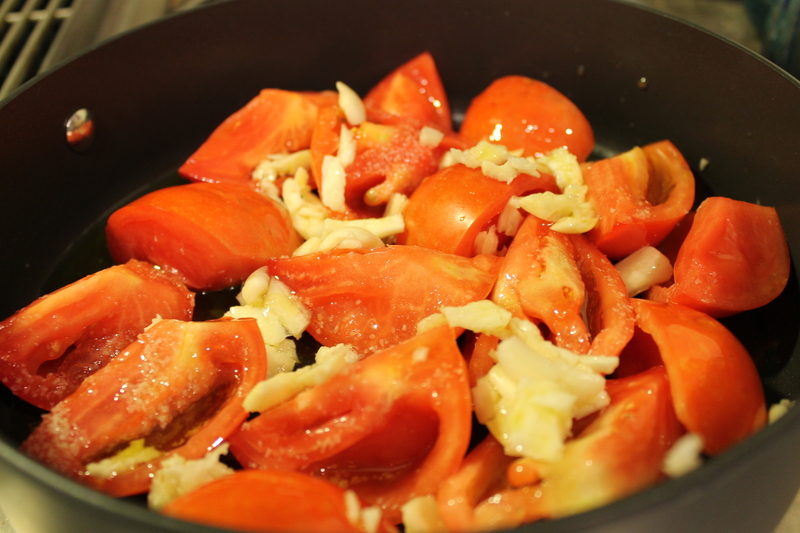 Just cook until the tomatoes have completely broken down, about 30 minutes. 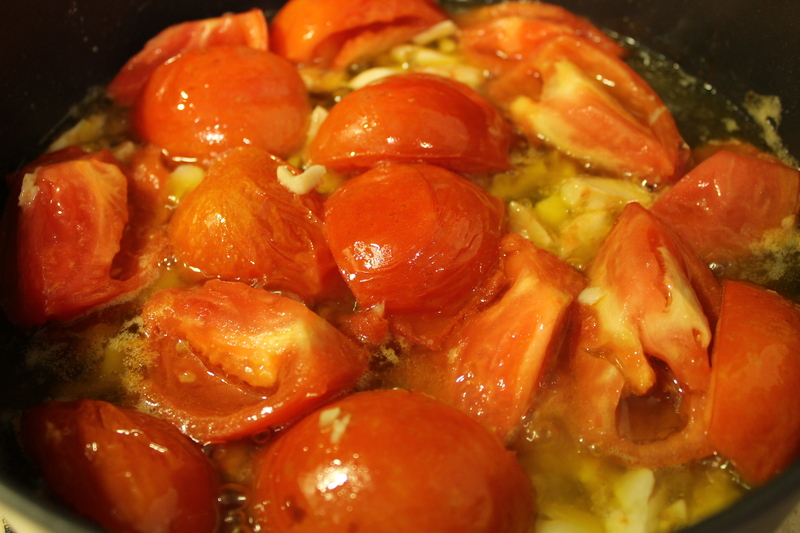 Cooking down the tomatoes and garlic. All done. Yes, it’s a lot of olive oil. It tastes lovely. 1. Take a few pieces of the Nabulsi cheese and cut them into smaller pieces (I usually cut them in half crosswise and then again lengthwise). Place them in a bowl and rinse with water several times until it runs clear. Let the cheese soak in the water to remove some of the salt. Some of the cheese. The shape and saltiness of the cheese depends on the brand. 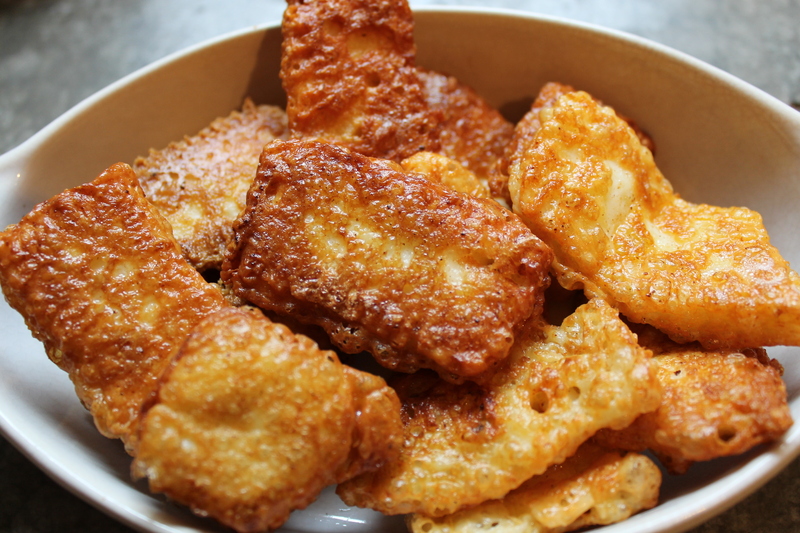 Before you get ready to fry the cheese, take it out of the water and drain on paper towels. 2. In a non-stick skillet over medium-high heat, melt 2 tablespoons of butter with 2 tablespoons of olive oil. 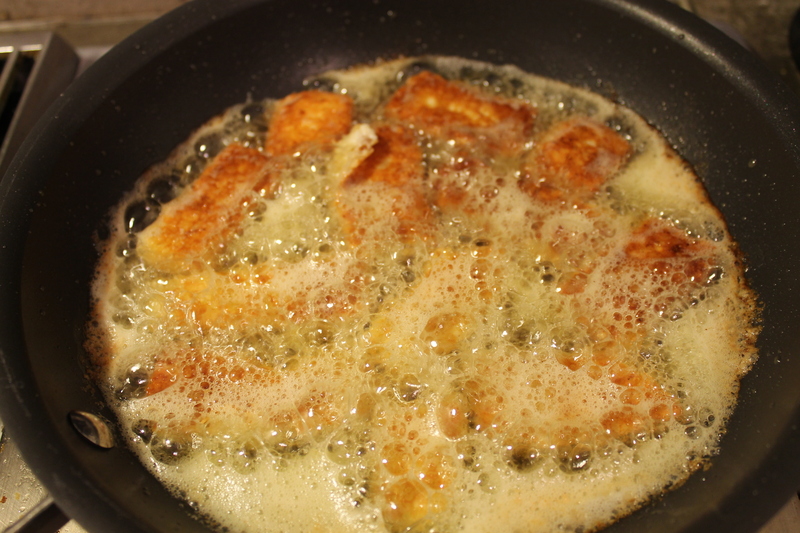 Once the butter starts to foam, place a few pieces of the cheese in the skillet to cook. Cook until each side is golden brown. Frying the cheese. Not the most healthy way to cook it, but hey, why not? Drain the cooked cheese on paper towels and eat while still warm. It doesn’t really keep once it’s cold. Believe it or not, this is excellent on warm pita bread with a little jam. The bread. The most indispensable ingredient of all. And, here is the final table. The final table. Invite a few friends.